What a great day and night Halloween was this year! I always worry about the weather being too cold, rainy or windy, but not this year. We had some sun, no wind and it wasn’t terribly cold! 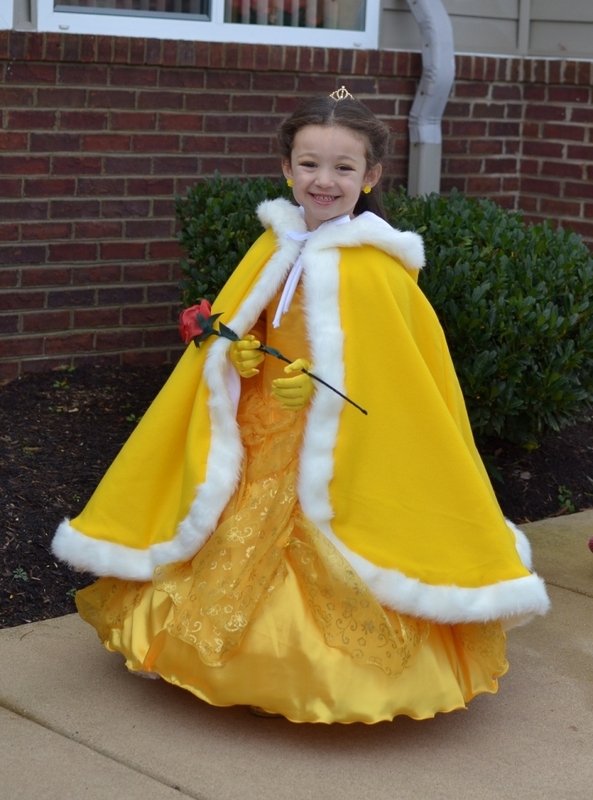 Since Maysa saw her sister perform in the dance performance The Beauty and the Beast, this past summer, she’s wanted to be Belle for Halloween. 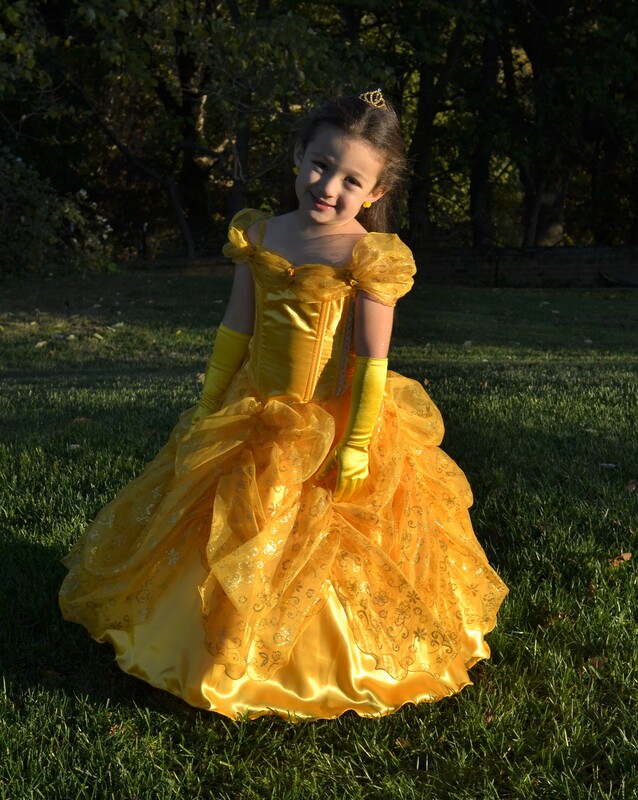 We’ve been working on her costume for a long time but we did it. 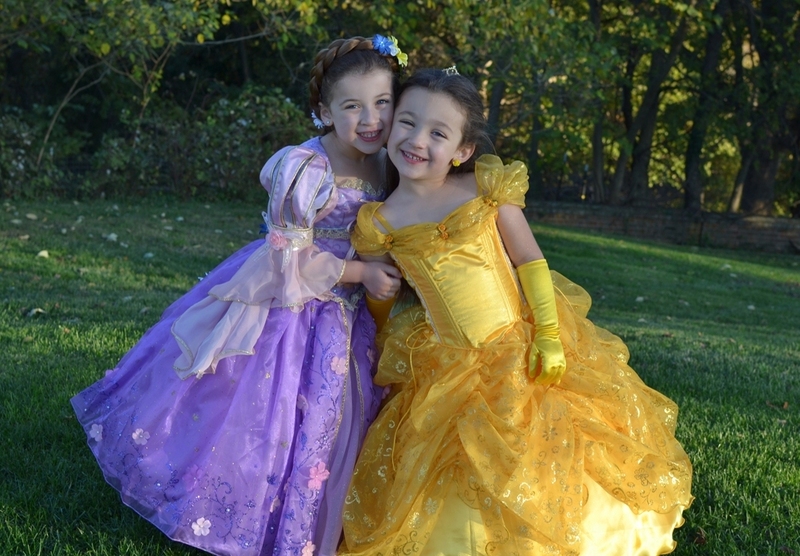 Maysa was Belle for Halloween and her sister was Rapunzel, so once again, my princesses were princesses, and once again, they were fit for it. I also love this one. 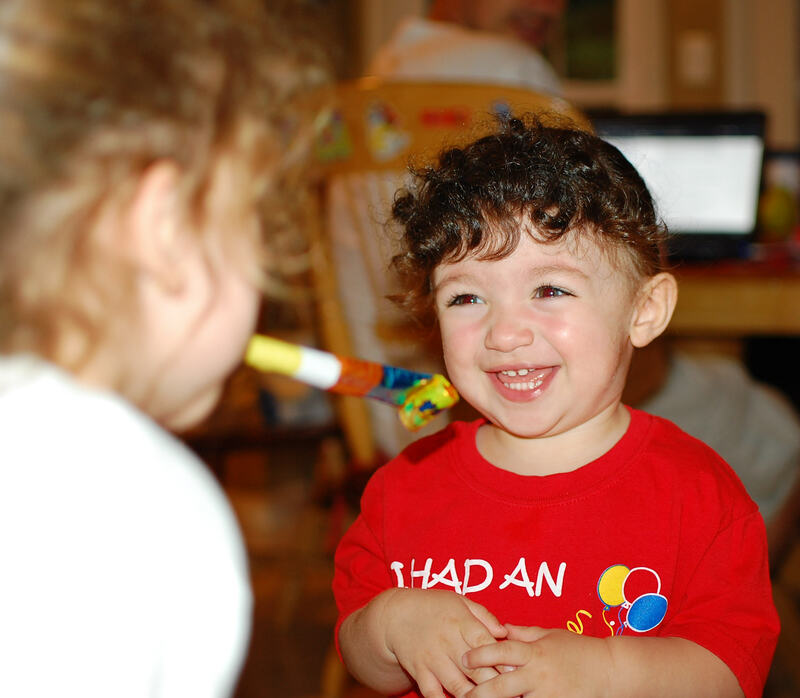 Maysa was giving us silly smiles and her sister couldn’t stop giggling. Love it! 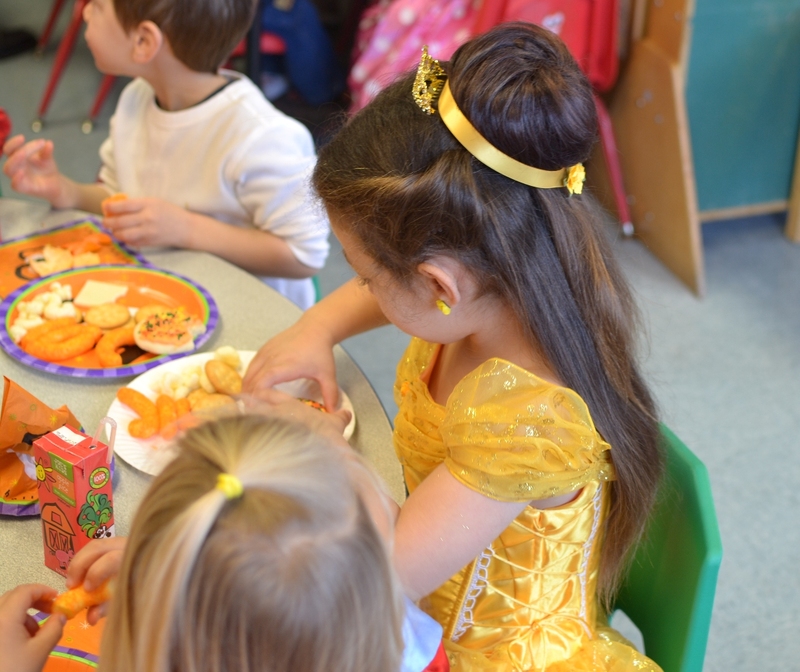 The next morning, it was Maysa’s Halloween parade at her preschool. 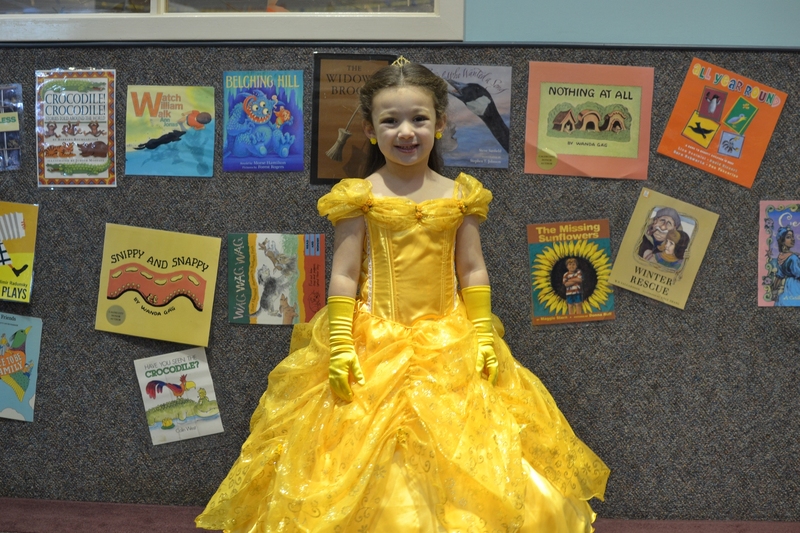 As one of her teacher put it, she was the Belle of the Ball. 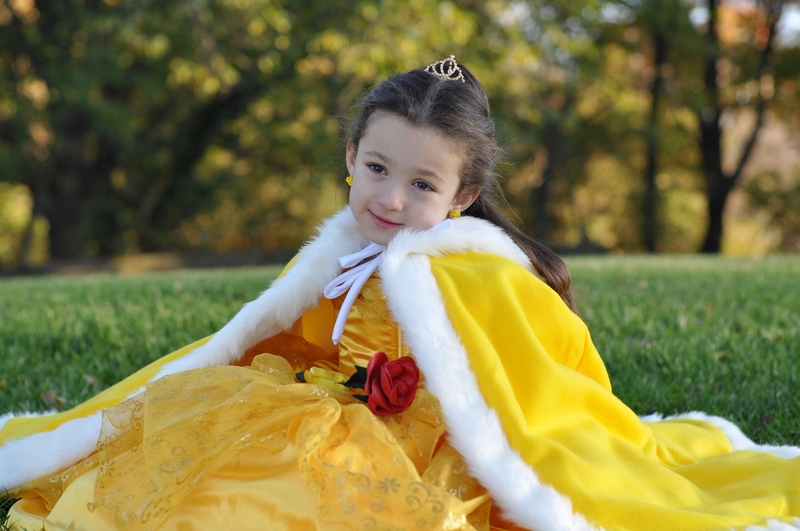 She wore her cape as they paraded on the street and smiled the whole time. 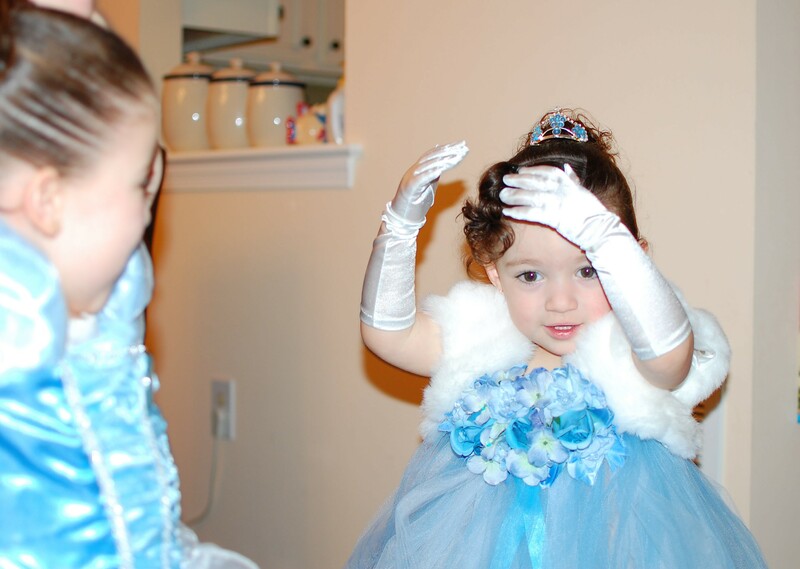 She also posed for pictures, waved and twirled, just like a real princess. She loved it, and well, so did I! And here is one last one to show off her perfect Belle bun. I did it myself. Not bad huh? I haven’t posted in a long time and I need to upload a few pictures of Maysa now who just turned 3.5, but for now, I’ll just give an update on our visit to the eye doctor today. It was short and sweet. 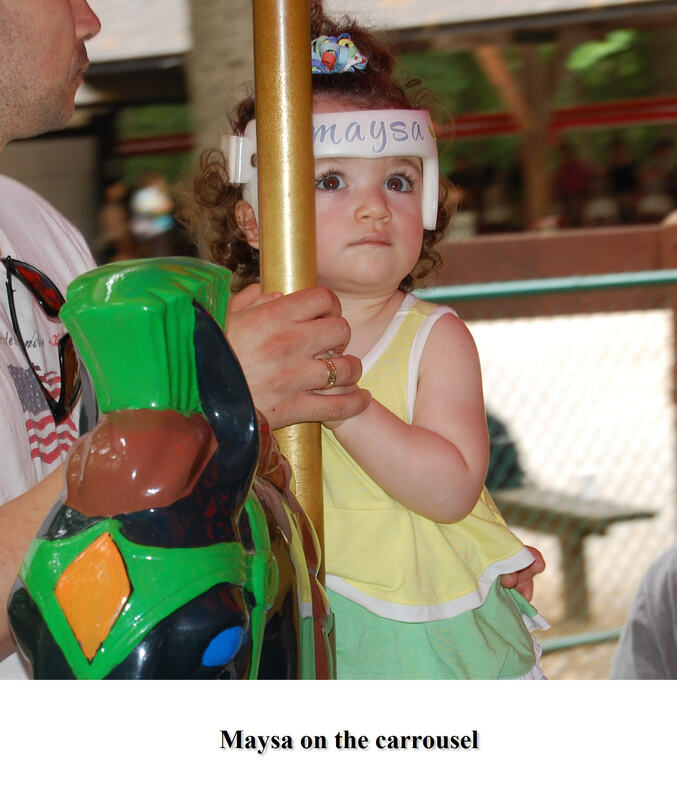 Maysa’s vision is still great and while she still exhibits signs of exotropia, she seems to be more aware of it and as a result, seems to think about it first. I cannot say that it has gotten worse at all. In fact, it seems to be a tiny bit better. Again, I am not sure if it is because we fuss at her each time she does it and therefore tries to not do it or if it is because it is getting better on its own. We go back in 6 months. I’ll write more about what I think that prominent metopic suture is when I can post some pictures of her now. Ok, so back to the point now. Dr. Territo played another few “games” with her very similar to the ones he used last time. He also asked me whether or not I thought things had improved, worsened or remained the same. From what I can see, Maysa’s eyes still wander off when she is “thinking away” which means when she is thinking about or talking about something that is being pictured in her head. Her eyes are not focused on anything in particular. It is all happening in her mind. The moment you call for her attention, she refocuses right back on you or a specific object. He saw the same thing as well. The doctor also said that her vision was perfect and that there was no weakness in neither one of her eye muscles. He said that the fact that she has the ability to refocus on her own were all good things and didn’t think that she was a candidate for patching. He also said that she is far from being a candidate for surgery. 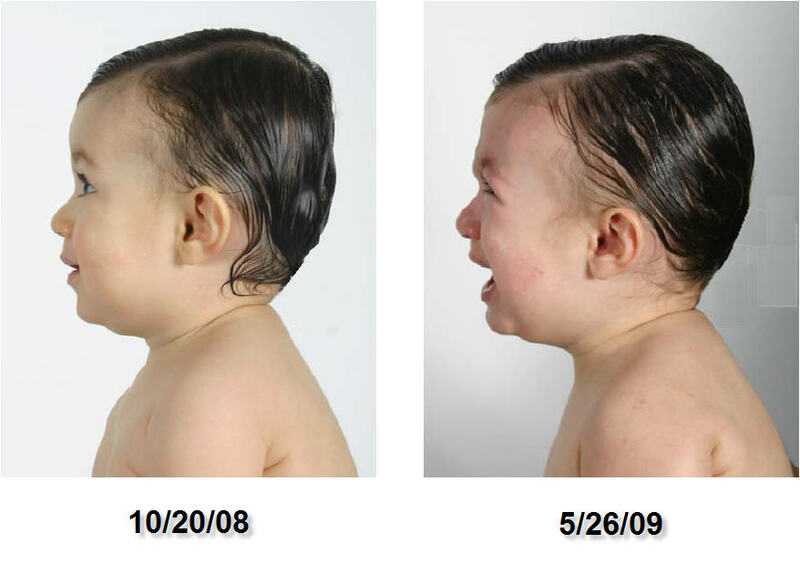 Dr. Territo also said that often people with a history of plagiocephaly/brachycephaly exhibit signs of strabismus and that people with this condition often learn to control it as they grow older. Shame on those who think that it is only cosmetic! So what are we left with? Another appointment, 6 months from now, to see how things are progressing. Maysa will be 3 and a half then. 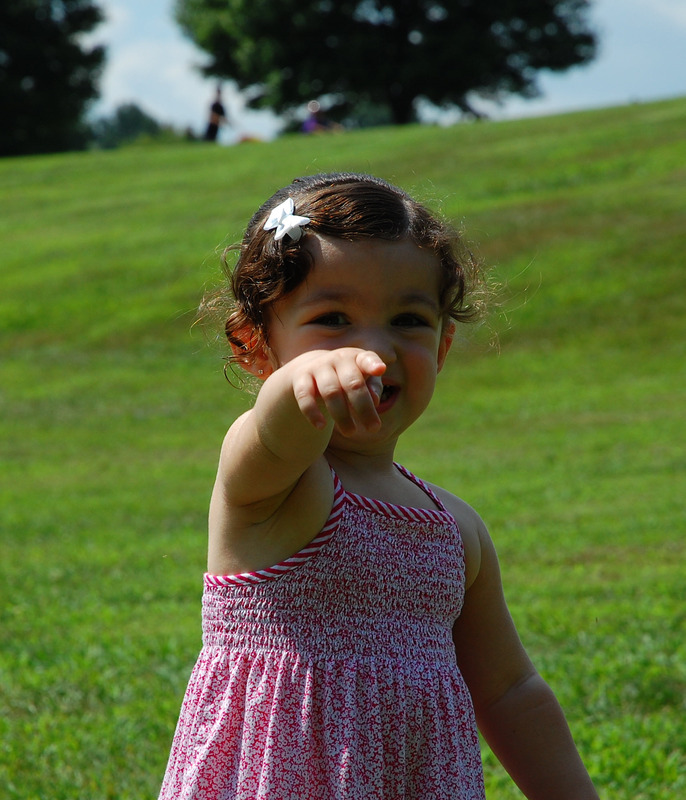 Somebody in Central MA loves me, my Maysa, and a lot of other babies in the Metro DC area. Whoever you are I love you too and THANK YOU! I am thinking what now? What is Joe Terpenning sending me this time? So, I go on to the next two pages only to realize that this one is really not addressed to me but to Joe Terpenning himself. It is available to the public on the web. Here it is: http://www.fda.gov/ICECI/EnforcementActions/WarningLetters/ucm234347.htm. If you’ve been following Maysa’s story and wondered even a tiny bit if any of what I wrote was ever a little bit too much, then you have got to read this letter. The FDA actually paid his firm a visit and the warning letter that they issued as a result is a loaded three page document. Needless to say that I knew nothing about it until yesterday. I feel vindicated. Happy Holidays! Thinking about it, I feel like Pride and Joy should be my girls’ real given names, though I wouldn’t know which to call Pride and which to call Joy as they both jump in and out of one and into the other all the time. This post comes in a little late as Halloween has come and gone and Thanksgiving is just around the corner, but I had to wait for my pictures to get in the mail to be able to post. Again this year, we had Jennifer Wells (another plagio Mom and awesome photographer) capture these special moments. This year, the girls were royalty in their handmade velvet gowns trimmed with gold and sequin accents. 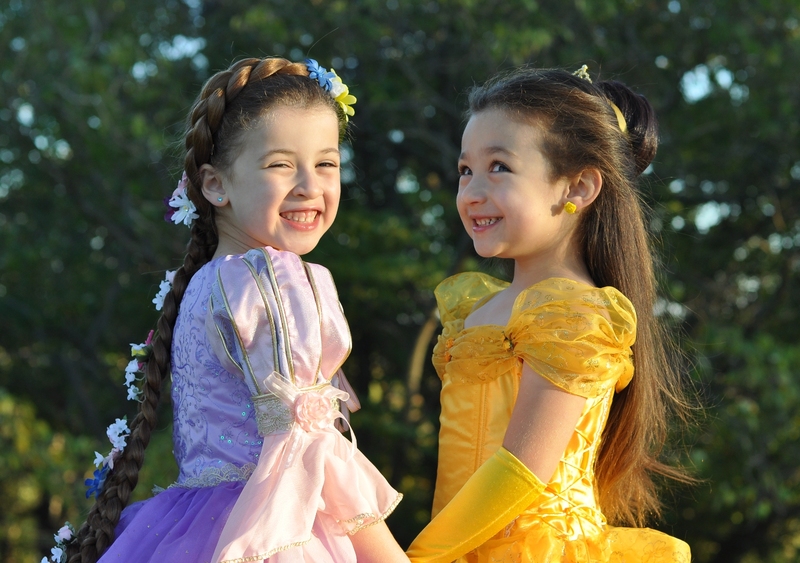 They had necklaces, earrings, bracelets, a head piece and even golden shoes to match. 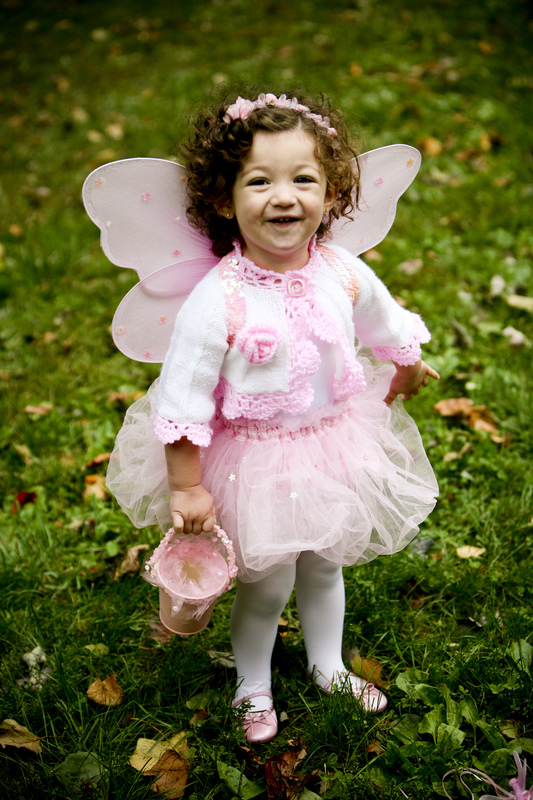 Just plain precious, don’t you agree? 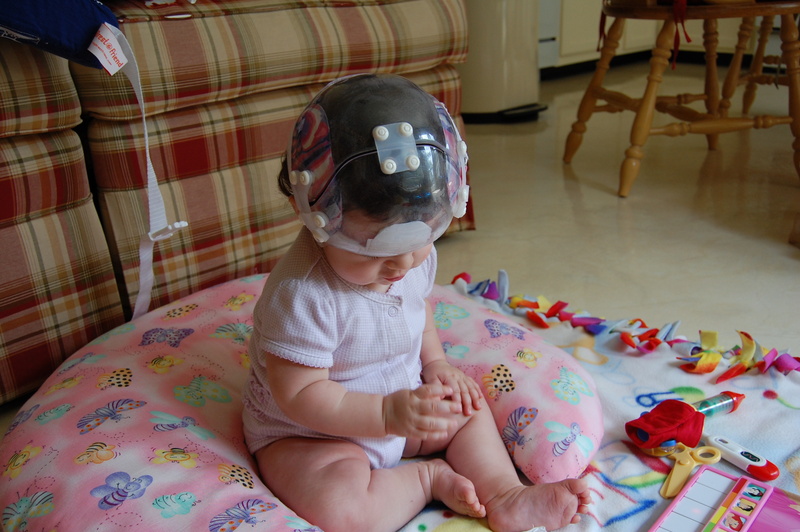 We often read on plagio boards how plagiocephaly and brachycephaly can affect vision among other things. Has anyone noticed such problems in their child? While Maysa’s eye doctor doesn’t seem too alarmed yet, I can’t help but think that her exotropia might in some way be linked to her plagio/brachy history. For those of you who don’t know what exotropia is, it is a form of strabismus where one or both eyes tend to look outward away from the nose. Maysa does that on occasion, if she is looking away, day dreaming, or thinking about something. Maysa is not one to look at you in the eye if she is talking to you. She will get your attention and once she has it will start talking to you without looking at you. Often, when she does that, she will show signs of exotropia. I never gave it too much thought. We all day dream, right? And I often see people with the same look on their face (especially during long meetings or while waiting in a waiting room…). 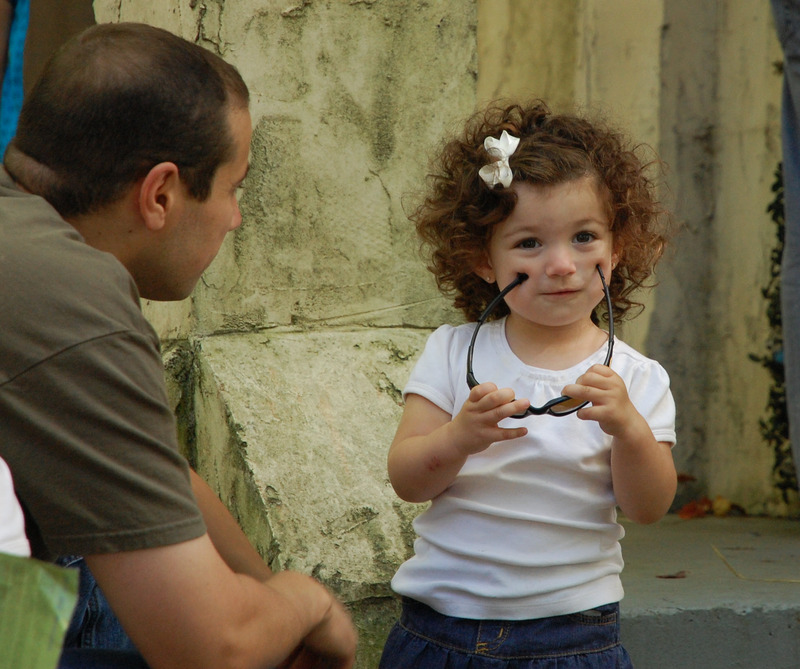 However, her daycare provider brought it up to my attention, so I took her to the eye doctor for a consult. He was able to see what I see and said that she seems to do it more with her left eye over her right one, but that if prompted to, she could easily refocus on one object. He didn’t see any weak nerve or reduced vision. Heck! She could identify pictures that I couldn’t during the examination. He let us go without any treatment (yet) but wants to see her in another 3 or 4 months. 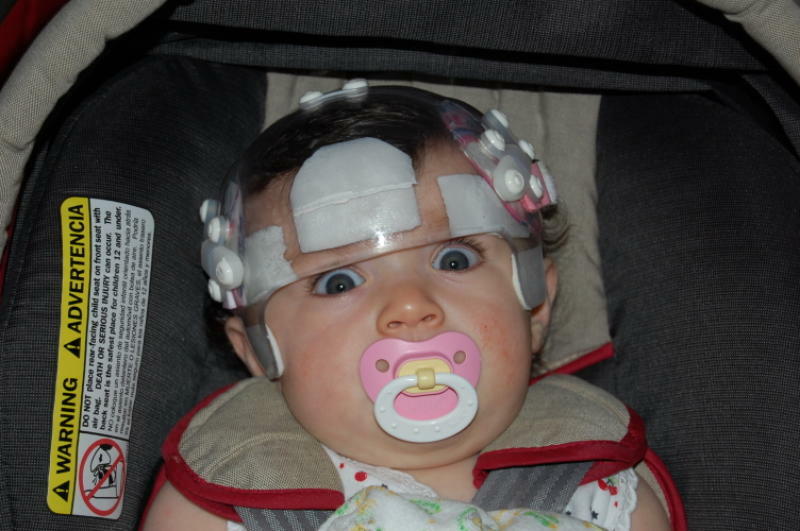 There seems to be some studies out there that link plagiocephaly to strabismus. Anyone out here with a child who is showing signs of it? One I read says that since by 6 months most of babies vision is developed, skull malformation at that age could be a contributor to strabismus. For the first time over the weekend, while Maysa was going down to sleep, tossing and turning as she always does before she finally drops, she actually sat up on her bed and said to me: “Mommy, can you fix my hair. It bothers me”. You guessed it. I had her hair in a ponytail that wouldn’t budge. The same ponytail that kept her off her back for about a year now. I quickly took it apart and fixed it a little higher on her head. When I asked her if it was better, she said “Yeah”. Within 5 to 10 mn, she was fast asleep. I, however, kept thinking about it. It is hard to sleep on a tight ponytail. I say so because I couldn’t. For about a year post graduation, she’s had to (a little less lately, but still). Last night, I kept telling myself that her head has kept improving, that while she can’t comfortably sleep on her back because of it, she can still sleep on her tummy and sides and sleep the whole night through. I guess I wish that it never bothered her really, but her saying so made me feel a bit sad. So this morning, looking at her head once again, I can’t tell you how happy I am with the way it looks. She has come a very long way and I still believe in further improvement. I guess, soon enough she’ll figure out how to loosen that ponytail and it won’t be an issue anymore. Just sharing along the way. Left Profile: Here are some comparison pictures where I cropped her pony tail and the background to help focus on the actual shape of her head. In this one, I feel like the base of the back of her head is where her head has rounded out the most lately. It has gotten deeper too, there is no doubt. 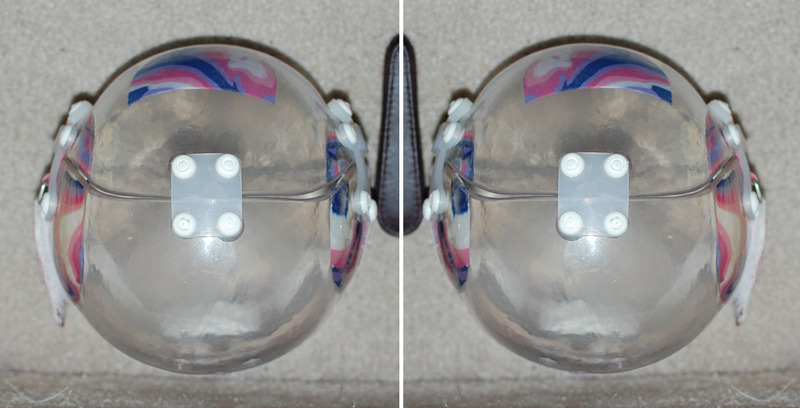 Top View: In the following, I am comparing her head from July 2008, when she was in the Kidcap to now and from this past January when she got her last starscan to now. She’s improved dramatically from July 08 till now, but look, it seems that she’s also improved in the past 4 months! Click on the pictures to zoom into them and look at the measurements on the rulers. Front View: I couldn’t get a good shot of her front view but I found these two pictures pretty comparable. Her face has gotten longer and as a result, it doesn’ t look as wide. Also, the reverse pear shape is less noticeable to me. I couldn’t get a good right profile shot but even from that angle, things look pretty good. What I was able to get instead is a back right side picture that shows how nice and round her head is there. I hope that this post gives hope to all parents out there wondering if things can actually get better post banding. It has for my Maysa. 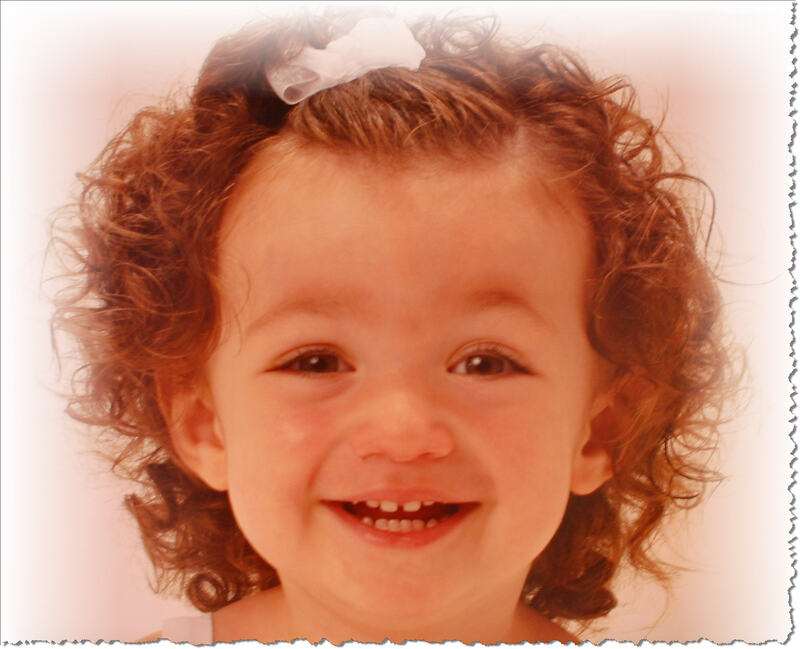 Thank you Amber and the team at Cranial Tech for helping reshape my little girl’s head. I will always owe you! Baby Miguel was back here last week. His daddy and mommy brought him. I didn’t know they were coming again and I didn’t have my camera, but we figured out something else using a Flip camera. So, here is how his helmet looks like on him. Now, look further down and see how Maysa’s helmet from ECA looked like on her. Apples and bananas, I tell you! On a somewhat similar note, a co-worker’s daughter brought in her son yesterday. They have been suspecting that he has a “flat head” as well but weren’t sure. I actually got to meet the other little guy and fair enough, he showed textbook characteristics of brachycephaly to me. I gave mom lots of advice and recommendations as the ped she saw said that it will round out eventually… I know the story too well, I told her. I saw Baby Miguel on Friday. His daddy brought him to work. 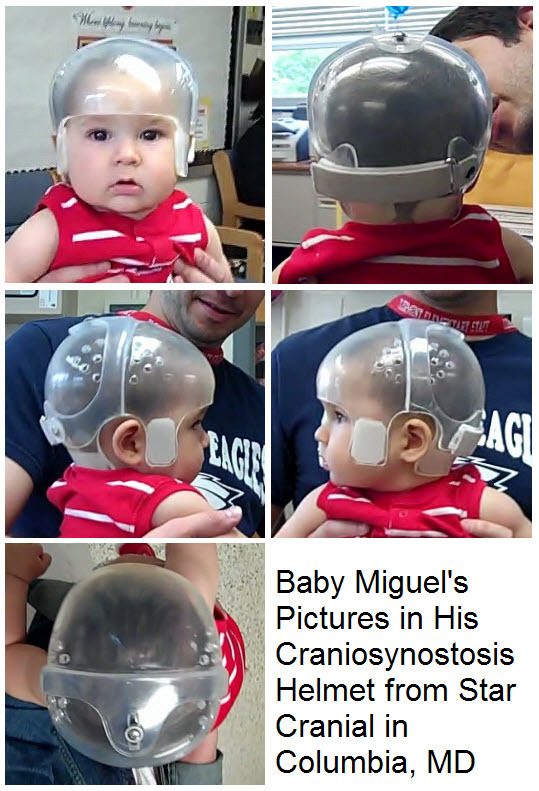 Miguel is 6 months old and has/had craniosynostosis. 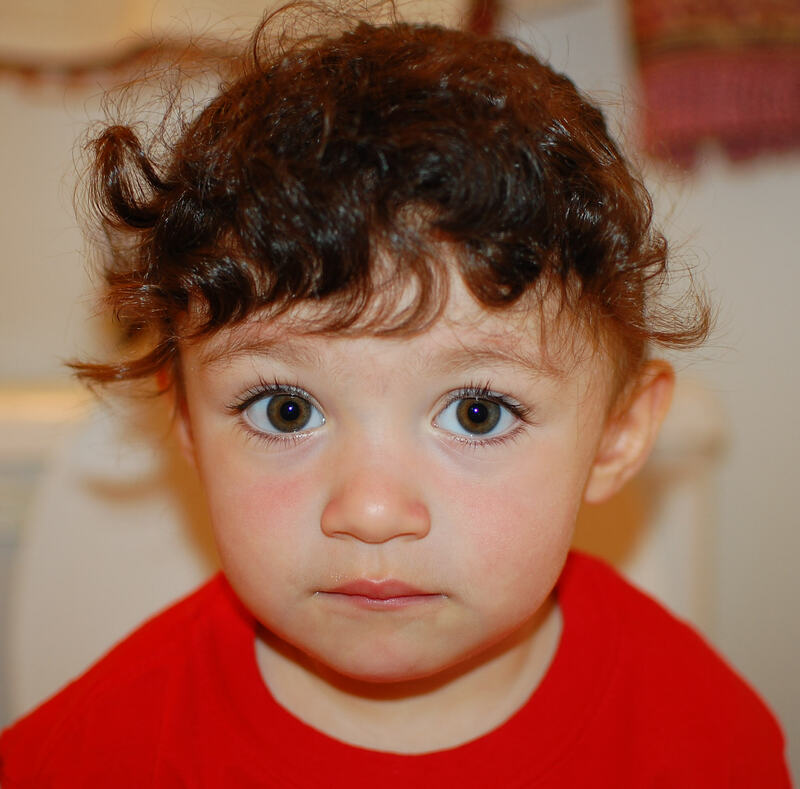 Despite his parents concerns, he went undiagnosed by his pediatricians for a long time. When his daddy first told me that he was going to have to wear a helmet, the clear type, I got worried. Then he explained to me that he didn’t have plagio or brachy and that post operation, he would have to wear one of the clear ones from Starcranial in Columbia, MD. I felt much better then. I have nothing but good things to say about that place and the people who work there. I knew that as long as everything went well with the operation, he would be in good hands with Laura Plank and Orthomerica. So, it’s been just about a month since Miguel got his helmet. When I saw him on Friday (unexpectedly), I had to hold him and give him an extra special hug. Of course, after drooling over his cute little face and chubby puffy cheeks, I checked out his helmet. It was a beautiful helmet. The shape of that helmet was flawless. It camed down just barely above his eyebrows. The contour around his ears WAS traced right around his ears. It came ALL THE WAY down to the base of his neck. It was beautifully and perfectly ROUND in the back and just the right width and length. A perfect ratio! It also had a few holes and the pads (two at the sideburns and two in the back were extremely soft and clean). Really, I almost cried I was so happy to see him wearing such a well-fitted helmet. I haven’t seen Miguel’s latest scan. Daddy keeps forgetting to swing it by, but from what he told me, he’s made great progress already. To tell you the truth, when daddy took off the helmet for me to look at, Baby Miguel’s head looked pretty darn good to me! He needs to grow in width a little more, but considering his age, I have absolutely no doubt that nobody will ever be able to tell that he’s ever had surgery or that he had to wear a helmet (for a year, they are saying). Maysa had a combination of brachy and plagio which means that her head was too wide, not long enough in the back and that it was also asymmetrical. Maysa’s head was wider right above the ears. 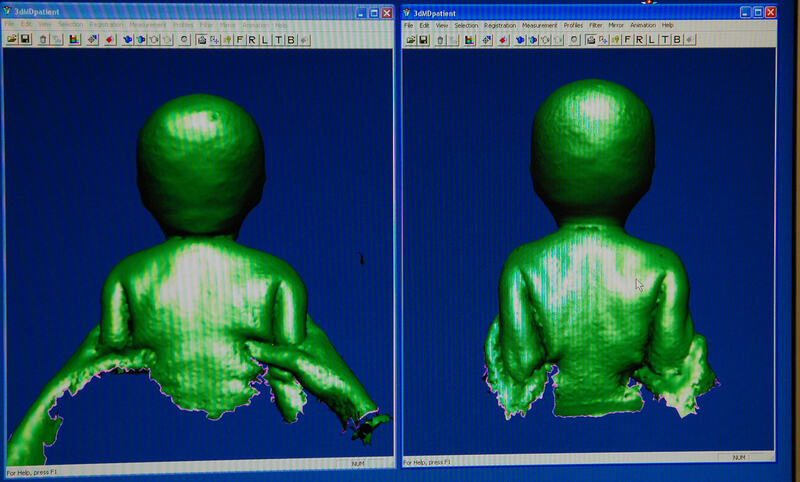 The entire back needed to pop out and the back right side needed to fill out more than the left to reduce her asymmetry. You are probably wondering about that big space between her left ear and the helmet. You are also probably wondering about how uneven it looks in the back and about how high it sits on her head looking at the back also. Doesn’t look like it was made for her does it? Mind you, we expressed our concerns to him but he always assured us that she was making good if not great progress. As for the big gap above her ear, he said that there was one big bone plate there and that there was no way her head would just grow out in that one spot because on either side her head was covered by the helmet. What a bunch of non-sense! Shouldn’t that have been my red flag? Shouldn’t that be everybody’s red flag? I am not an expert by any means but those pictures speak volume to me now and a competent orthotist should be able to tell you that there is more than one thing wrong with these pictures and act accordingly. First of all, we didn’t see Laura Plank so the reports that I have do not reflect a comparison between now and her April scan. The orthotist we saw was really nice and compationate and we actually didn’t have to pay a penny for the time he spent with us or the reports he handed us. Right before he scanned her (and Maysa was screaming her lungs out and mad at the world) he told us that because of the thickness of her hair we were most likely to see a flat area on the scan. To tell you the truth, I thought he was going to say that he wouldn’t be able to scan her BECAUSE of her hair. Also, remember that Maysa’s flat spot was never on the back left side but rather on the back right side. So, in other words, ignore the flatness you see in the level 3 report. At home, when I overlaid the scans (January and April), I found that the January scan was a little bit off-center, a little too much to the right and that is probably why her right side looks fuller than her left in that one. So, first of all, I removed some info at the top and added in the “Shape 2” column her numbers from the April scan. Again, as you can see, she grew over 2cm in circumference. She only grew about 1mm in width and almost 10mm in length. Her plagio also got slighty better, although in real life it looks even better, and most importantly her cephalic index is down to 88.4% at this level (Level 3). You might also be wondering why her ears look funny. That is because her hair was sticking out a little on the right hand side. The cranial breadth changes at that level but the orthotist told me that it was mainly because of the ears that show at that level. One thing I am still not sure of is where her head actually grew in length. When I overlay the April and the January scan, most of the growth seems to have happened in the front and a little bit in the back. I never thought that her head would grow that much up front. 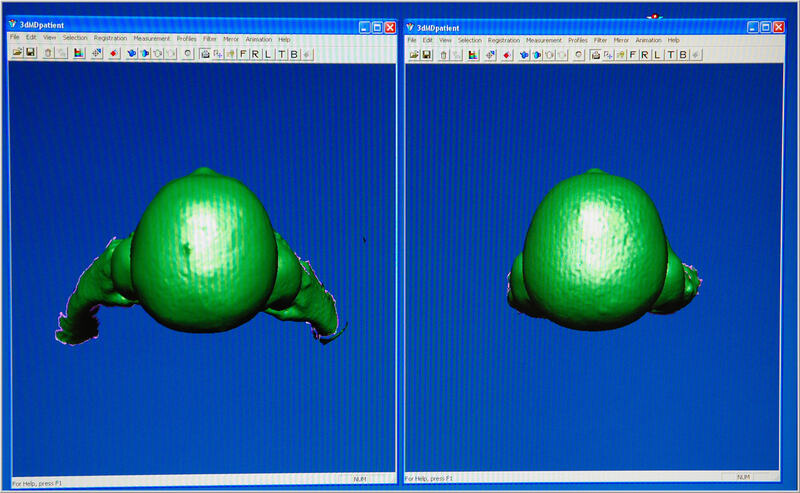 It is hard to say because the center point of the two scans are a bit off center. That is really matter: No. What matters is that we have an oval looking head that is not flat anymore with such little asymmetry. Can you believe that the report below belongs to Maysa? That was over eight months ago. 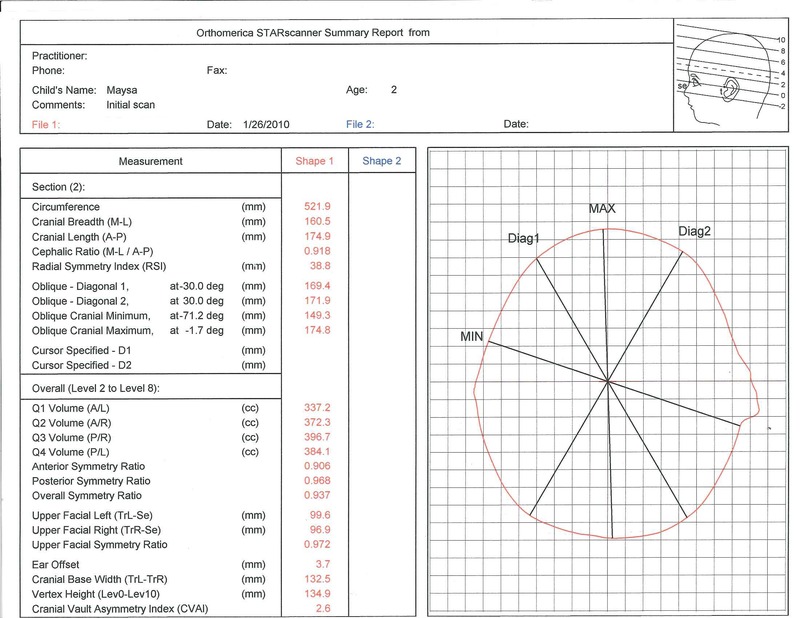 Yesterday, Maysa went for one more scan, and what we got on her report this time was far better than what I expected, although if you look at my post The ruler, you’ll notice that I was actually right on the dot as far as what I thought her measurements were. The bottom line is that at level 3, her CI is now at 88.4%. That is a drop of 4.6% eight months after treatment in a child that is now 2 years old. 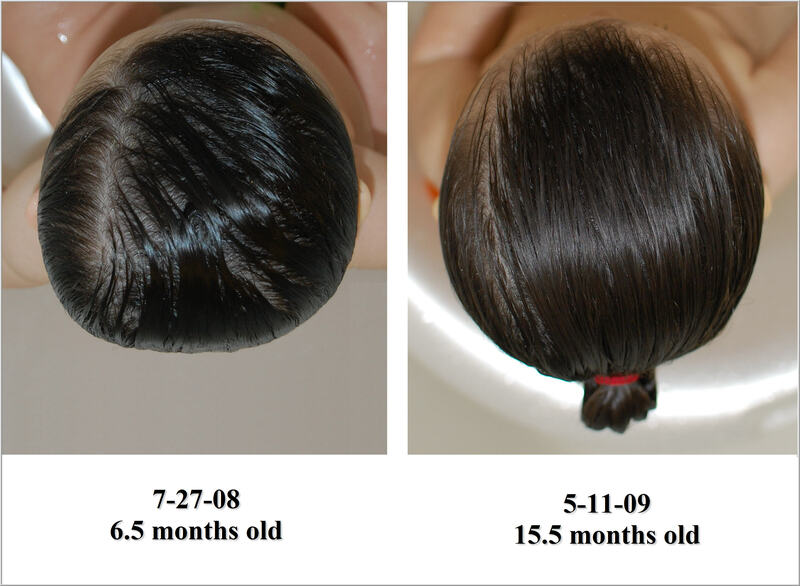 No CST, no other alternative treatment, simply a faithful pony tail at night and no more back to sleep. 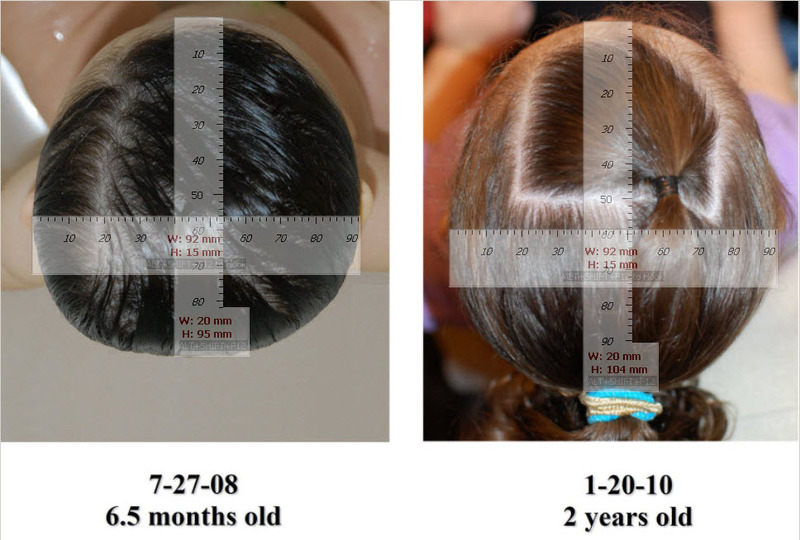 In my previous post, the ruler, I posted a comparison picture of Maysa’s head from the time her plagio/brachy looked at its worse to the way it looks now. In the one below, the comparison is between the way her head looked two weeks prior to graduating from her 2nd DOC band and now. Notice that the horizontal rulers on both pictures indicate the same width. 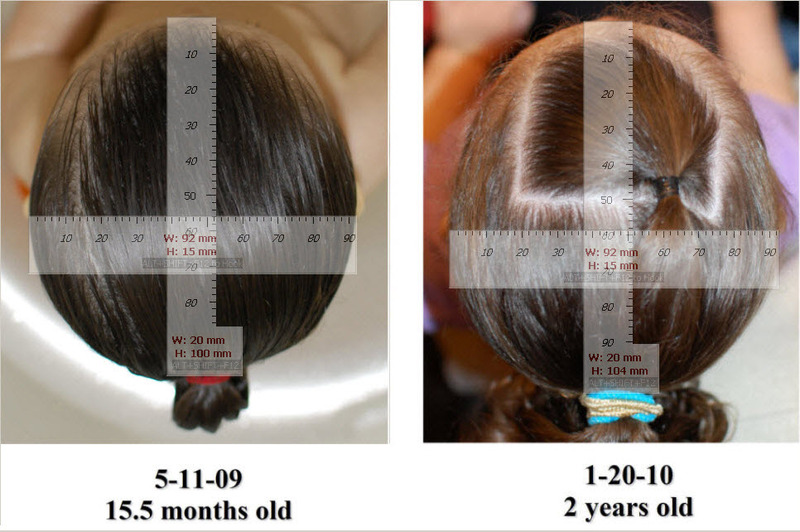 However the vertical rulers indicate that her head has gotten a tidbit longer since May. Overall, it also has taken on a slightly different shape. Her ears have moved back. These are my own pictures and my own calculations and might be totally wrong for all I know, but I truly believe that things have slightly improved since the band came off. I do have to say that she always sleeps with a pony tail right in the back to make it uncomfortable for her to sleep on her back. So to answer the rest of your question, Maysa, who used to be a back sleeper even while in her DOC bands, only sleeps on her tummy now or on her sides, hardly ever on her back. Also, while her head is still wider than that of her 4 year old sister, it doesn’t jump at you anymore, nor does the fact that her head is not as round as most little girls her age. So, just so you know, the measurements on those rulers are not accurate. In other words, in the July picture, her head is really not 92 mm wide, nor is it 104 mm long in the January picture. 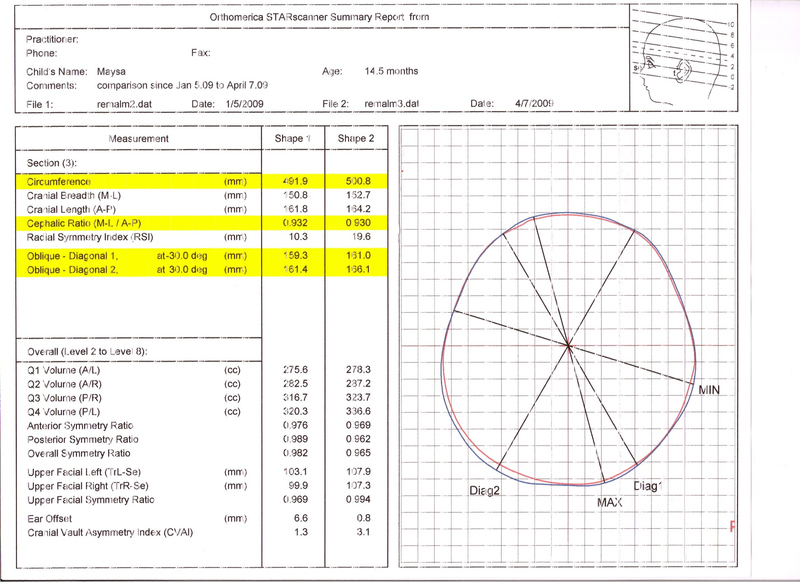 What I actually did was try to use those numbers on the rulers to get an approximate calculation of what her cephalic index was back in July 08 and what it is now a year and a half later. I also want to add that while I came up with a CI of 96.5% for the July picture, it was most likely worse (around 98%)since the middle and bottom back part of her head at that time were further in compared of the top back part of her head. I also think that the CI I came up with for the January picture is probably closer to 90%. 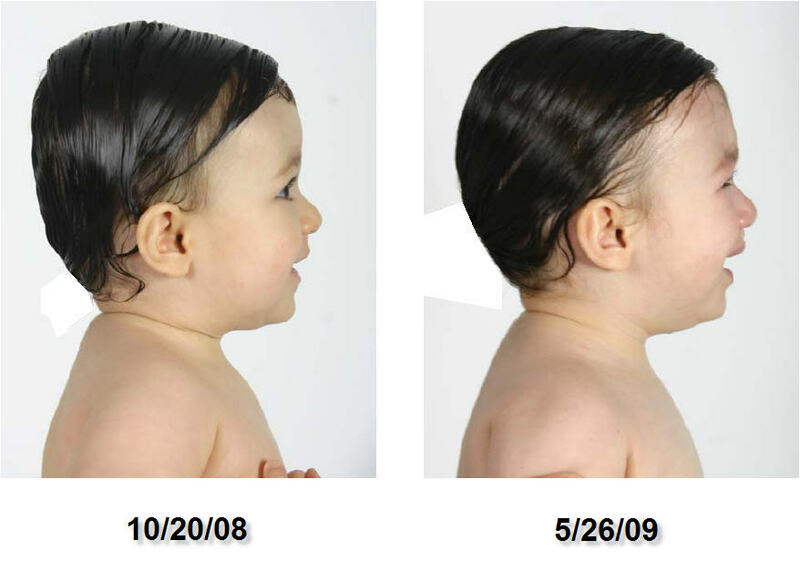 Either way, look how much longer her head has gotten, thank God and the people at Cranial Tech for making this happen. 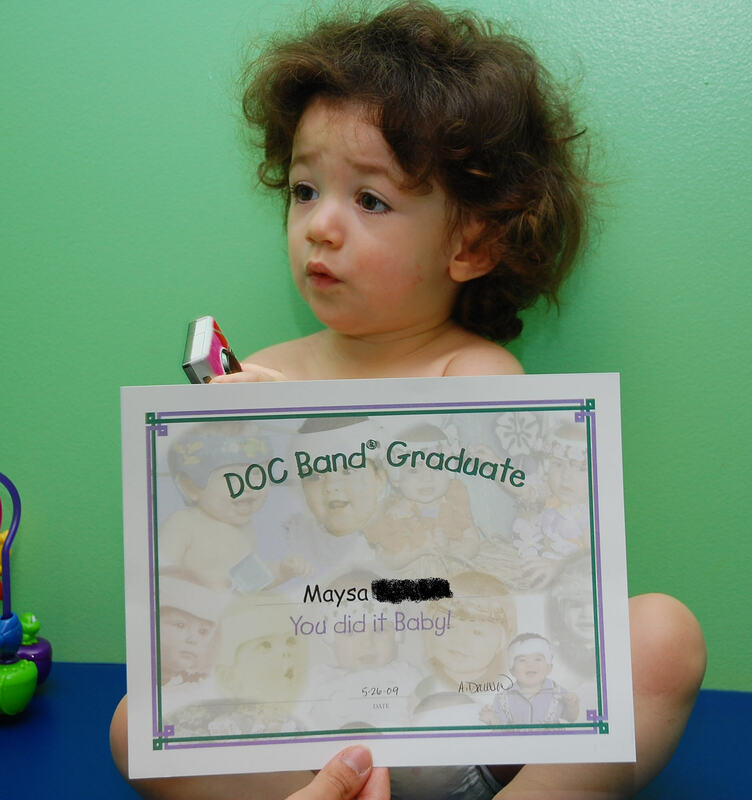 It’s been almost 8 months since Maysa graduated from her 2nd DOC band. She’s basically been out of it for as long as she has been in it. 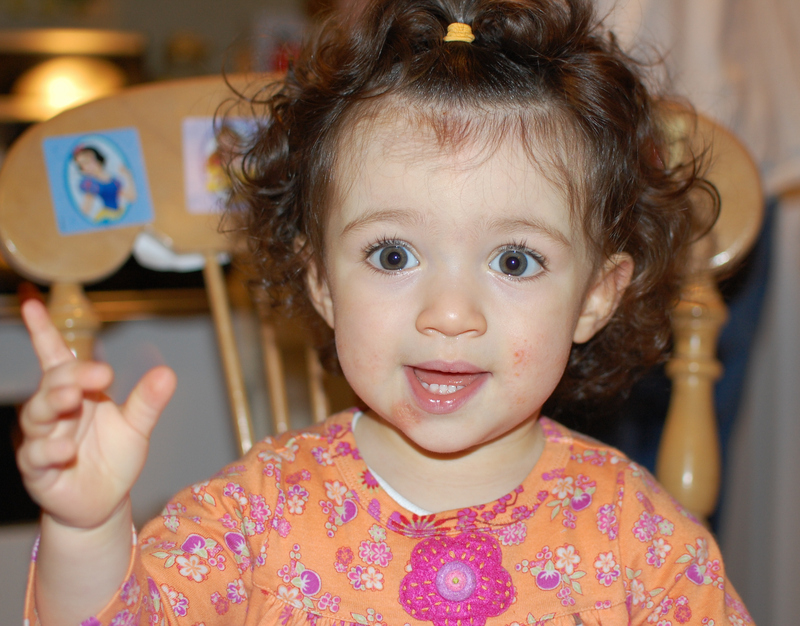 She also turned two recently and I keep thinking that things are getting better and better post band… I don’t take as many pictures as I used to of her head (top view, profile, front…) but I was comparing the two pictures from her 1st and 2nd birthdays, the other day . She has changed a lot, I think, but while I know she has, it is not until I mirrored the two pictures that it became very obvious to the naked eye. Do you now see what I see? Look at her ears in the mirror picture when she was one and the right side of her face. It’s almost like somebody had come and grabbed that part of her face and pulled at it. That right ear in the mirror picture is higher, her cheek is higher, the bulge over that right ear is also more pronounced. I never thought back then that she had much facial asymmetry but boy was I wrong… In the recent picture, her ears are aligned, her head doesn’t seem so wide, and except for one eye looking a tidbit smaller than the other, I would say that her asymmetry is close to zero, at this point. I also have to say that her face has gotten longer and this has helped with the overall aspect of her head not looking so brachycephalic (wide). You are now two! 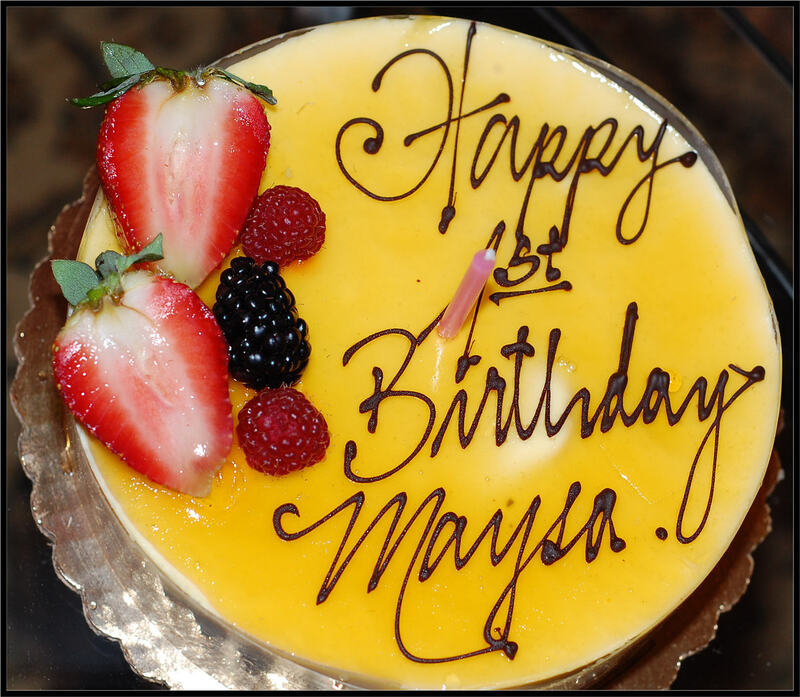 Happy birthday Maysa! We pulled out our favorite princess attire. 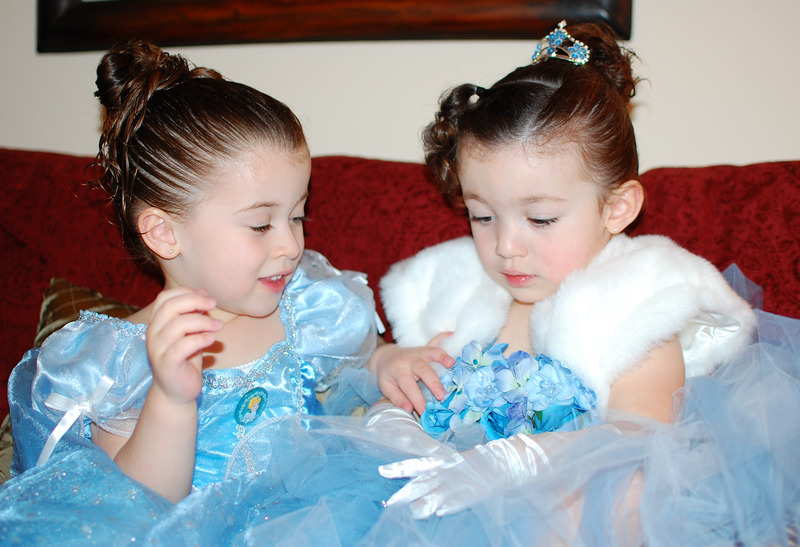 Cinderella was a hit once again and it’s a good thing we have two of almost everything in this house. You are beautiful, you are bright, and you are sweet for sure. Mom and Dad can’t kiss and squeeze you enough and you don’t mind it a bit because as soon as we stop, you say “again”. We love you so much! 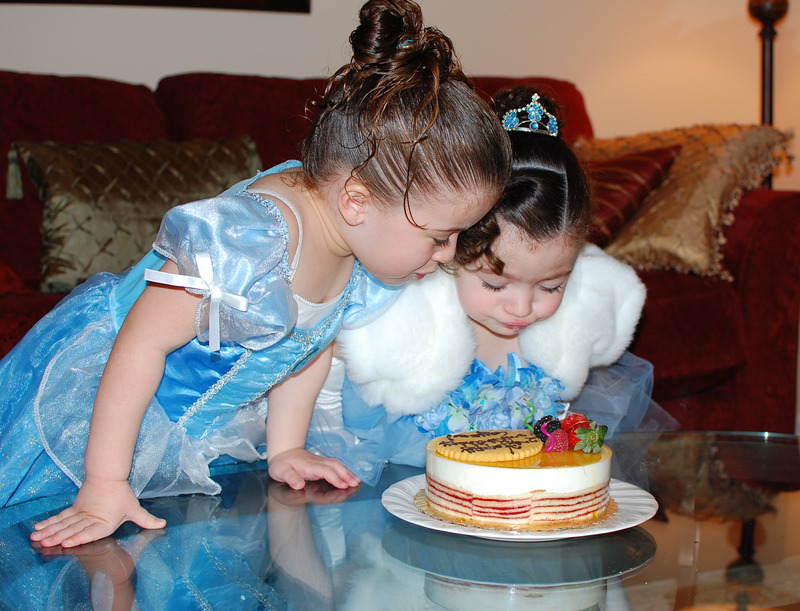 Here are a few of my favorite pictures taken of you and your sister in your Cinderella dresses around your birthday cake. Way to go, Maysa and all other DOC Band babies, you are all so beautiful! About two weeks ago, I got to actually meet another plagio parent, Jennifer Wells, whom I met on the Yahoo Plagio Group. I knew that she was a photographer but it’s not until she created her photo website that I got to see what kind of work she did, and let me tell you, she is fabulous! Thanks, Jennifer, and Happy Halloween 2009 to all of you out there! 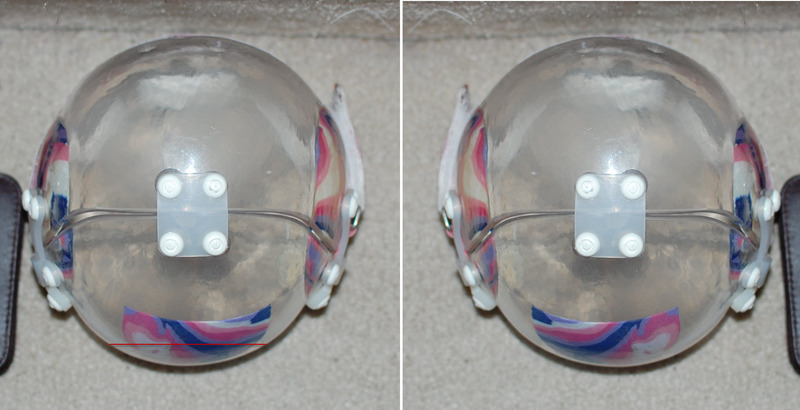 So, what happens when you get a cranial helmet meant to correct plagiocephaly and the helmet is not symmetrical. 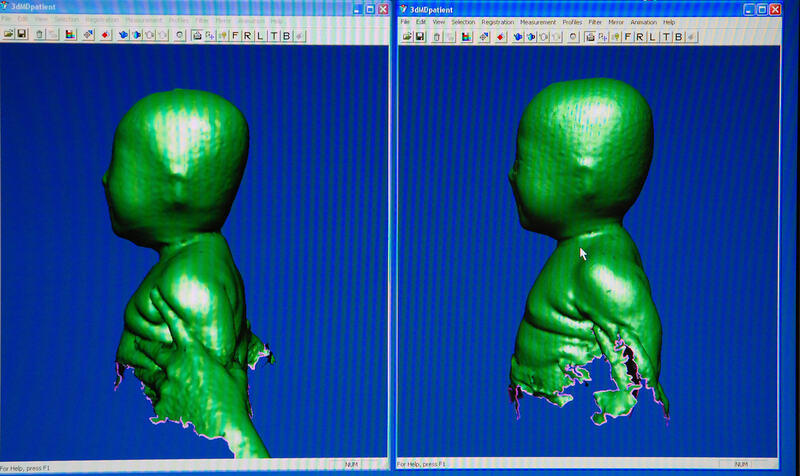 Well, in our case, we ended up with even more asymmetry after 3.5 months of treatment and over 3.5 cm of growth in head circumference. Look at the picture below. 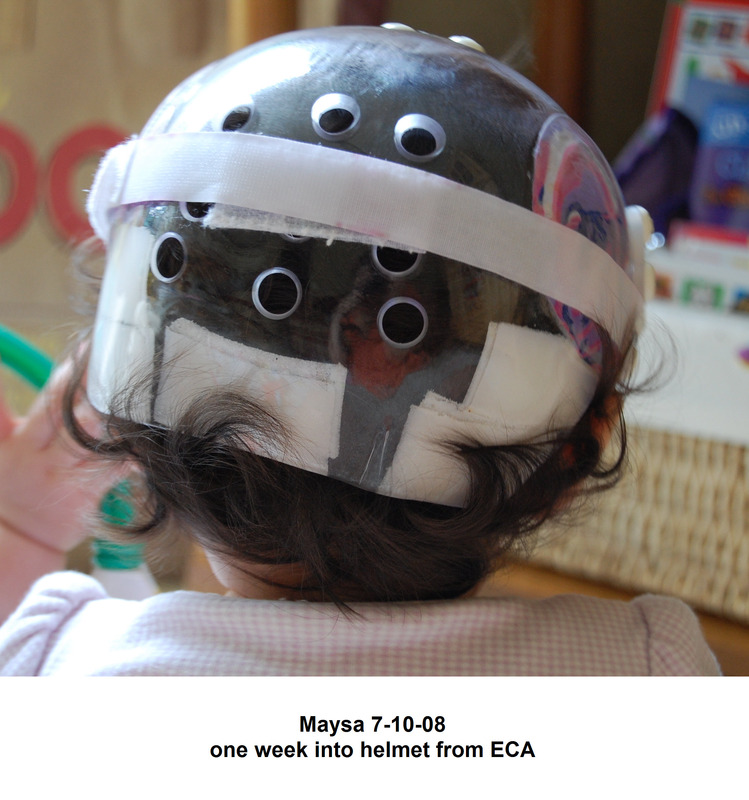 On the left is a top view picture of Maysa’s second helmet from ECA. On the right is a mirror image of that picture. Do you see the asymmetry? Maysa mainly had brachycephaly but the helmets she wore from ECA were never really that much longer in the back nor were they rounder at the base. As a matter of fact, they always looked kind of “short” in the back, like they were not covering her head all the way to the bottom. 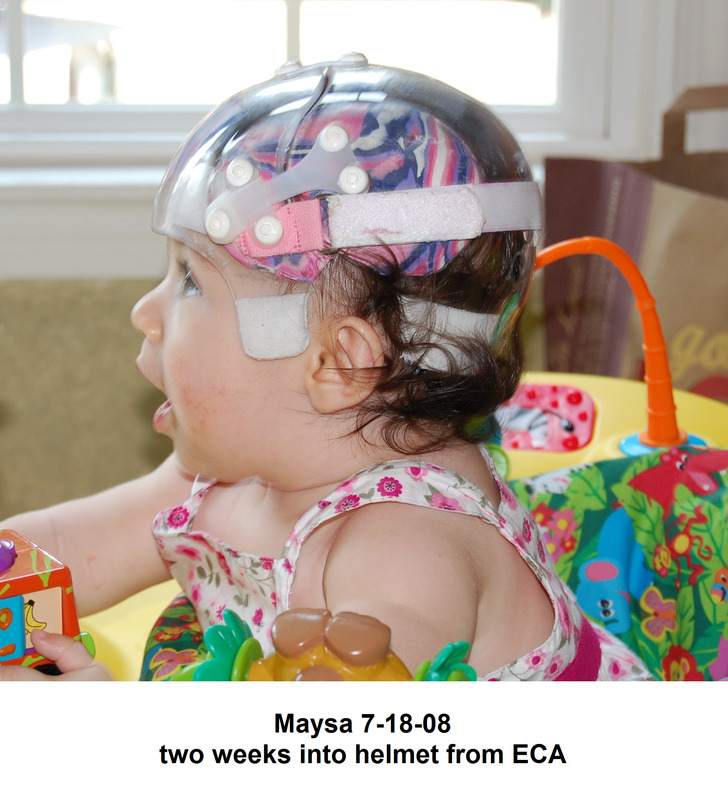 Look at a comparison between her 2nd helmet from ECA on the left and her 2nd DOC band from Cranial Tech on the right. Now why didn’t I do something about this from the start? Well, I trusted too much, had too much faith in the expertise of our orthotist and kept quieting my mommy instincts. I am still so glad that while Maysa regressed in the helmets from ECA, we were still able to get great correction from the two DOC bands she wore after that. We went to the Renaissance Festival in Maryland this weekend and the girls got to see some interesting people in some very interesting costumes. The jousting was the highlight and so were the elephants. The girls also got to play in the kids area. It was hard letting them roam on their own because of all the crowd that was gathered but also because of the uneven grounds, so when we finally found a leveled spot with benches and enough space for them to just walk freely, I pulled out my camera and started taking some pictures. A woman who was passing by and then sat down looked at Maysa and her sister and then turned to us and said: “What a GOOD LOOKING family you have! Really, just precious!” I don’t want to sound shallow or anything but it made me feel so good, especially for Maysa. She doesn’t just look normal anymore, she just looks great! 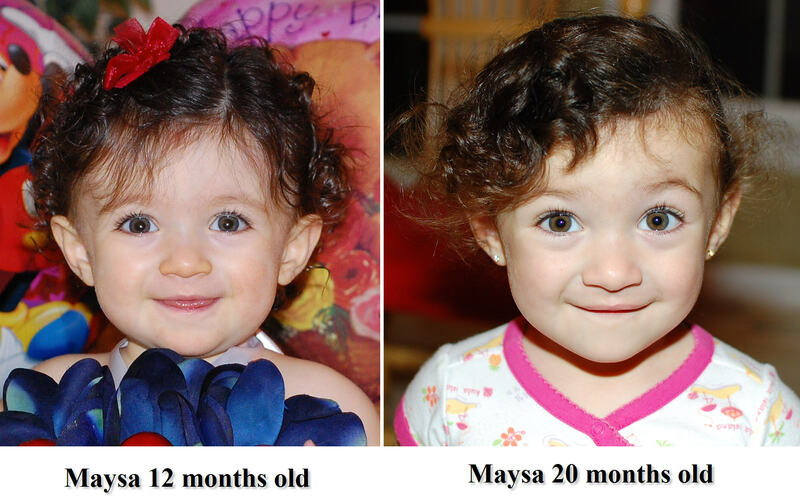 Besides the silly grin on both pictures, do you notice how far back Maysa’s left ear has moved in the past 8 months? Her ears were so flat at birth and then started sticking out once she developed plagio and brachy and now at 20 months of age, it seems to be less obvious. I don’t know if the right ear is acting the same. In the recent picture, her hair is covering too much of it, but boy! She is really looking better and better every day. I can’t seem to stop posting about the changes that have happened recently in Maysa’s head shape. Here is another comparison shot. It is not perfect, I know, it captures her back right profile in an unusual angle but definitely outlines where her head has been growing in the back, don’t you think? I also want to mention that the picture on the left was taken about a month and a half after she graduated from her 2nd DOC band while the one on the right was taken two and a half months later. 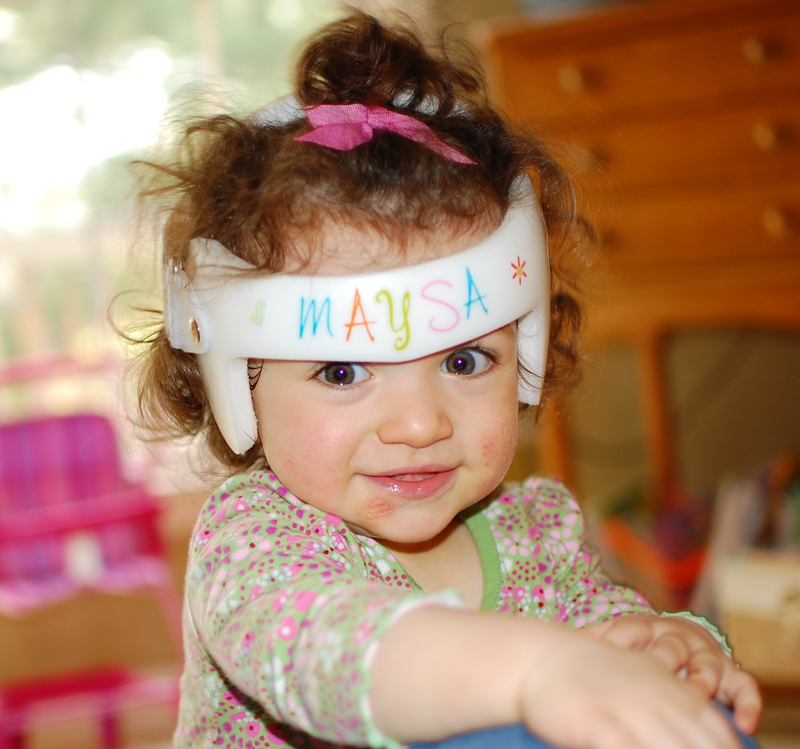 Maysa’s tearful EEG came back normal. That’s the news the pediatric nurse shared with me today. It’s a good thing as we now know for certain that her “stress moves” are not seizures, however, we are still puzzled at what is triggering them. Flat to Squarish to Roundovalish, WOW! I outlined her head and trimmed her hair in all three pictures so the focus in on her head shape only and not her hair. In July 2008, her head is obviously really flat and she has a little bit of a conehead. In May 2009, she is about to graduate from her DOC band and while it is much much improved, it is kind of squarish overall. 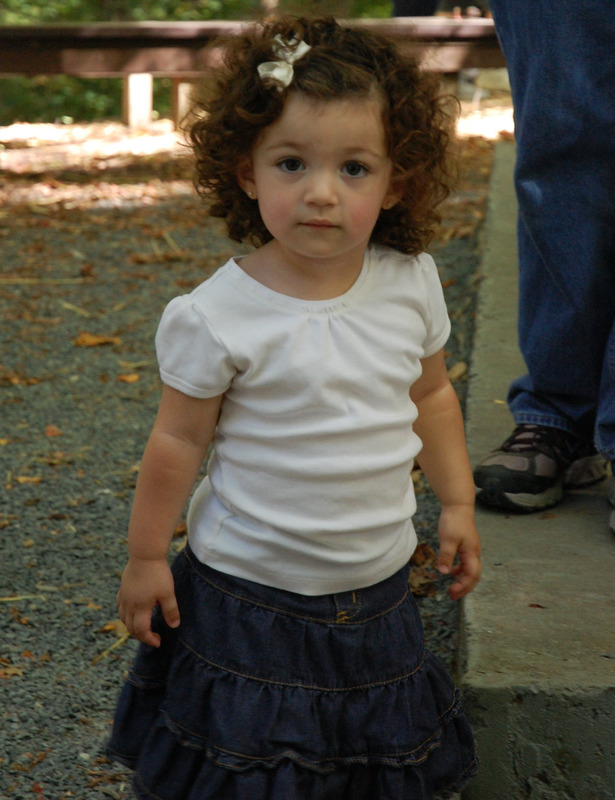 This past weekend, August 2009, her head is round. WOW! I am amazed! She is improving on her own. What a relief! Do you see what I see in the left profile pictures below? Does her head look rounder AND longer in the back? I like to believe it does. Also, I have been putting her to sleep in her crib with her hair combed in a pony tail right in the middle back where her head needs to grow so she would get “uncomfortable” and sleep only on her sides. If you are reading and have or had at one point long hair, you know what I mean. So far, so good. Every time I check on her at night, she is sleeping on her sides, never directly on her back. Just playing on my big sister's bed! 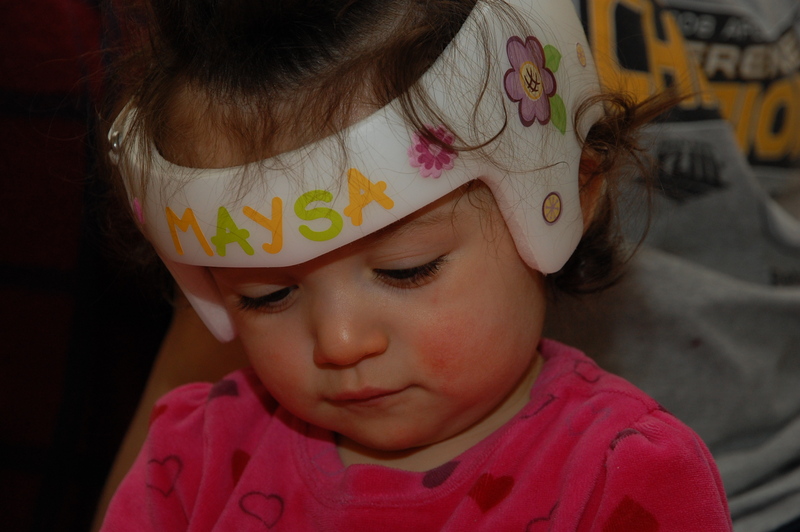 Maysa went to her scheduled EEG yesterday. While it wasn’t painful at all, it was torture. Attaching those electrodes to her head was a nightmare and took forever. I had to take her right after lunch and right before her nap time, so she was super cranky. Once all the electrodes were in place, I was able to lay down next to her. She drank a bottle of milk and then fell asleep. She was exhausted and she usually takes a 2 to 3 hour nap. Well, about 25 to 30 minutes into her nap, the nurse starts to wake her up. She was zonked out and didn’t hear her tapping loudly on the table, but she HAD to wake up. When she finally did, she cried and it really made me sad. She was so annoyed at the world and begging to go back to sleep. We couldn’t let her. Not just that, I had to let her cry for a good 5-10 minutes. That is part of the test. Finally the series of flashing bright lights came. She didn’t like that either… The nurse then came and removed the electrodes, she cried some more. She rinced her hair, she cried some more. I then put her back in her stroller and she walked out of Childrens National Hospital happy again. 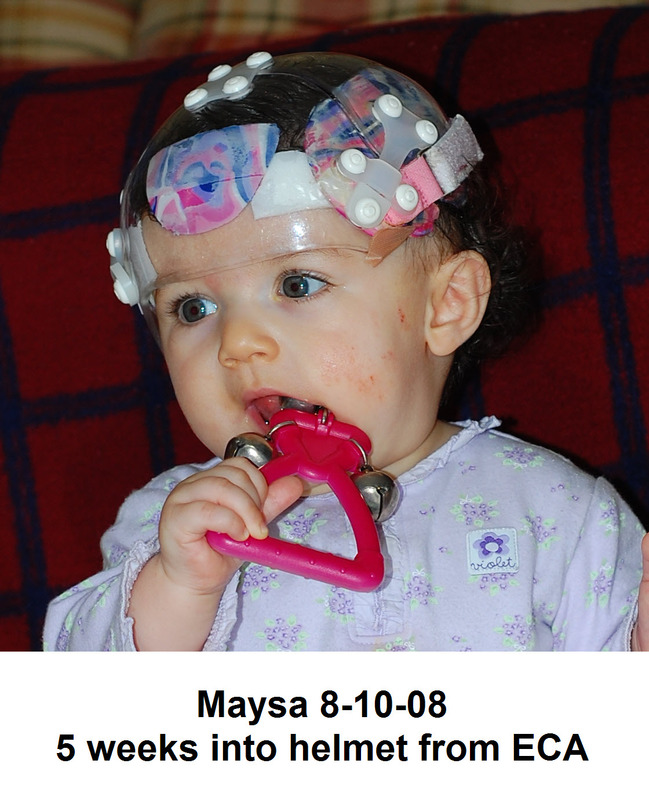 Just in case you wonder why Maysa is getting an EEG, she is been doing those (what we call) stress moves since she was about 4 months old and we don’t know why. It doesn’t happen every day but when it does, and if we let her, she can go on for over an hour. She gets on the floor, on the couch or in her crib, lays on the stomach, crosses her arms and sometimes holds her fists, crosses her legs at the ankle and gets as stiff as stiff can be. She also breathes hard and pulls to stretch her legs even more. It is so strange, I have no idea what this is all about! We can get her to stop without her fussing too much but if you turn around, she’ll start all over again. While we hope that they are not seizures, we are also hoping to get a better idea of what this could be. 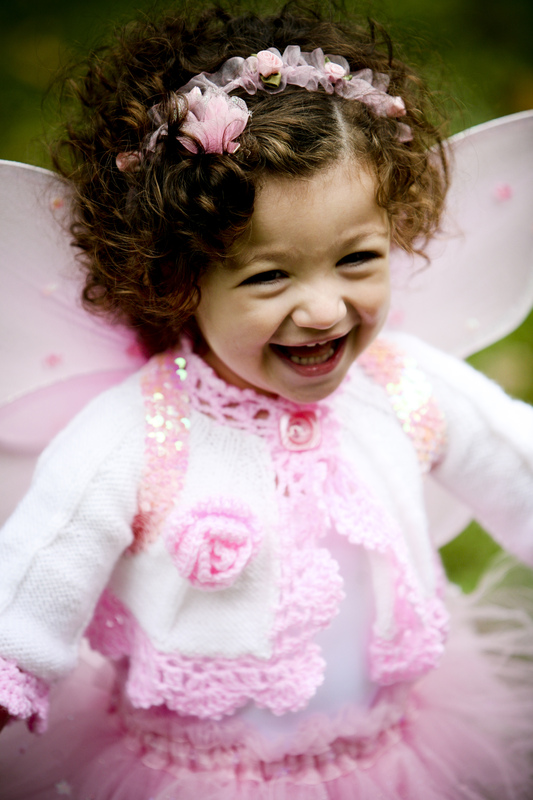 On the charts, she is between 98 and 99% for her head, height and weight measurements. We were told to cut down on the milk and the portions of food! That might be hard. Not much else besides this picture below and the fact that I am enjoying my time off with her very very much! I’ll start by where we are now and say that Maysa graduated from her second DOC band a month and a half ago. She looks good especially in the back where her head is now nicely curved. Her forehead on the other hand looks more pronounced on the sides than normal. It is wider than what it should have been and right now, I am having a hard time fixing her hair in such a way that it will not accentuate it. 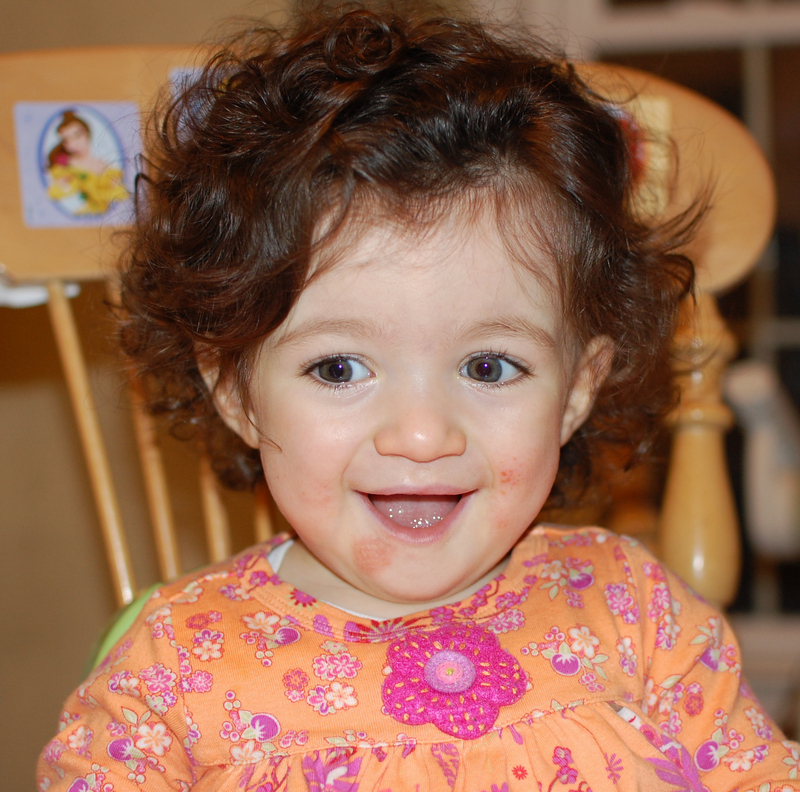 Yes, while most parents would love for their plagio/brachy babies to have hair to cover the imperfections, Maysa’s thick and curly hair is quite challenging. I tried cutting it last time, but that was quite a disaster. 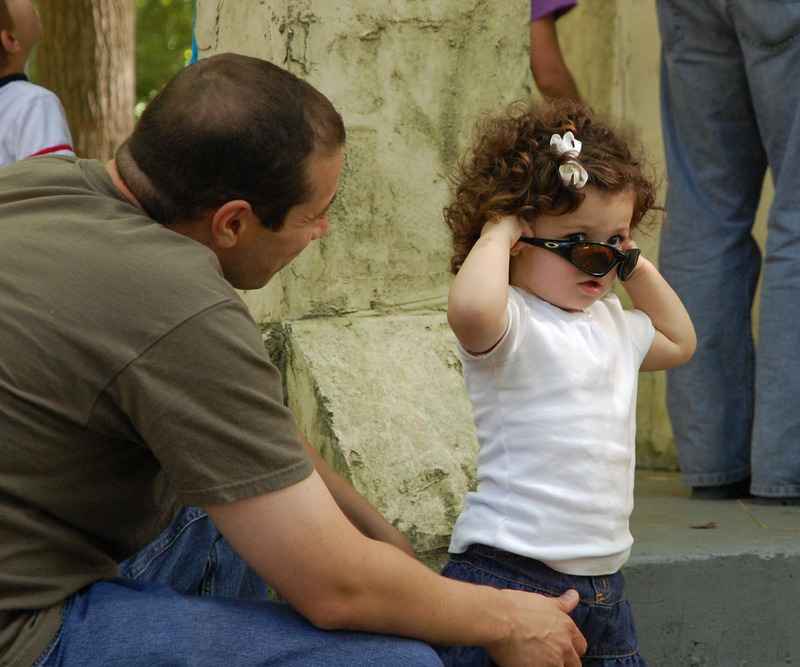 I am glad that she is too young to care! 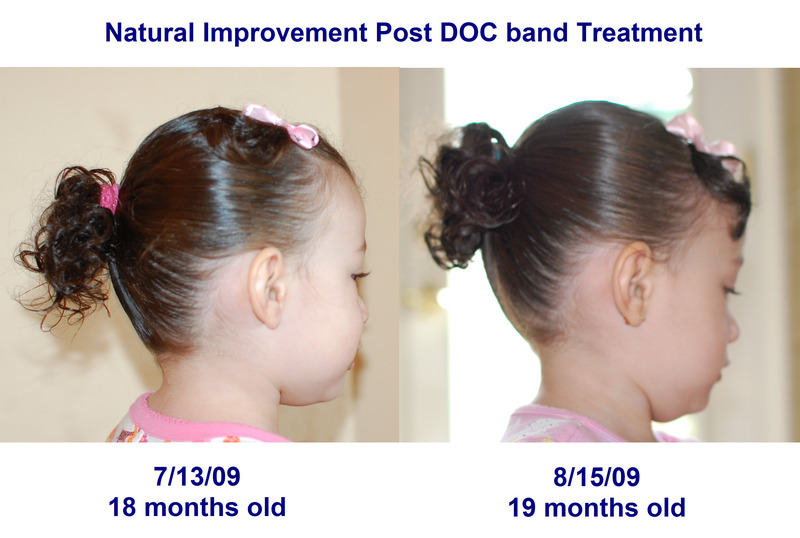 Changes in the second DOC band were not as dramatic as with the first DOC band but she still grew on the back up to the point where there was no more foam to shave off the back. She tolerated it just as well as the first one but did manage to pull it off her head a couple of times. Just like with the first band, Maysa never suffered from any rash from it and always slept well in her bands. 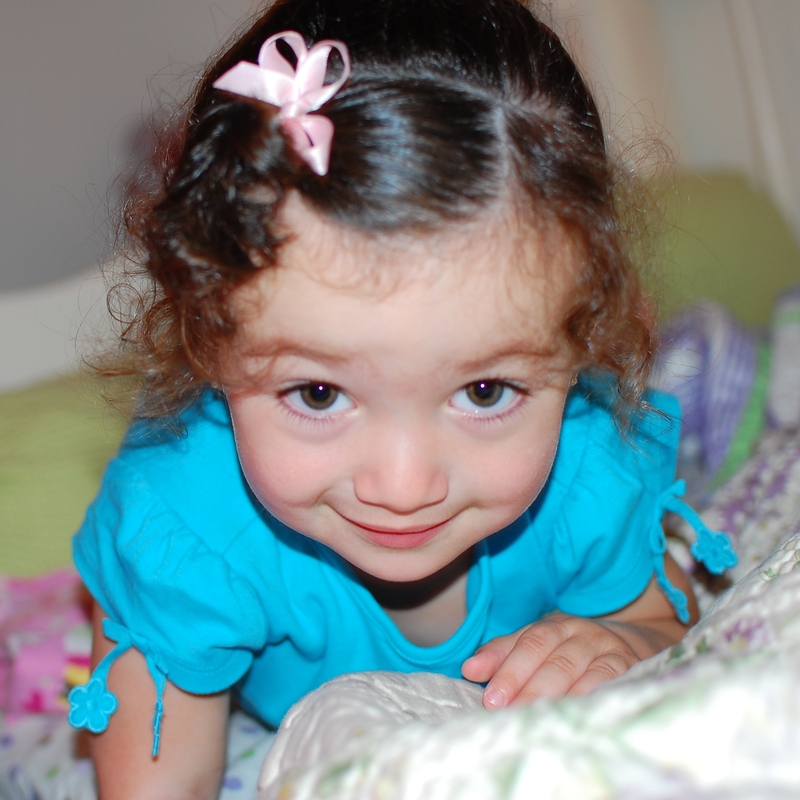 Maysa got her first DOC band when she was 9.5 months old. 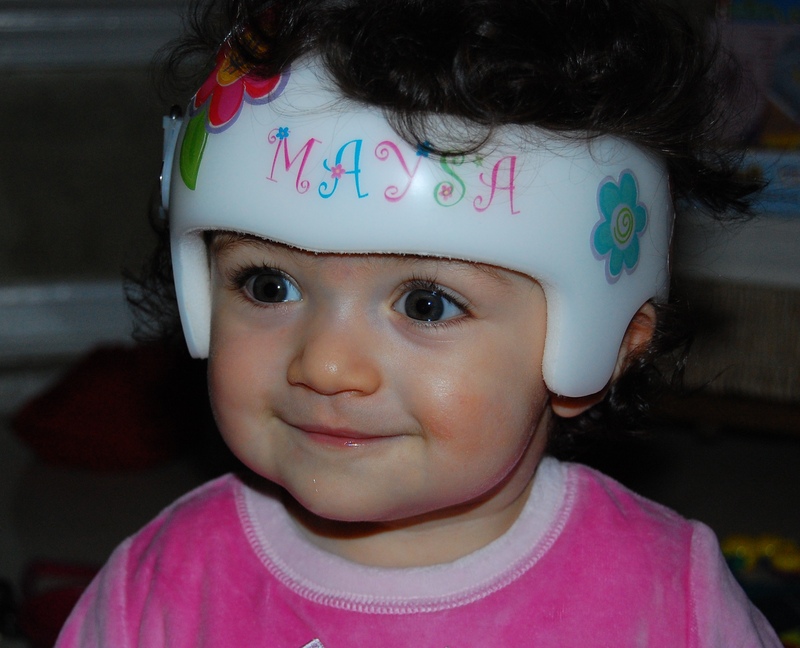 It was in mid October of 2008 and I was so depressed about what had happened with her head shape after being in a passive helmet from Eastern Cranial Affiliates for 3.5 months, I thought that Maysa would never look right again. We had put all of our faith in Joe Terpenning and we had trusted him. 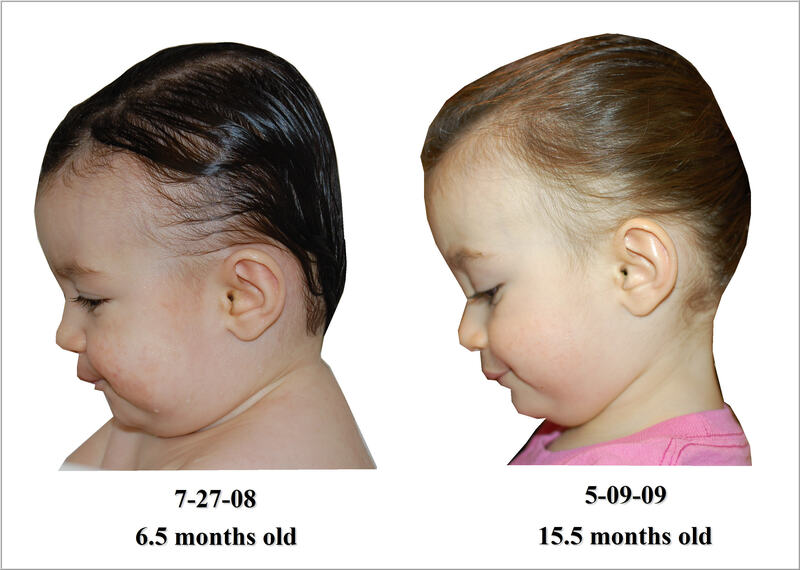 However, while Maysa’s head was growing in the back, like it was supposed to, it seemed to me, after the second month, that it was also growing on the sides. My husband couldn’t really see what I was talking about. A trip to Orthomerica to see Laura Plank confirmed my fears. 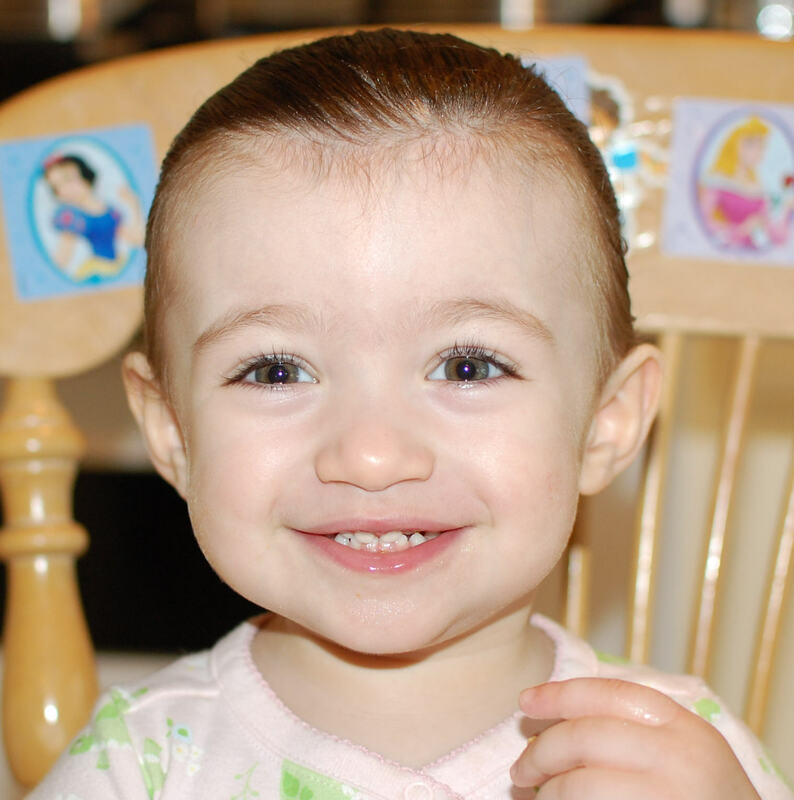 Maysa’s head had been growing all around: in the back AND on the sides. If you go by the numbers from her reports, both her plagio and brachy numbers were worse after 3.5 months of treatment. Joe had just told us that she only had about one month left in the band. 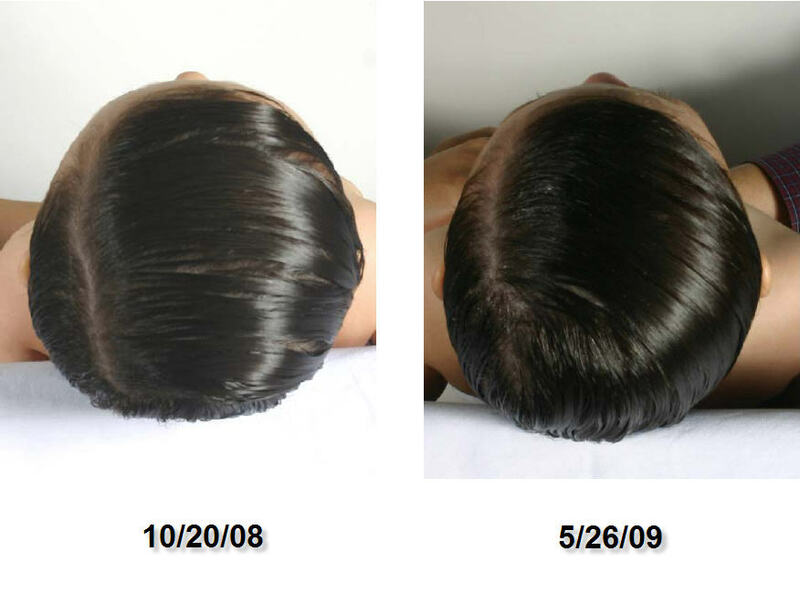 It took Maysa 7 months in two DOC bands after that to bounce back and get a better shaped head. So October was a month I’ll never forget. I had to get a script as soon as possible to get her in a DOC band. 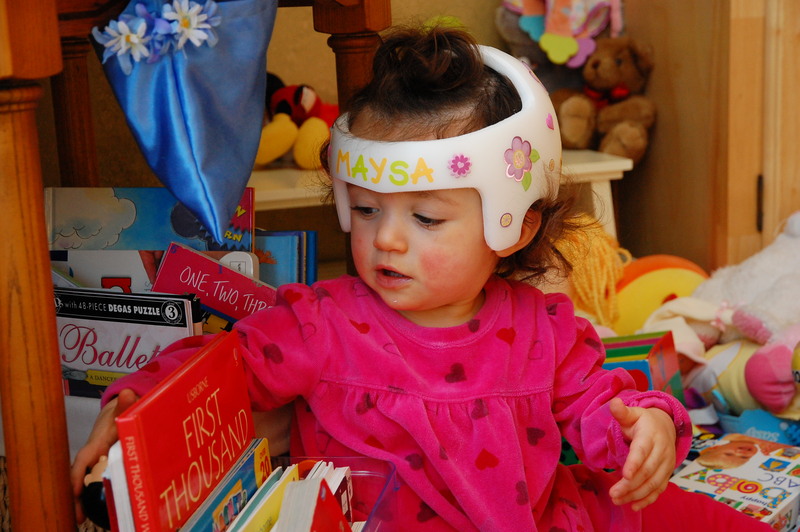 Maysa’s ped is not a believer in cranial molding helmets and thinks that Maysa’s head will round out. Thanks to a parent on the Plagio Group, I am able to get a script from Dr. Natovitz who thinks Maysa is still young enough that she’ll benefit from it. I take that script with me, just in case Maysa’s ped doesn’t write me one, but I very well know that in order for her band to have a chance be covered, the script has to come from her ped. So I go and see her one more time and break in tears in front of her out of frustration as I can hear what she is about to tell me: “It will round out on its own, just give it some time Mom…” She then tells me that she’ll send in for a referral but that it will most likely not be covered. I tell her that we are ready to pay out of pocket if we have to, but that we need the script. She sends it in. It is approved. 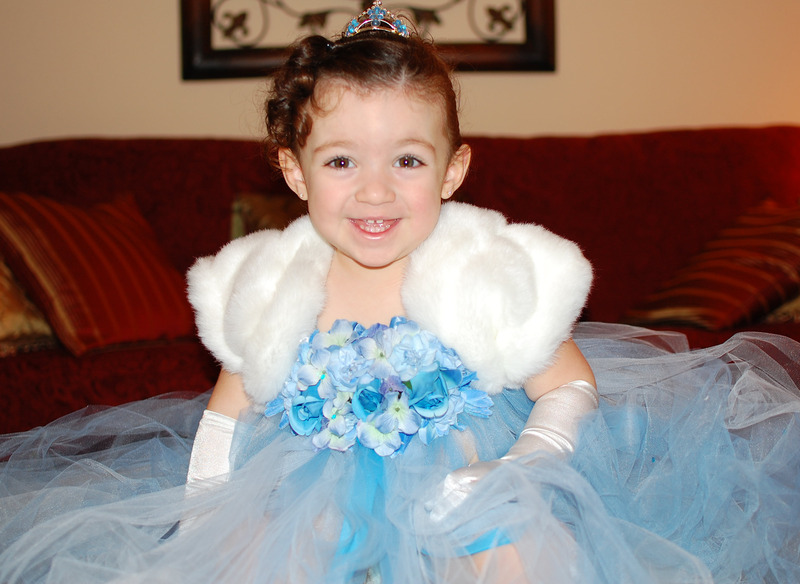 Maysa gets her band on October 31, 2008. Timing was perfect. The moment Maysa got in her DOC band, her head started rounding out. I literally saw changes within the first week which prompted me to start this blog. I had to find a good way to keep track of her progress and posting pictures without overloading the Plagio Group or my personal calendar. I also thought that it would be a good way for parents who are faced with plagio and brachy to find some information and the simple report of what our experience has been. I never ever thought in a million years that Joe Terpenning would try to intimidate me and threaten to take legal actions against me for what I had to say about him, his helmet and our experience with them. I will have to post the letter that my attorney wrote to him in reply to his threats. The bottom line is no one can prevent you from feeling the way you feel about someone or something, and as long as you are not lying or making up stuff, you should be fine… Could you imagine the Internet without reviews about businesses? People without opinions about their own experiences? Inimaginable! 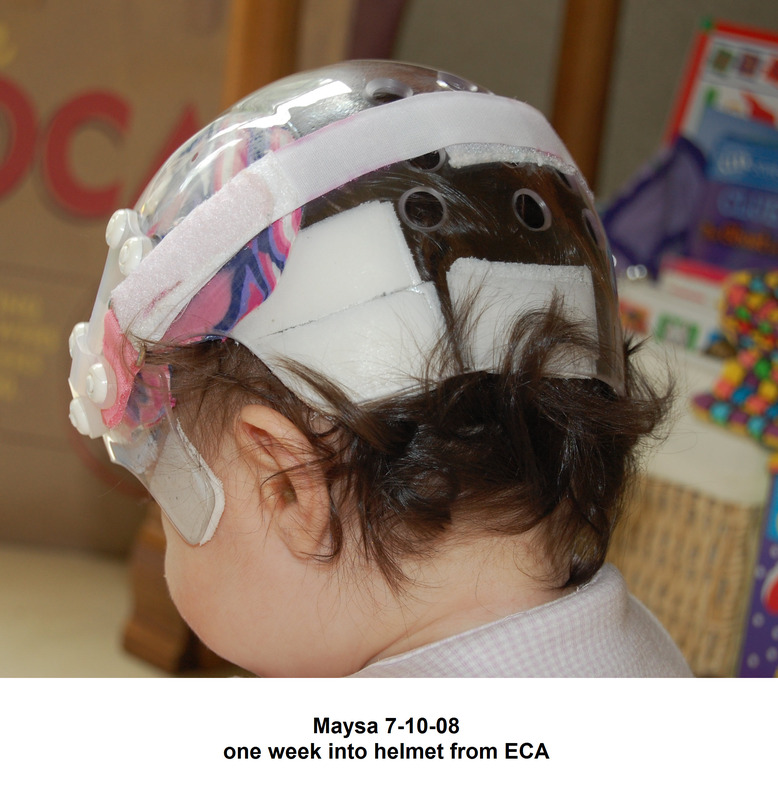 Anyway, so prior to the DOC band, Maysa was in two passive helmets from ECA. Two, only because the first one broke after Joe adjusted it. I think that Maysa’s head started popping out in the back during the first month she was in it but then things went down hill from there. 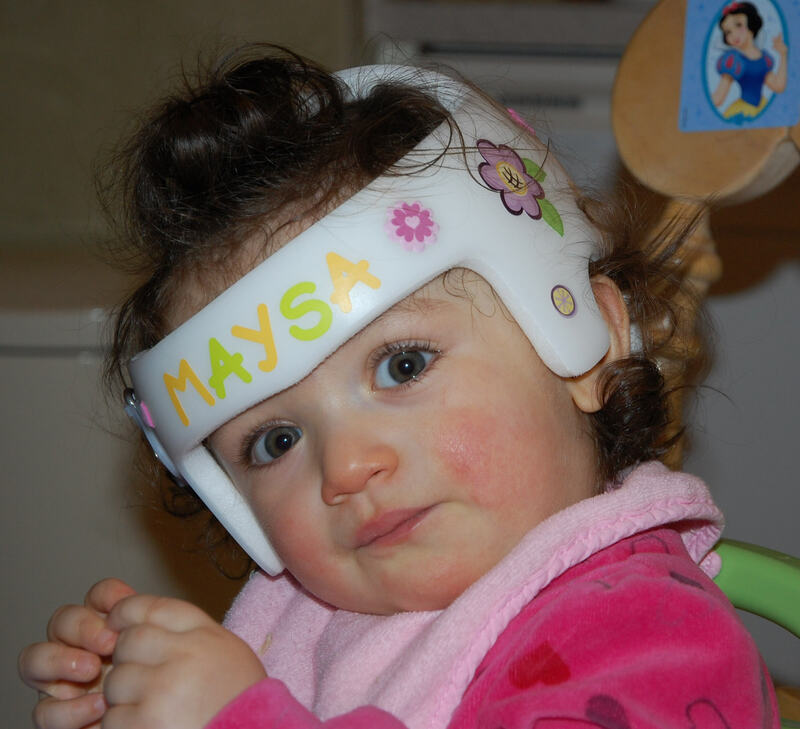 What makes me really sad is that we started treatment when Maysa was 5.5 months old and I feel that had she been in a better helmet at that young age, her head would look so much better now if not completely unnoticeable. I still kick myself for making the wrong choice there. Parents out there, do your research in and out and all over again before you start treatment, please do! 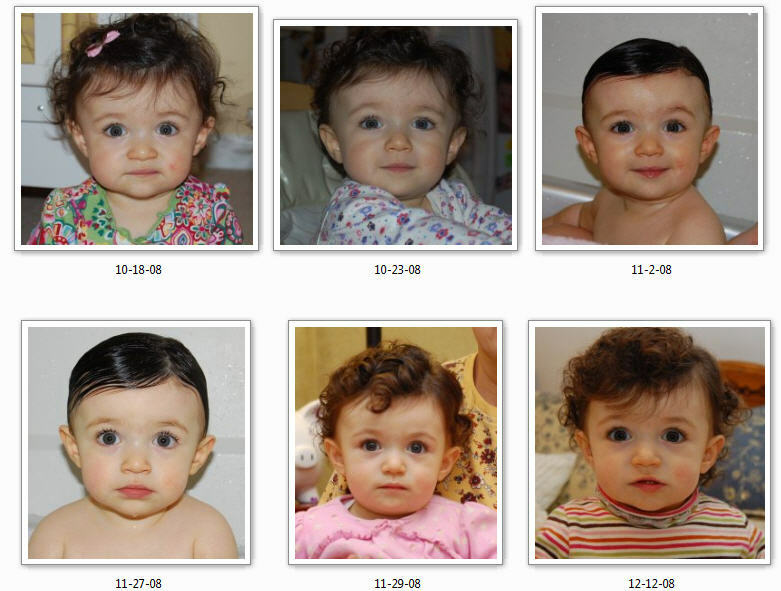 So before that, from 2 to 5 months of age, we notice that Maysa only looks to the right and that her head is starting to look “funny”. 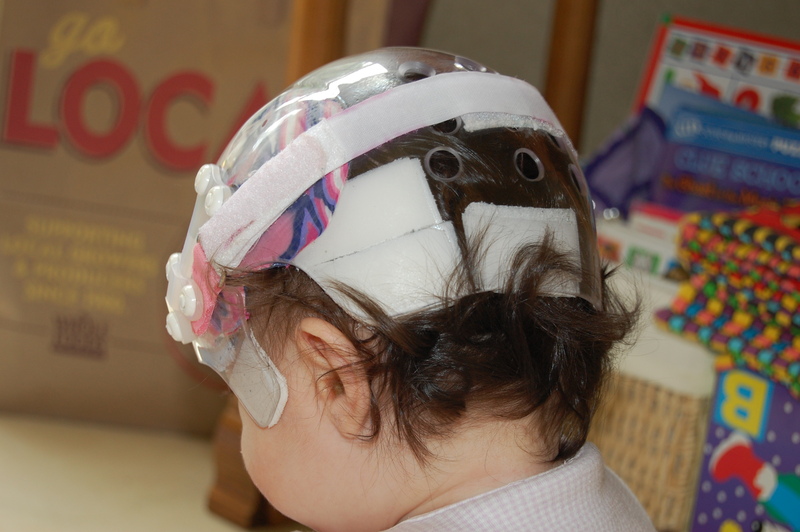 We have absolutely no idea what plagiocephaly or brachycephaly are. 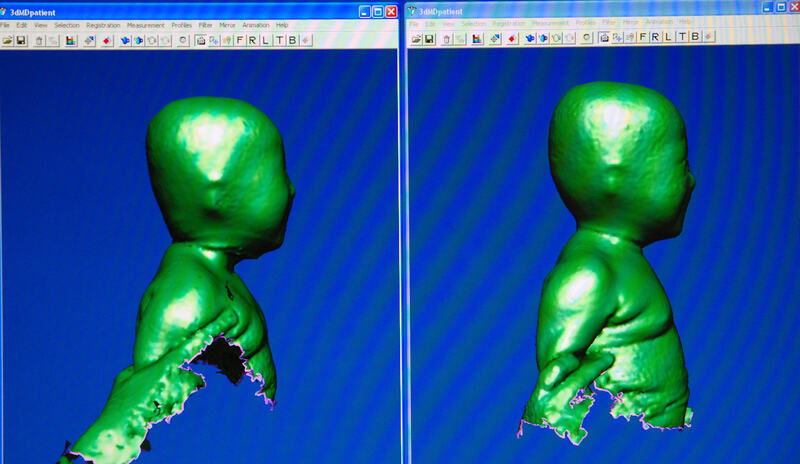 We have never seen babies in cranial molding helmets. We don’t even know that babies can have torticollis. We are absolutely clueless! The ped doesn’t think that she has tort, just a preference to the right side and tells us to reposition her to the left and to stretch her neck to the other side. She never tells us to be agressive. She just says that it will eventually round out on its own. How many of you have heard that so far? I remember that we went home the day of her two month check up feeling guilty that the fact that we let her sleep on her right side caused her head to be misshapen. 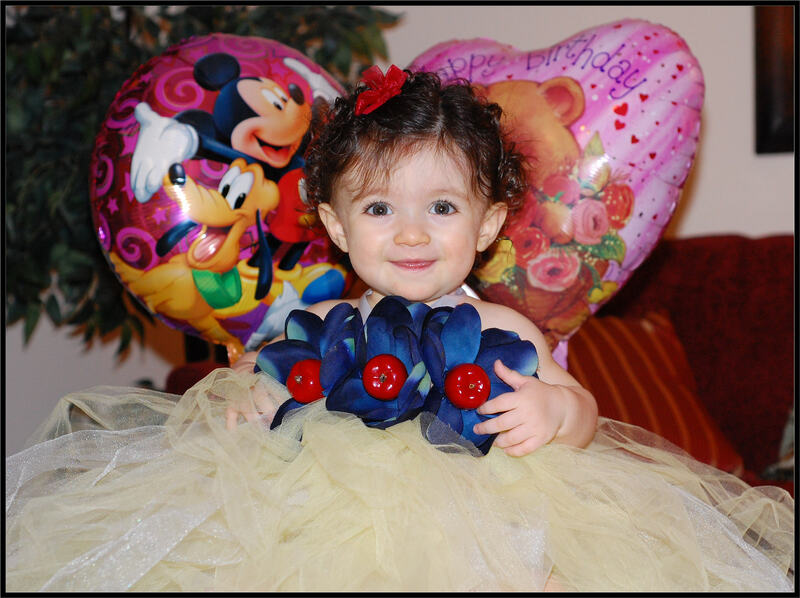 At birth, Maysa looked just like any other baby. She was born via C-section so her head looked perfectly round. 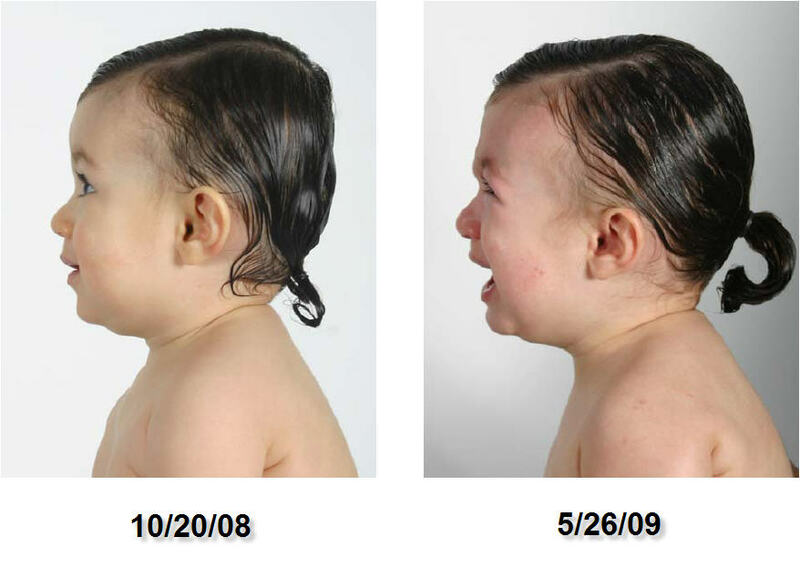 I will end this by saying why don’t pediatricians check for torticollis at birth? Why don’t they emphasize tummy time? Why don’t they recommend sleep positioners? Why are some still not pro banding at an early age to prevent further damage? I am happy that Maysa’s head has received great correction from her DOC bands, but I feel sad for all parents after us that are or will be faced with the same ordeal. I just wonder how long before something is effectively done to prevent Plagio. I’ve been meaning to post these pictures for a while but never got quite a round to it. Anyway, the very first one was taken at the hospital when she was 1 day old. The very last one was taken today. 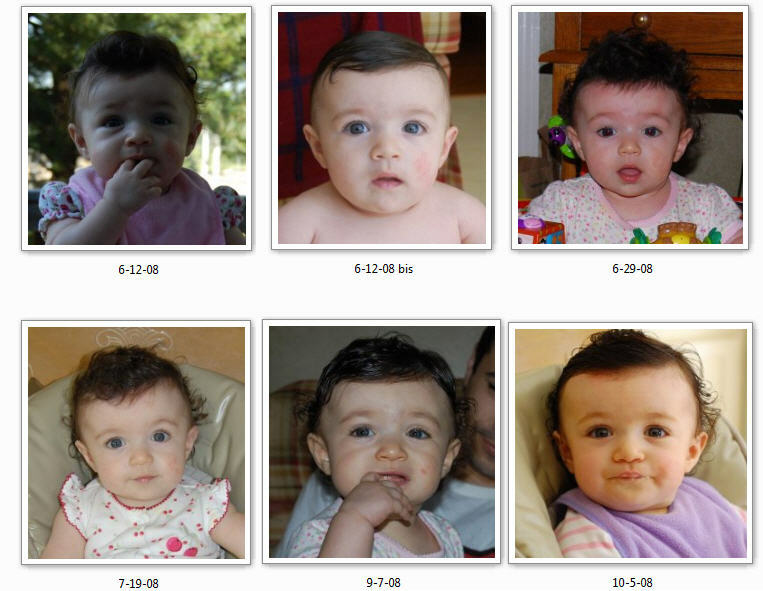 In this first set of six, you’ll notice how Maysa’s head started growing in width in April and then again in June. She wasn’t helmeted yet back then, but looking at her January and March pictures, there was no doubt in my mind that something wasn’t right. In the next set of six, the top three were taken before she received her passive helmet from Eastern Cranial Affiliates. 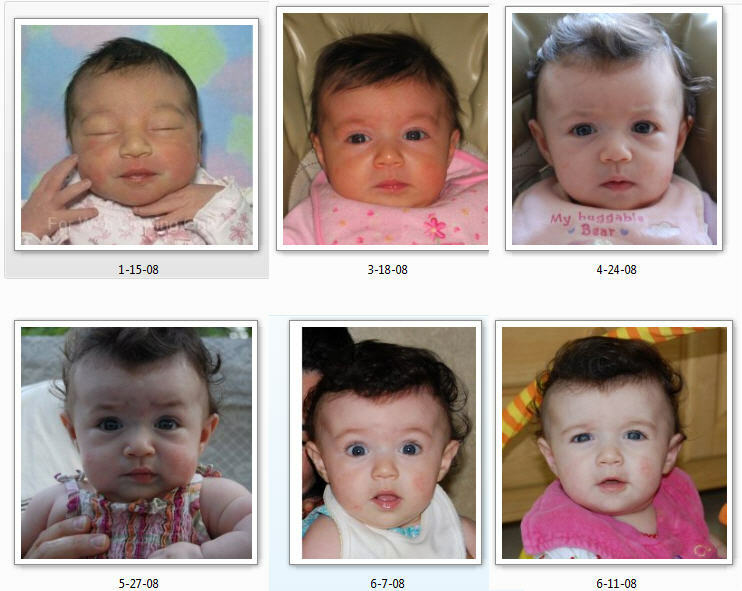 Look how much fuller her forehead looks in the November and October ones. I just want to mention that on August 9th, I broke the ear flap on Maysa’s helmet after her orthotist heated it to adjust it. 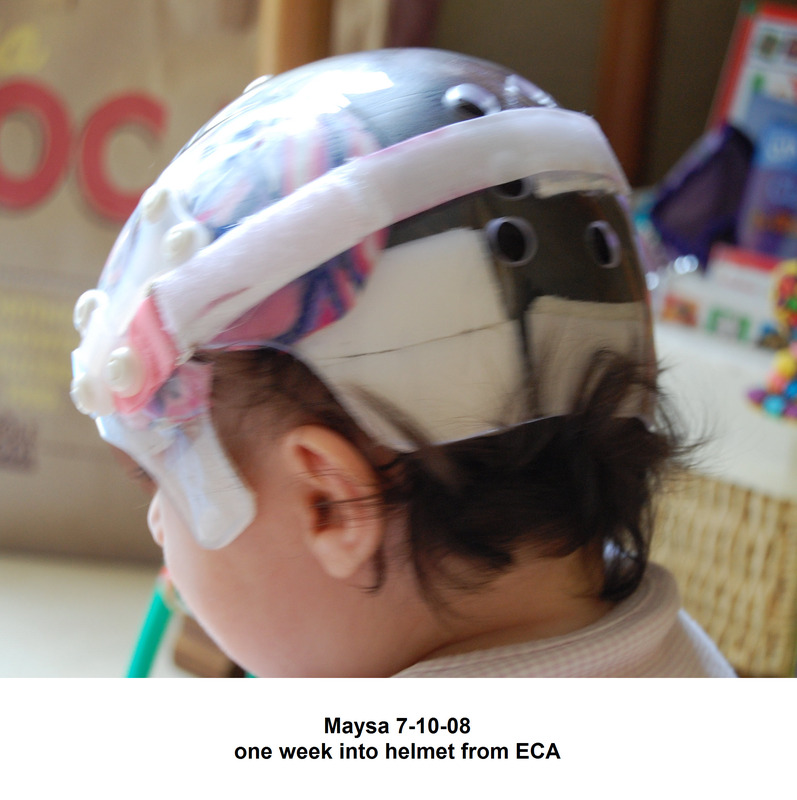 While we were told at first that he would replace the helmet, it is not until September 18th that Maysa receives her second helmet from ECA. 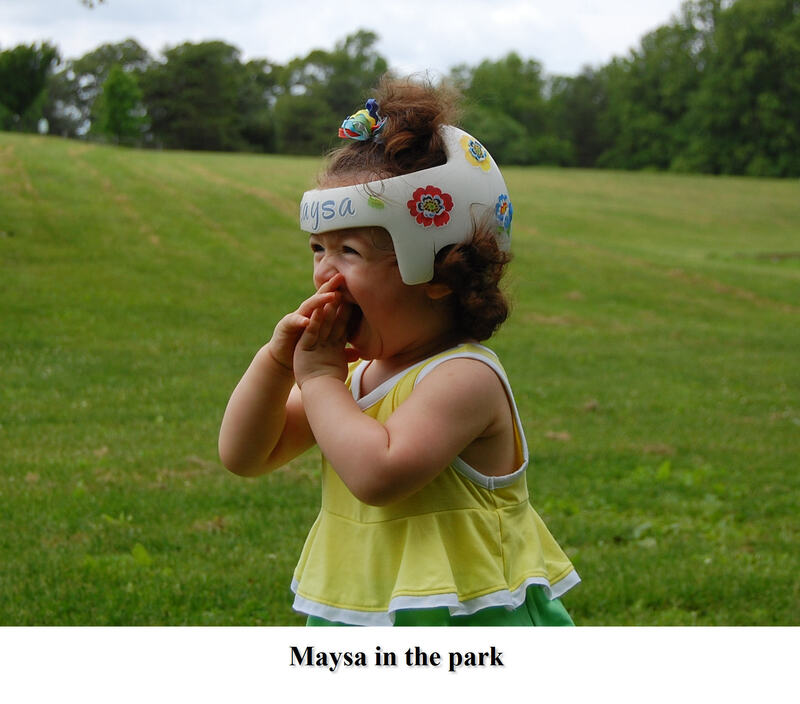 In the first two pictures that follow, Maysa is no longer wearing the passive helmet from ECA. Her head has gotten wider than ever and we no longer believe in Joe Terpenning, his helmet or his practice. Maysa gets her first DOC band on October 31st and within the following two months positive changes have finally started to occur. Compare the October pictures to the December one. Between December and May, changes to the front are minimal. The DOC band is holding her head on the sides. Her head is growing in the back like it should. Therefore, in the following set, she looks pretty much identical in shape. It’s been over a month since Maysa graduated from her DOC band but since that time, I feel like she has gone through one big growth spurt that we just missed out of the band. Her sandals don’t fit anymore. We’ve had to buy her new ones. Her dresses are getting shorter, her tee-shirts are getting tighter and she has gained 2 or 3 pounds in the past month. Needless to say that her head has also grown. At least, that’s the way I feel, and it seemed to have gotten wider as well. I am starting to see where things don’t look right all over again and last night, I cut her hair up front to give her bangs in hopes to cover the width in her forehead. She’ll always be cute, but I don’t think that she is meant to have bangs, not with hair that’s so curly. Thank God that her hair is still long enough to be tighed up at the top of her head. 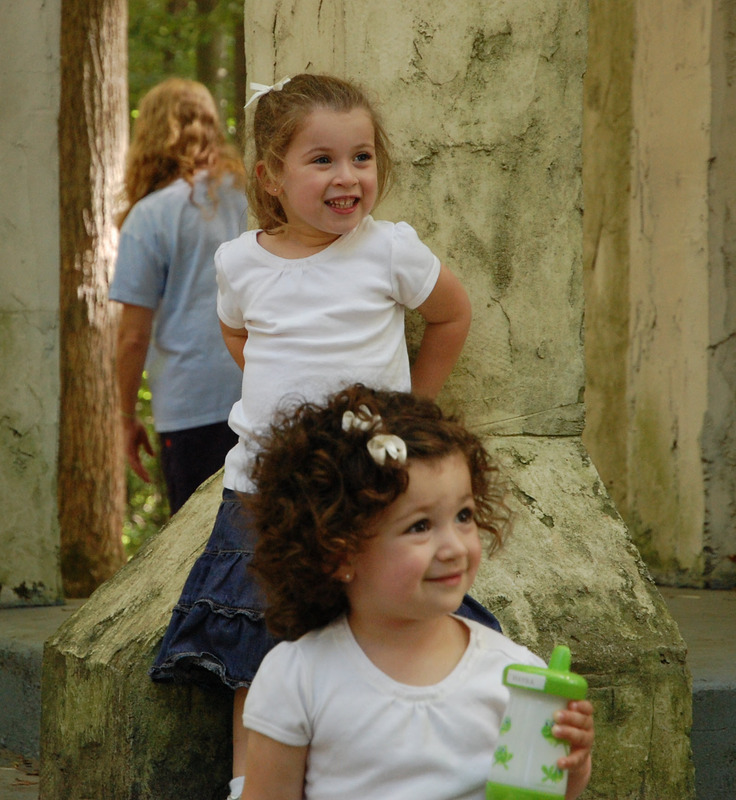 In this one, she is giggling while her sister is being silly with her. I wish I had videotaped this moment. Her little laughs were priceless. In this next one, after agreeing with me that Mommy did an awful job trimming that hair, you’ll probably notice that she is sitting on the toilet stool. Yes, she always asks to sit on the potty to go “pee-pee”. Then, as soon as she sits, she asks for some toilet paper to wipe her buttocks. Needless to say that, despite the serious look, there hasn’t been any “pee-pee” yet IN the potty. It’s a start though, and I’ll take it! 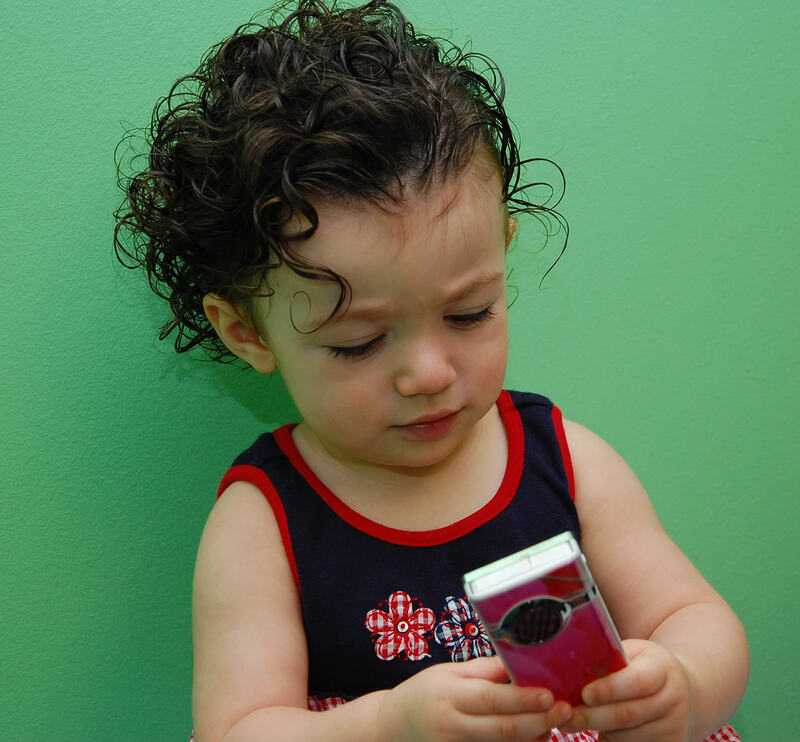 I just found this other picture of her taken last week at Sesame Place. It’s an awesome place for younger kids, by the way. Do you see what I mean by “my baby has gotten bigger all of a sudden!” She is not even a year and a half yet in this one! Happy to be band free and round headed again! 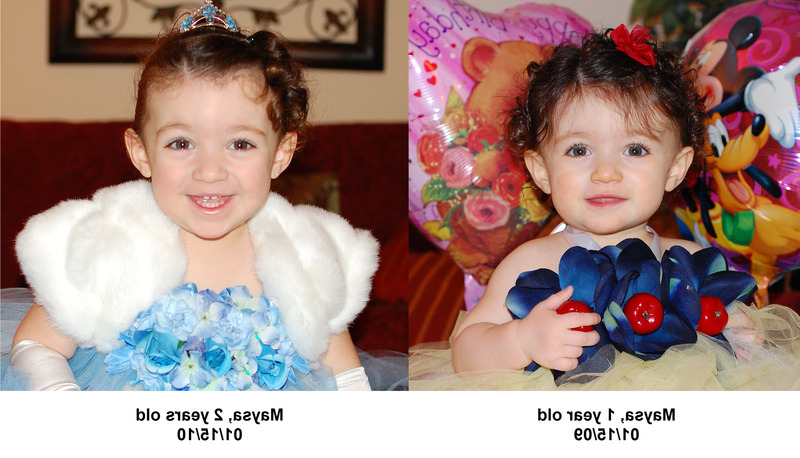 I went back to Cranial Technologies to take the side by side pictures of Maysa’s first, second and fourth DSi side by side. 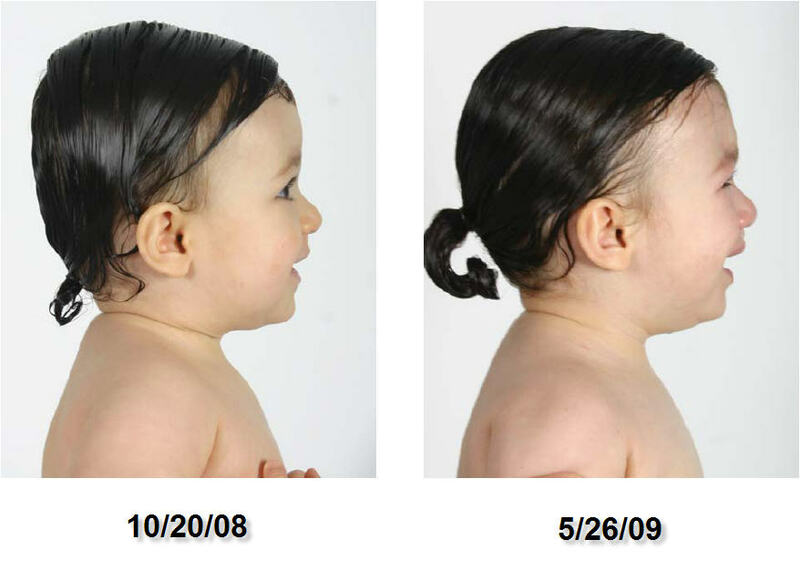 In this first set of pictures, notice how the light reflecting on the back of her head has gotten bigger. 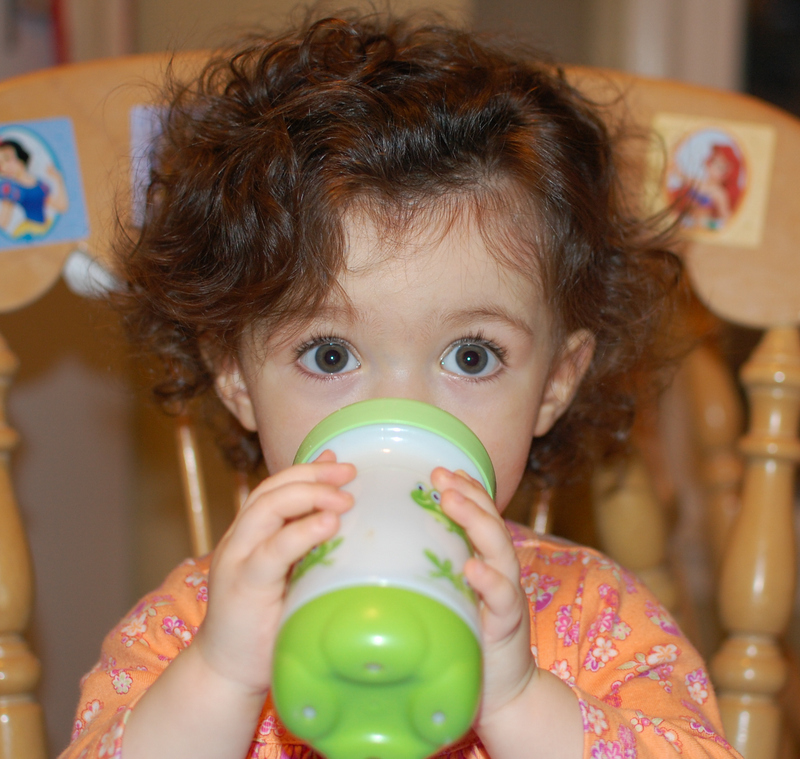 The bottom back of her head looks a little bumpy but that’s because of her curls. We couldn’t tame them very much. In this second set of pictures, notice how her head got longer, eliminating the wide aspect of it. The last DSi is a little bumpy again, because of the curls, but notice how much longer and rounder it is in the bottom back. Here too, notice how much rounder her head is in the back now. Alright, I just received Maysa’s last Photo Study from Cranial Tech. Besides the fact that she cried her lungs out, she looks fabulous to us! My favorite shots are the top view and her right profile. 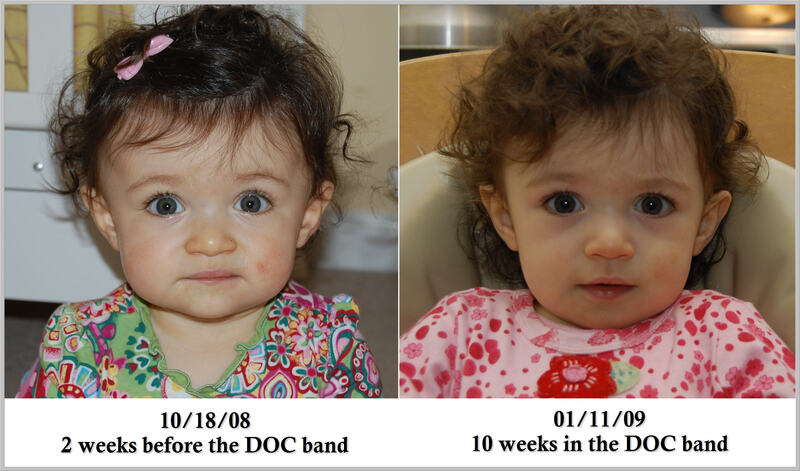 The pictures on the left go back to 10/20/08 prior to her first DOC band. The ones on the right were taken yesterday on 5/26/09. We are absolutely positively extremely happy with the results, the service, the people and their professionalism and everything that is somehow connected to the beautiful round head of our little girl. We can’t thank you enough. Even my husband who at first was skeptical is now amazed at the results. Again, thank you! Maysa has graduated but I am not quite done posting. There is more to come. 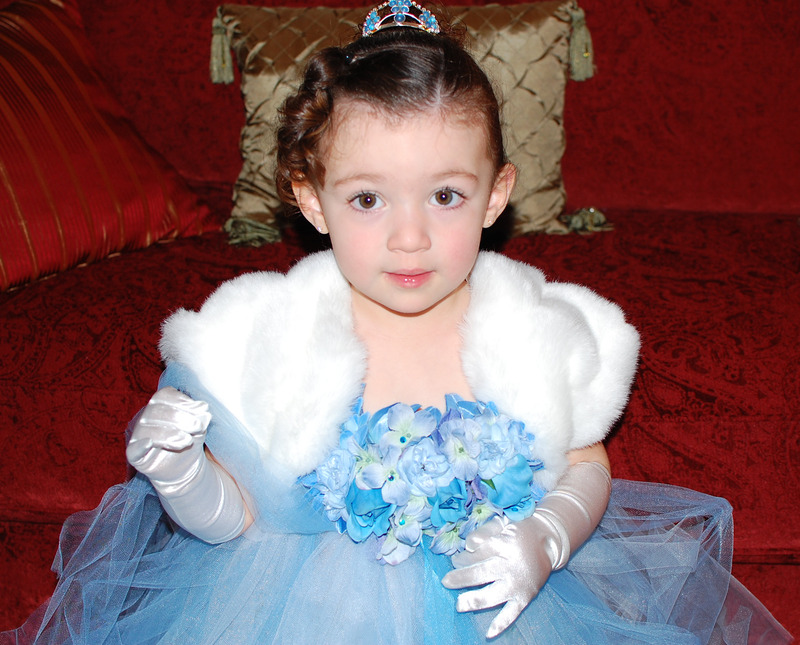 I am heading back to CT to take some of the side by side pictures of her three DSi. I will be posting those in time. I also have other things to share but I need time to put it all together so patience! We are spending our last weekend in the band. It’s almost unreal. 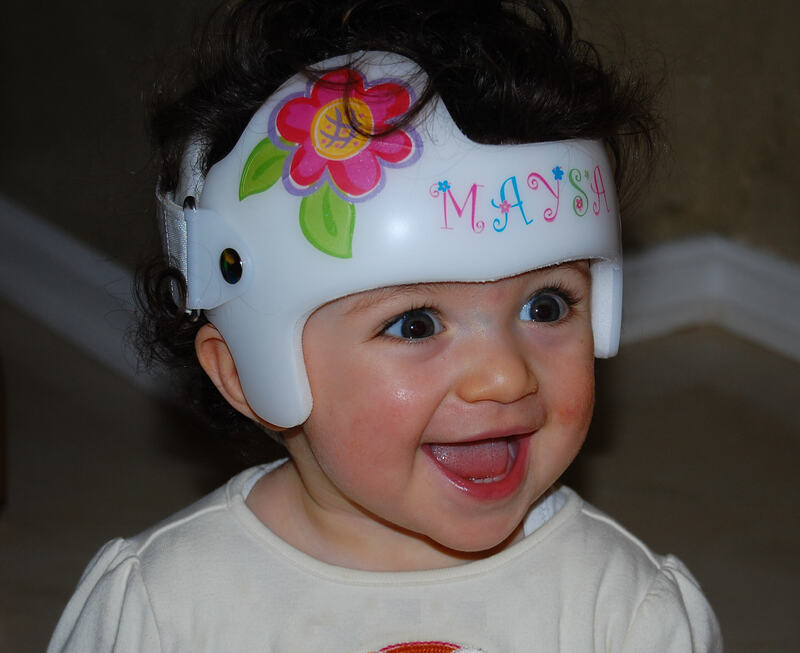 According to wolframalpha, Maysa has been in under treatment for her plagiocephaly/brachycephaly for 327 days, or 46 weeks 5 days, or 10 months 23 days… I don’t know too many kids who’ve had to wear a helmet/band for such a long time. Maysa has been such a trooper! Yesterday, we went to the park. I wanted to take as many pictures as I could. There seems to be a little bit of nostalgia settling in already about not having her in her band although we are ALL so ready to see her out of it! Quite contradictory, isn’t it? Anyway, here are a few pictures of her having fun in her band. She gets it off tomorrow! Maysa’s graduation from her second DOC band is fast approaching and I have been looking at several of her pictures from when she was much younger. Well it doesn’t get younger than this. Here are two pictures of Maysa below. See how perfectly normal her head looked from this front view: not wide, not asymmetrical, not cony (her hair is sticking up a little, but that’s all), and look at her ears. Where are they? They are so flat against her head you can hardly see them. I will be posting other pictures of her showing how her plagio and especially brachy altered her appearance throughout the months. In the meantime, on the right is a picture of her now. Her head looks wider and her ears kind of stick out, but it is not as bad as before she got treatment through the DOC bands. The DOC bands really helped, I believe. Not only did they stop it from getting worse, it made it so that she actually looks better. 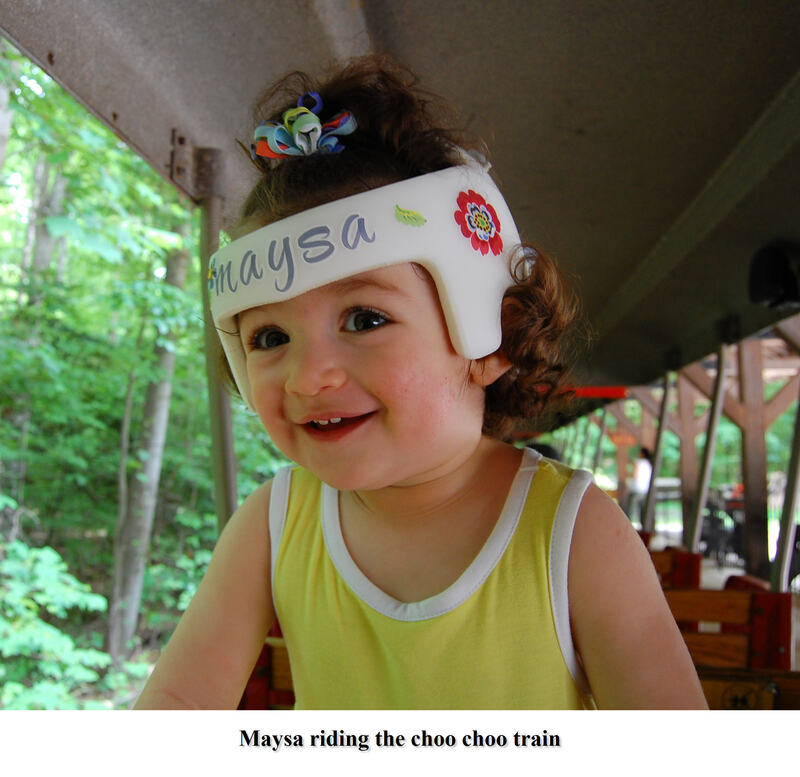 Here comes another post about Maysa’s progress thanks to the DOC bands she wore for the past few months. Pictures like these were a challenge to take each time. Being able to take a top view picture showing both ears was hard at first but is even harder now that her ears don’t stick out as much. However, they have helped me keep my sanity and they’ve all been worth it. After a beautiful weekend, we woke up to rain this morning. I thought that traffic was going to be bad but we actually got to our appointment with Amber at Cranial Technologies right on time. We are always seen right away and I’ve loved that about them right from the start. Amber came back and had shaved off the foam all the way to the plastic shell. I truly didn’t think that we were going to get all the way down to the plastic shell before the end of the 16 weeks. I am extremely happy with the results we got, with the fact that Maysa’s head will be free again after almost 11 months, with the fact that no one will ever be able to tell that there was ever anything wrong with her head shape. I am so glad we were able to treat her with the DOC band. Her next and last appointment is scheduled for May 26th. They will again take pictures of her, do another DSi and hand measurements of her head. I will be posting about that for sure! 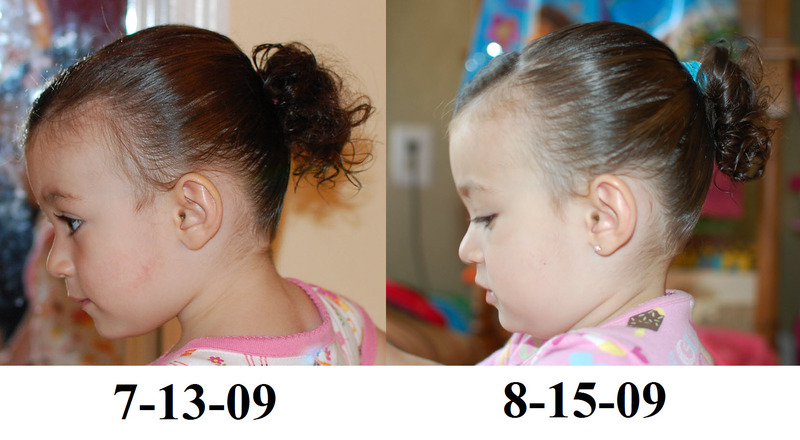 I do want to add that I outlined both pictures and trimmed them (including Maysa’s pony tail in the 5-09-09 picture) so no one would be distracted by the background. The DOC band rocks! 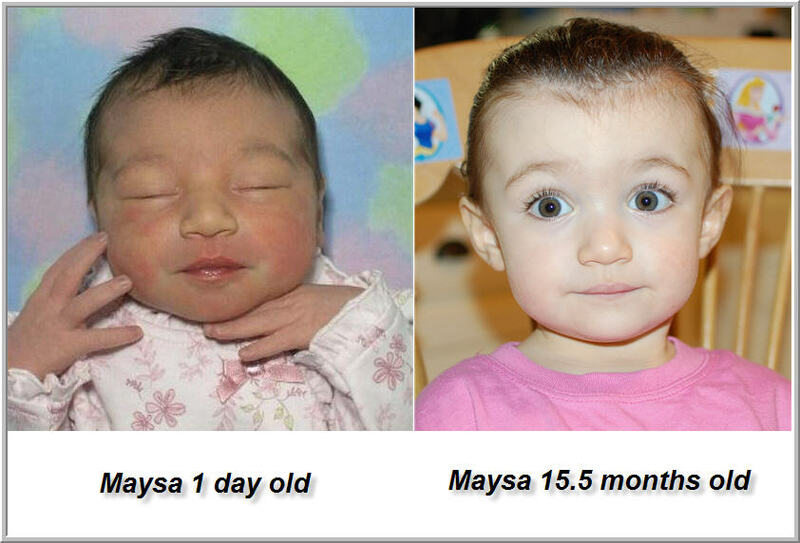 Here is another comparison picture of Maysa. 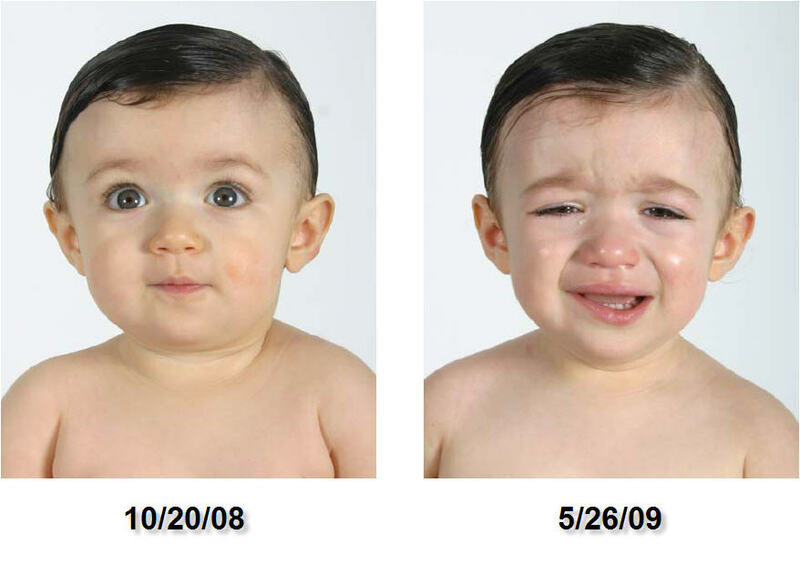 On the left, she was 9 months old, awaiting her first DOC band. 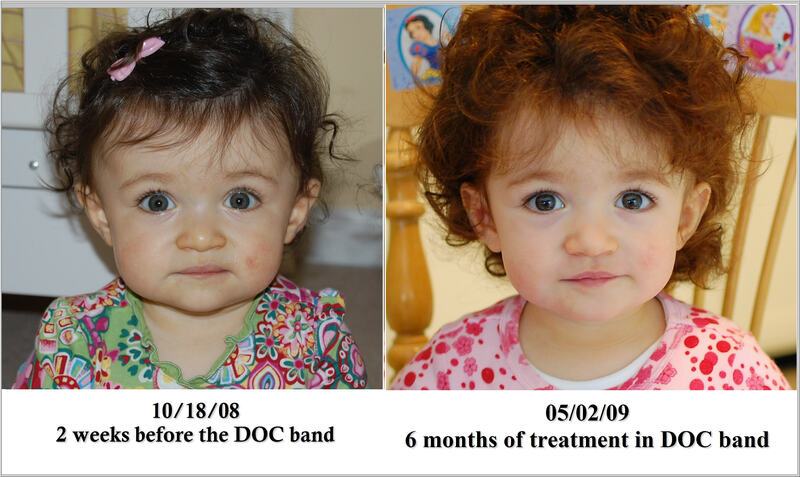 On the right, she is 15.5 months old, six months into her DOC band treatment. I couldn’t be happier that we switched to the DOC band after the failed passive helmet she wore for 3.5 months. Now, her head doesn’t look so wide above her ears anymore and her ears have straightened up a tiny bit more. Thanks to Melanie (one of my online Plagio parent), I now understand why I wasn’t coming up with the same measurements as those from Orthomerica. 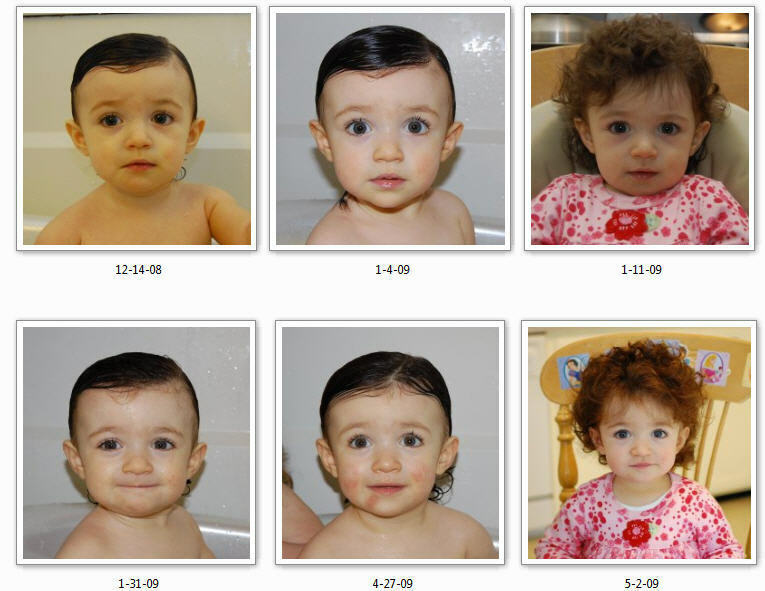 Back when Maysa got her first scan from Orthomerica, the part where her head was the widest was right at the center horizontal line of the graph. Her head was also the longest at the center vertical line. I always though that the cephalic index was taken by measuring those two lines, no matter whether they were the longest or not. Apparenlty not. Melanie explained to me that I have to measure the widest width on her head as well as the longest length. Since she’s been in the DOC band, Maysa’s widest width has moved down below the center horizontal line (which is what should happen as the head should be wider in the back rather than the front of the head) and that’s why I was getting different numbers. So… After I took my ruler again and remeasured her width in the right spot, I basically came up with the same numbers. Her last CI was a little better using the ruler: 92.68% as opposed to 92.99%. I also looked back at the two pictures from Tim’s report and the CI I came up with in the sliced view was 92.4%, so quite comparable after all. The CI I got from the whole top view of her head was more like 89.7% which tells me that her head still comes out more on the top back than the bottom back by a few millimiters. This said, I am still really happy with the results we got this far. Thanks Melanie for clarifying things for me! Maysa went in for another adjustment today. Amber saw us and was accompanied by a colleague from the Connecticut Office. Of course, I can’t remember her name. I am so bad with names… We briefly talked about Tim’s report and how neat it was looking at things from a different perspective. She asked me how happy I was about Maysa’s progress. I told her that I WAS happy. After the disappointing results we got from Eastern Cranial Affiliates, and the actual improvement in Maysa’s headshape since the DOC bands, I HAVE to be happy. I thought long and hard about asking Amber once again about shaving the band on the back right side, but after looking at Maysa’s head from every possible angle I truly can’t see the “5mm” plagio that’s still left. If I can’t see it while knowing what I am looking for, then nobody else out there will either, unless it’s an extremely observant plagio parent or a orthotist. I think that a lot of it has to do with the fact that her head is no longer flat in the back. It is now round. It has a curve that hasn’t been there since she was about 6 weeks old. Amber gave Maysa a little more room in the band by shaving a little more off of it. I believe that she only shaved the middle back right side of it but I am not sure. Really, all I did was take a cm ruler and measure the length and width lines on the graph from Orthomerica to obtain the CI. Have you STARband people tried that before? I know that it’s completely silly to be competing with computer technology, but I felt so good being able to measure her CI at 91.7% by measuring her graph. 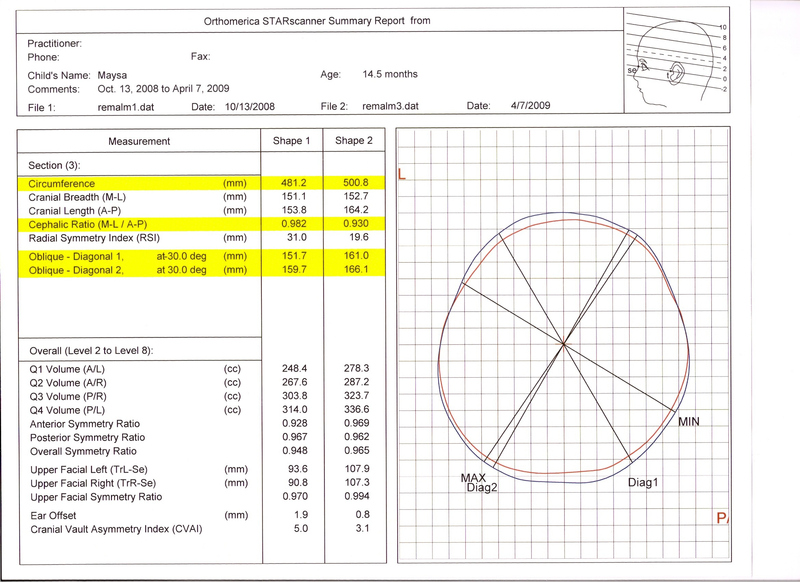 It is also closer to the 91.25% I measured on the picture from Tim’s report from Cranial Tech. I’ll add to that that this is really what I feel her CI is at this point: around the 91% mark. Also, we have one more adjustment left scheduled for May 11th. In four weeks we have our exit appointment. It will be right around Memorial day weekend, a day to remember. 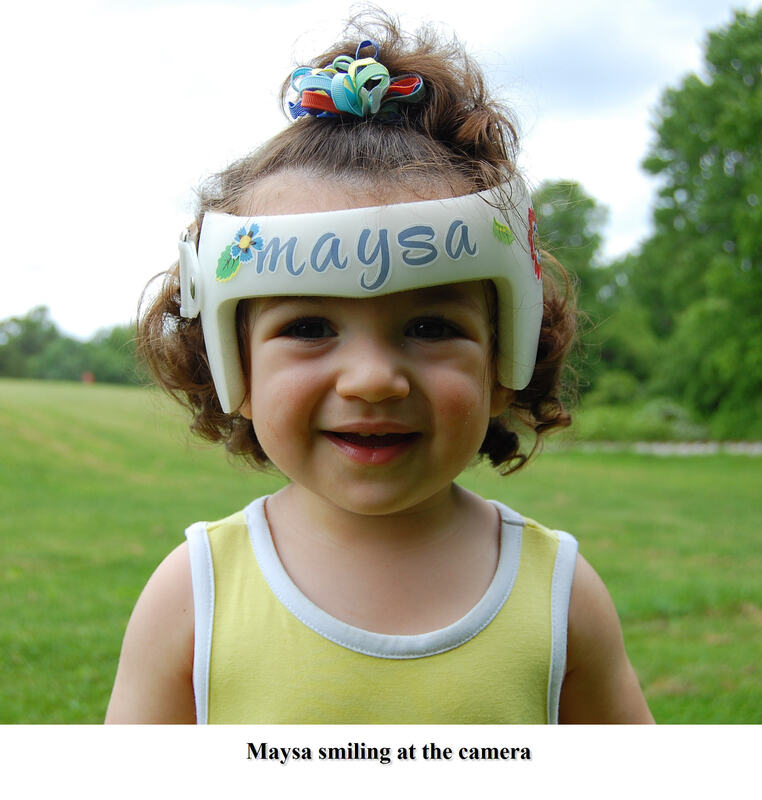 Posted in Cranial Technologies, doc band, Maysa, Pictures | Tagged: Annandale, brachycephaly, circumference, Cranial Technologies, ct, doc band, DSi, Maysa, measurements, plagiocephaly, Tim, Virginia | Enter your password to view comments. When Tim emailed me his report on Maysa’s progress, he also asked me not to post it online for reasons that I choose not disclose. I have asked him if I could post some of the graphics that he included in it but again he wasn’t in favor of that. I really wish I could. I have been extremely happy with Maysa’s progress since she’s been in her DOC bands and I owe Cranial Technologies so much. They have turned things around for my daughter and I am forever grateful to them. This is why I cannot post his report. In my next entry, I will be posting the report but it will be password protected. I will share it with family members and close friends. Maybe, someday, when this type of information is readily available to all CT patients I’ll be able to make it public to all. I haven’t forgotten to post about Tim’s report. It was very informative and allowed me to view things from many different angles and perspectives. I will post more, later, in an update. She also told me that “Tim” hadn’t had a chance yet to review the mid DSi but that, as soon as he did, Amber would give me a call. Maybe today, maybe tomorrow. I just want some foam to be shaved off that back right side to bring down her plagio numbers. We are starting week 11. We have 5 weeks left in the band. In this one, I am actually getting upset because she is splashing water all over the bathroom and at the camera while I am trying to take pictures of her. SHE, on the other hand, thinks it’s the funniest trick she could pull on me. Look at her smirk! 8:00 AM this morning, Maysa and I go in to see Amber. She (and the whole world) knows that I regularly take Maysa to Orthomerica for scans and I’ve showed her previous ones before. I briefly explain to her what Laura Plank showed me on the graphs yesterday and I express my concerns to her as to the fact that the numbers seem to say that her plagio has regressed by 3mm while in fact I was hoping they would be at 0mm. 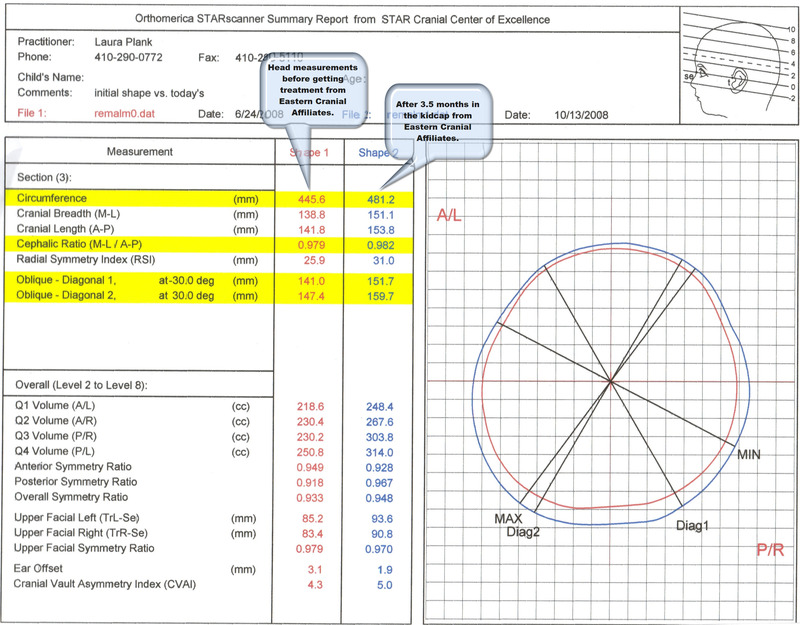 We also talk about her Cephalic Index (CI) although that one didn’t get worse. She honestly says that she is not apt or qualified to read the scans but that “Tim” (I forgot his last name) who is their tech guy in Arizona has asked her to go ahead and do a mid DSi of Maysa’s head so he can analyze the data better and comment or act upon it. This is the first time they do a mid DSi so I do feel a little weird about it, but at the same time I appreciate how they are listening to my concerns and going the extra step to help address them. I need to know that I (and everyone else involved) is doing everything possible to help my little Maysa. Am I a mother or what??? Talking about being a mother, Amber’s daughter also wore a DOC band for a little while so we had a little chat about the fact that she still sees the imperfections in her head shape and that I will always see them in Maysa and others as well. 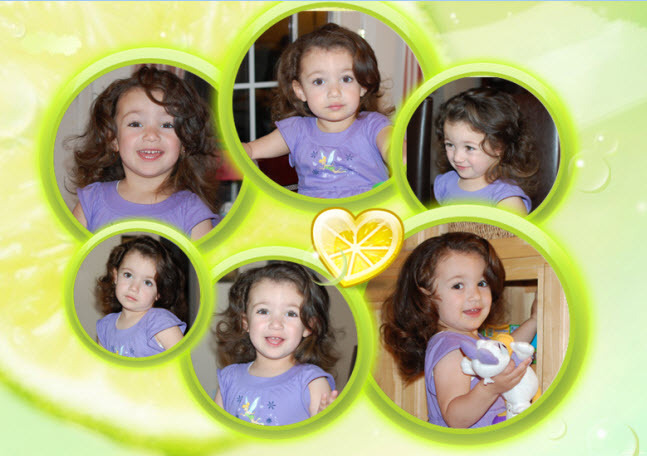 She just wishes that her daughter had as much hair as Maysa. I totally understand that at this point, they can only help and not fix and that sooner or later, I’ll have to come to terms with it all. I know that, but we have 5.5 weeks left in the band. Let’s make the best of it! I probably won’t hear from Amber or Tim until early next week. How many more gray hair do you think before then? Of course, I will keep you posted! Alright, so here are the two reports I got yesterday. The first one shows the comparison between January 5th and April 7th (3 months difference). Just so you know, Maysa got into her second DOC band on February 2nd. The second one shows the comparison between October 13th and April 7th (almost 6 months). Maysa got her first DOC band on October 31st. I have to say that I am very happy with the fact that her width has practically remained the same and that her growth has mainly been in her cranial length. 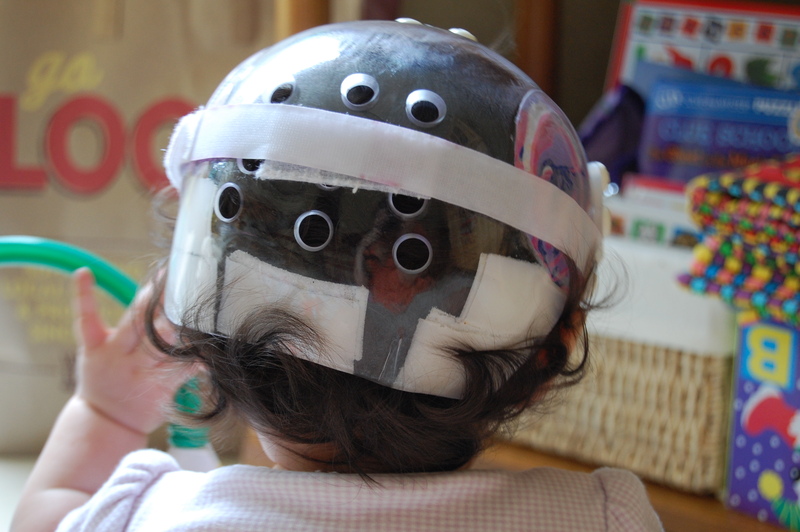 According to another report, the first passive helmet she was in did nothing to keep her head from getting wider. The DOC bands did. Thank you CT team! What a pain, what a pain… You’d think that Maysa is my first child, but no. She is my second and I worry more about her and this plagio plague than about anything around. At least for now. Remember how I told you that I was taking her for another scan at Orthomerica today? Well, I was able to take her yesterday instead (impatient me) and my head has been spinning ever since I got her latest report. Before I get started on the report, I want to say something about Laura Plank, the orthotist at Orthomerica in Columbia, MD. Love her a lot. She is wonderful. Not only does she do and take her job seriously, she is also extremely caring. When you talk to her, you know that you are also talking to the “Mom”, not just the specialist, and that means a lot to me since most people don’t quite relate to the struggle we are faced with for the rest of our little ones lives. She is positive too and will get you to focus on the brighter side of things… Yet, I am worried and once again ready to battle this curse. Laura tells me that her growth is slowing down and that her sutures are probably starting to fuse. She says that considering her age and the 5.5 weeks left in the band not to expect much more improvement. This is basically it. Feel my frustration. Help me get through this. I am loosing my sanity! I’ll be posting the reports in the following post. I am still puzzled over this. This morning, Maysa was up first, so I got her ready first. She was in such a good mood this morning, singing, dancing, babbling… Anyway, after changing her from head to toe, I put the DOC band back on her head and put her in her crib while I go and get her sister ready for school. She has the music on and she usually likes looking at herself dancing in front of the mirror while standing in her crib. Well, after maybe 5 or 10 mn, I go back in to check on her and she is holding her band in her hand and waving it at me! The velcro is still closed all the way and I am sure that there is no way she could have opened it. I know that she sometimes pulls down at it to the point where the front of it covers her eyes but for her to pull it completely off! After talking to Amber, she reassured me by saying that sometimes, as they get older and stronger, babies manage to take the band off without necessarily opening the velcro. She said that she must have pulled at it really hard because her holding points were still holding tight. She also said that she’s had parents who would find the band laying besides their sleeping baby in morning when they went to wake them up. I am not worried. She hasn’t done it again, so far! We are starting our 9th week in our second band. Once again, Amber shaved off a little more foam off of Maysa’s helmet. You go girl!!! She is growing like a weed and walking so fast now, I think she’ll start running tomorrow. It’s like Spring has sprung. I am so happy for her. Her head is really looking round now and she has been such a trooper through it all, even when things looked glum. 7 weeks left in the band… We see Amber in another two weeks. I see the light at the end of the tunnel. Today, Maysa is starting her 7th week in her second DOC band. Considering that the band is good for a maximum of 16 weeks, she is pretty much half way done with it. Only 8 weeks left. Wow, she’s been in a helmet/band for 8 months and she now has 8 weeks left… It’s almost unreal but for some strange reason, 8 weeks seems like an eternity. I am ready for the Spring, for cute dresses, sandals, shorts and tank tops, and for curly hair in the sun and butterfly bows. 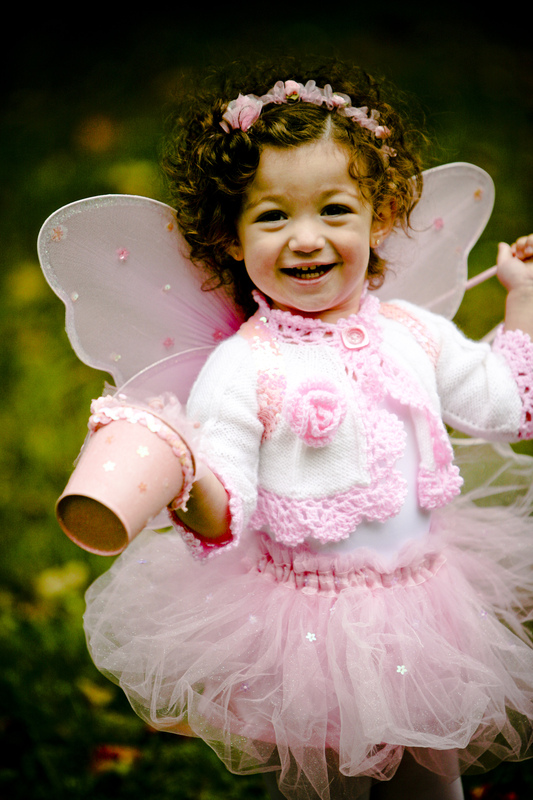 I am ready for her to enjoy being a little girl like all other little girls. I am ready for her head to not feel so itchy or sweaty when the band is off. I am ready to let her have as long of a bath as she wants to have. I am ready to not watch when the hour is up. I am ready to let her hair dry at its own leisure. I am ready to see her eyes and not the band cover them when she looks up. I am ready to run my hand through her beautiful hair and kiss her head without fear of being bruised. I am ready to start taking pictures of her and not her in her band. I am ready to put it all behind us and spring ahead. Can’t you tell I am ready! This said, I am so glad she is still wearing it. Maysa is starting to take a few steps on her own and I can’t tell you how good it is to know that her head is not just rounding out but also safe at the same time. Amber at Cranial Technologies and everybody who works there, we owe you! Ok, back to the present time. Amber placed a little stocking on Maysa’s head and felt the back of it. She compared it the mold and once again she said that her head had rounded out even more. She left us for a little while and shaved it out a little more. When she came back she said that the texture of the foam felt different and that it took her longer to shave off the foam. I wash Maysa’s hair with DOVE and that’s the only way I can get it to smell good. Also, there are times that when the hour is up, Maysa’s hair is still kind of damp. I don’t know if that has anything to do with it. I asked if the band was OK and Amber said yes. We have another appointment on the 30th. No comment. Just my own opinion and a picture that speaks for itself. We actually made it to our appointment half an hour early and were therefore seen about 20 mn early. Amber felt Maysa’s head and said that her head was rounding out really nicely. That only confirms what the way I’ve been feeling about the way she looks. She shaved off the foam a bit more and we are scheduled for another adjustment in two weeks. We were scheduled to see Amber this morning for another adjustment. Instead, we stayed home and Cranial Technologies called to say that they would be closed. That’s a good thing because the snow accumulation was really high and we also had gusty winds. We are rescheduled for tomorrow 9:30 AM. I just called Orthomerica this morning. 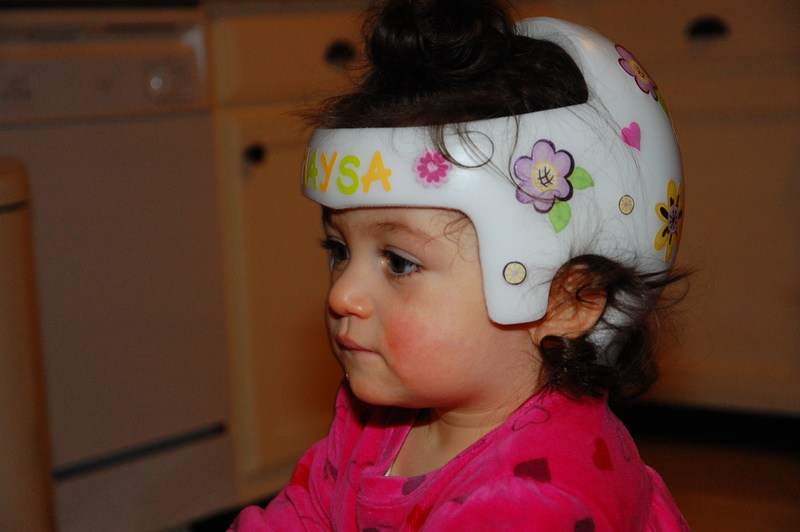 I scheduled another appointment with Laura Plank to have her scan Maysa’s head once more. She will see us on April 8th. I can’t wait to see what her head shape looks like on paper and what her numbers will tell us then. The last scan she got was on January 5th. Pray with me that her brachy is well below 90% by then. 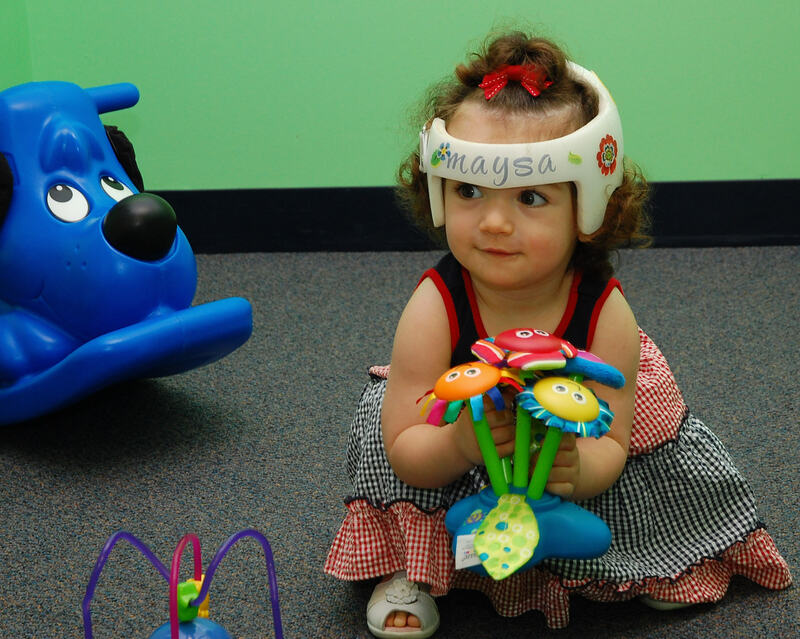 Maysa had an appointment yesterday with Amber at Cranial Technologies. She’s been in her new band for two weeks and is doing great. The first week following her initial fit, the band slipped down her eyebrows quite a lot. I constantly had to readjust it. The week after that, it just stopped. It only happens if she pulls at it. Anyway, Amber drew a square on the foam in the middle back part of the band and said that from now on that was where they would shave off the band. Like I said in a prior post, the foam is really thick and this band is really curved out in the back compared to the first she wore so seeing her shave off some foam out of there is giving me hope that her head will keep rounding out even more. I caught myself looking at her in the past 3 or 4 days during the hour that the band is off and telling myself how good her head looks to me now. Really. Before, I couldn’t help but notice the sides of her head sticking out and the flatness in the back, especially the back right side. Not anymore. She really looks good to me now and I don’t feel so self conscious for her anymore. Also, I admit doing something I am not supposed to do: I placed Maysa’s helmet on her 3 year old sister the other day, and guess what? It fit (almost) as well as it does on Maysa’s head. That tells me that if we hit some good growth spurts in the next couple of months, Maysa’s head will really look great once again. We see Amber back again in two weeks. We had an appointment with Amber this morning. Since the second band that Maysa received on Monday is only meant to treat her brachycephaly, the protocol is a bit different. Monday and Tuesday we checked for red spots every 3 hours and for two nights she had to sleep without the band on. That was strange. Seeing her in the morning standing in her crib was quite a sight. Her hair was going in every opposite direction on her head, you would have thought that a tornado had passed through. Too bad we are always rushing in the morning or I would have captured it on camera. DOC band 1 looks cuter. I liked how it had that cap going over the right side of her forehead. I always liked decorating that spot first. It also fit better right from the start. DOC band 2 allows me to hold Maysa’s hair in a fountain at the top of her head. It doesn’t get all sweaty after getting trapped under the cap like with the first band. Also, DOC band 2 to is much rounder in the back. Really, if Maysa’s head rounds out that far and that much, there would be no brachy left in her. Another thing I like about DOC band 2 is that the top back of her head is completely covered as in keeping her head from growing upwards in the back. In short, I like the curvy design of the first band, but I see the great potential of band 2. Of course, I will post pictures when I get a chance, and yes, I am still working on uploading that video of Maysa’s DSi. 8:00 AM this morning Maysa had an appointment with Amber. We went to get her second DOC band. I am so excited for her, I couldn’t sleep last night. Well this time, I brought the camcorder and the camera. Amber was kind enough to let me videotape and take pictures of the two DSi Maysa has had and now, I get a chance to post them on her blog. 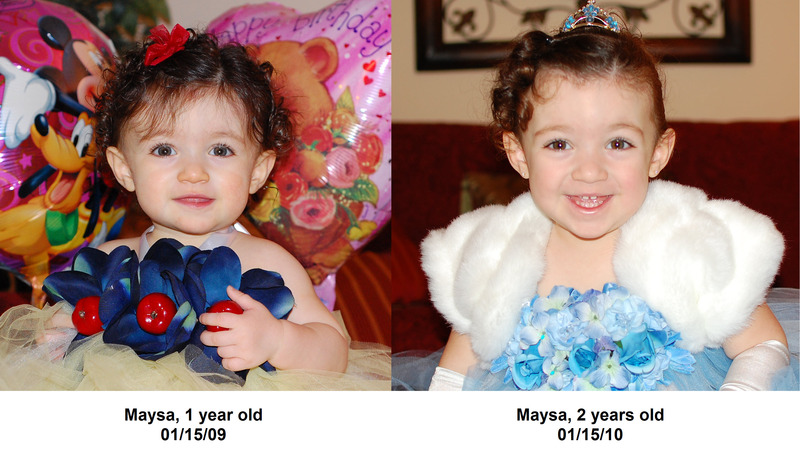 For some strange reason, the two DSi side by side don’t show, in my opinion, how much Maysa’s head has grown in length. However, it has and the pictures below will show it better. Now, you’ll agree with me that this angle shows how her head has filled out at the base of her skull. The reflection of the light and the shadow make it so obvious. Also, notice that her head seems narrower. In this one, you can also see how her head doesn’t look so wide. Her head seems to have grown upwards which in turn balances things out. Ok, so now we are talking. Bye bye flat spot on the right side. I am so glad to see you gone. I won’t miss you either. So now, let’s hope that the second band, which looks different, will bring even more positive changes to my little Maysa’s head. We had two appointments back to back today; one with Frances Demmerle, the DO and one with Kara Kiernan, Maysa’s initial PT. The visit from the PT was a lot more fun. 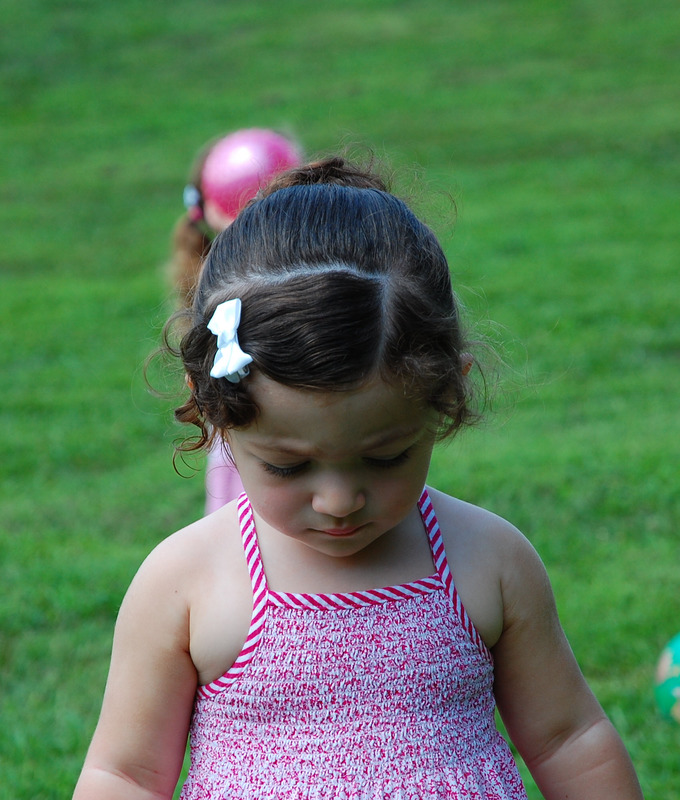 She came to Maysa’s daycare and first observed her. Maysa is very social and didn’t mind her presence at all. She gathered some information and from what she saw and heard was very pleased with the progress she’s made in such a short time. Just so you know, Maysa didn’t start rolling over until close to 9 months of age. She didn’t start crawling until 11.5 months but ever since has been pulling herself to a stand. She also will stand on her own for a few seconds and cruise around the couch or the ottoman at home. She is also trying to climb up the stairs, scary! 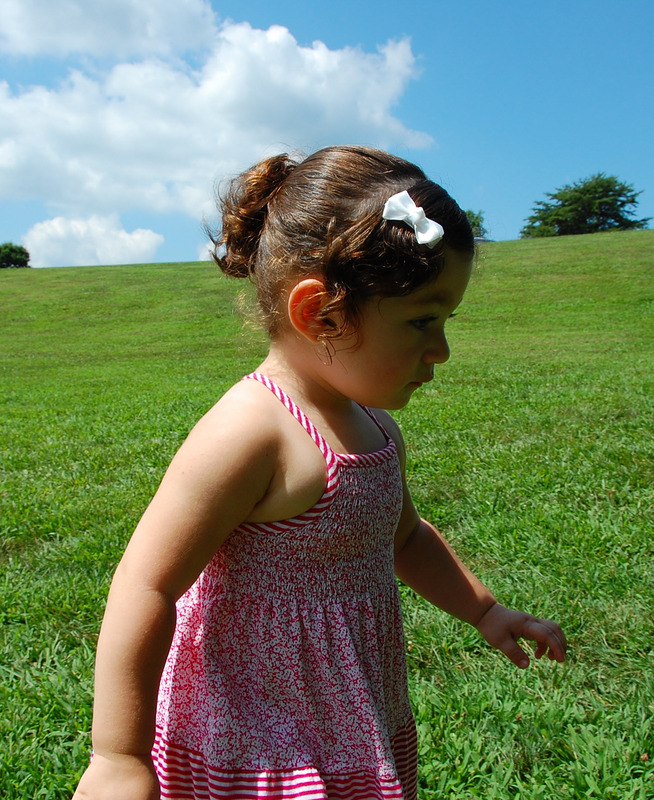 Today, she was babbling, humming, going up and down the slide, crawling, walking with help, pulling herself to a stand. It really seems like all of a sudden she doesn’t need physical therapy. 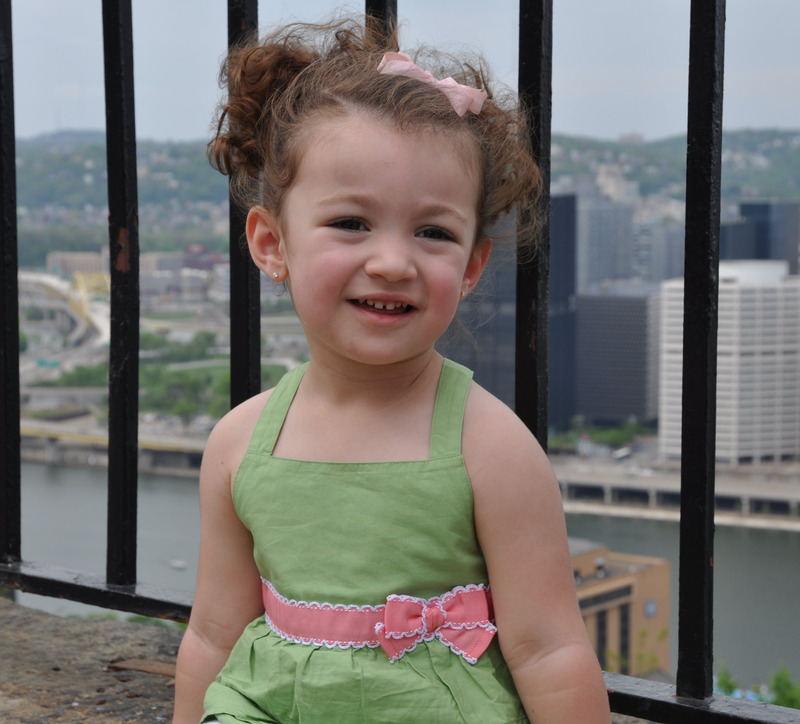 When she was first evaluated, just two or three weeks ago, they put her at 9 months old for her gross motor skills. Today, the PT told me that she was right at the 11 months mark, which is great! She thinks that she can still benefit from physical therapy and she is now putting us on the waiting list for a specific PT for Maysa. I have a feeling that she will be walking before that PT sees us next. That’s the news for the day. We had our appointment at Cranial Technologies today in Annandale, VA. Maysa has been in her DOC band for 11 weeks now. A second one was approved by our insurance, Kaiser Permanente, and looking at the progress that she’s made thus far, why not go for a second one? I had really wanted to videotape Maysa’s second DSi and brought my camcorder with me. My husband had assured me that it was ready for filming. Well, once I got there, I realized there was no disk inside! Arrrgh… I did feel a bit silly! Maysa did cry during the DSi. Having that little sock over her head wasn’t her thing, plus, she wouldn’t sit up which made things a little harder. Her long hair was also hard to tuck in under the sock. Her sister, Soraya, came with us today and was really good. She did tell me that she felt sad, though, to see Maysa cry. How sweet! Amber and her team got it after a second try and the drama was all over. I really liked looking at the comparison between the two DSi. Her head has rounded out quite a bit (ok, a lot) at the bottom. The right profile shows it the most and I couldn’t be happier. The top view also shows that she has gained some length. Really, this whole experience with Cranial Technologies has been fantastic and so uplifting. Our fit appointment is scheduled for February 2nd. Amber suggested that I bring my camcorder (with a disk this time) and that I could record the difference between the two DSi on their computer screen. I’d love to do that and share it here on her blog. I’ll just have to make sure that the camcorder IS ready for filming this time. My little MaySnow White turned one this week. We got to celebrate this weekend. She is just so precious. 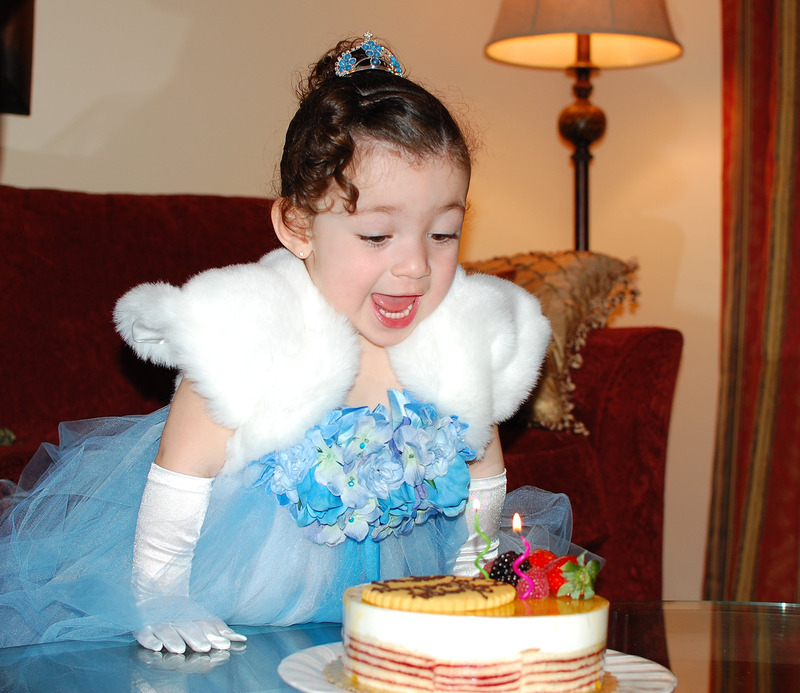 Many thanks to Mariann of http://www.lulubirdboutique.org/ for making this Snow White inspired tutu dress just for her and to the Pastry Shop of Alexandria for their excellent tasty cake! 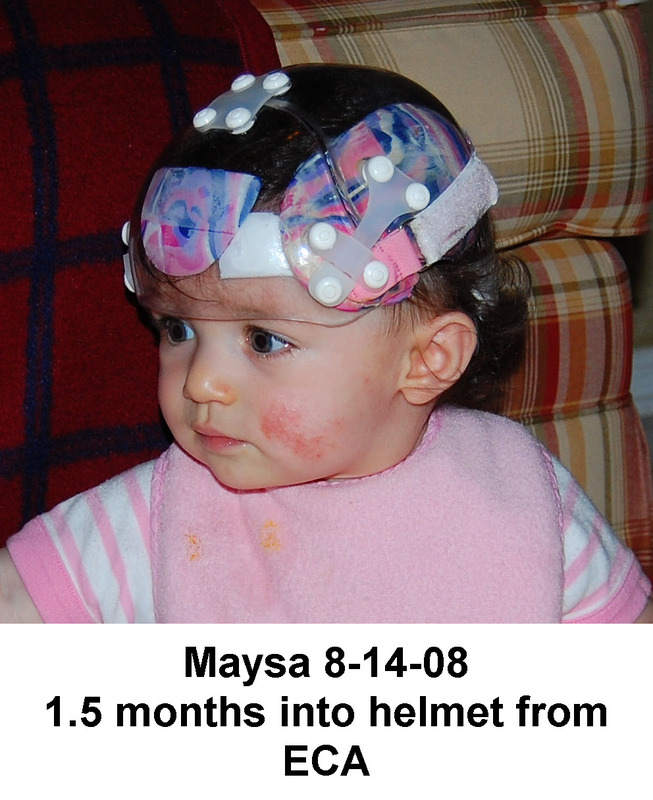 Would you believe that Maysa was in a previous helmet from another company for 3.5 months in the picture on the left? I took her out of it for good reasons. Look at her head width back then. It looked so wide and so deformed. That helmet didn’t seem to work for her. Looking at her didn’t spell progress, in my opinion, and neither did the numbers on the graph. Look at her now, 10 weeks into the DOC band. It’s amazing how more proportionate her head looks… It is too bad we didn’t switch earlier, yet I am glad that we did switch when we did. Kaiser approved our second DOC band. Hooray! I am so happy; I can’t find the words to express myself! Kaiser Permanente is now covering our second DOC band in full after initially sending us a denial letter in the mail. The letter also gave the name of the doctor who denied the claim, Dr. Gregory Alexander, his phone number and address. Another paragraph also states that our pediatrician could call a number to discuss our case and request a reconsideration on our behalf. First things first, I try to call Dr. Alexander and leave two messages on his voicemail but I never hear back from him. The third time I call, I get him on the line. He explains to me that the reason why he denied the claim is because he couldn’t read the numbers that CT faxed him. He also said that he asked for new copies but that he never heard back from them. I then contact Sandra Vatalaro. She tells me that Kaiser never tried to contact them. She then emails me all the paperwork she faxed them. I print them out and fax them to Dr. Alexander along with the scans of Maysa from Orthomerica. I attach to that a letter explaining things a bit further. I also contact my pediatrician via email and ask if she would request a reconsideration on our behalf. I also fax her all the documents I faxed Dr. Alexander and then I wait. The letter said that I should receive an answer within 10 days of submitting the request. 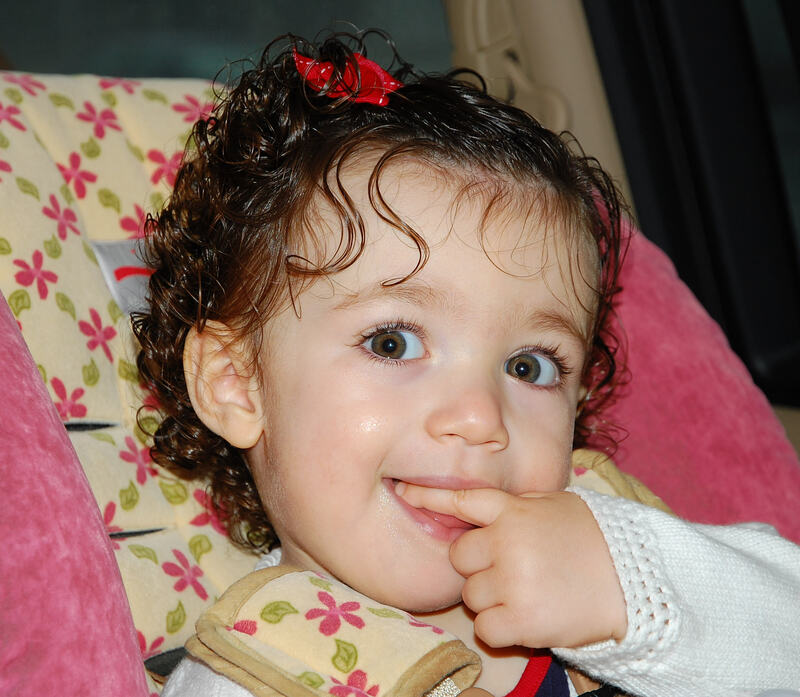 Today, 01/13/2009, I get a call from Tammy, Dr. Alexander’s assistant, with the news that after reviewing the documents I faxed them, that the doctor has approved a second DOC band for Maysa. I am just so so happy, so happy for my Maysa! 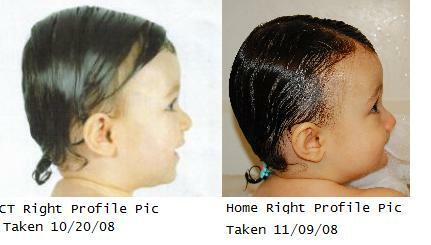 A few months back I posted on the Yahoo Plagio Group about a bump that started popping out on the back of Maysa’s head. It started the size of a pea and is now the size of a knuckle. You certainly cannot see it because of her hair but you definitely can feel it. I remember mentioning to her previous orthotist about a dent in that same area while she was in her passive helmet. He assured me that it was just a imprint like those left by the elastic of a sock on an ankle and that it would go away once she would be out of the helmet. I always thought that the padding on that lower right corner of the helmet had something to do with it, like it was digging a hole in her skull, but he didn’t think so. Well, it looks like the dent led to a bump and it grew bigger the moment we got her out of her passive helmet. We mentioned it right away to Amber from CT who at first thought it was a lymph node but then thought that it felt too hard. I also took her to Kaiser to have it checked out and posted a message on the Yahoo Plagio Board again, but nobody could tell me exactly what it was. At Kaiser, they just told me that it didn’t look too serious. Well how reassuring is that? I wasn’t satisfied with that answer, so her pediatrician referred us to a neurosurgeon, John Myseros, in Fairfax, VA.
One more thing: John Myseros was absolutely against helmet treatment for plagio/brachy. He said it was all purely cosmetic and that in no way did the shape of the skull affected the functionality of the brain or any other parts of the body. I could barely place a word, he was going on and on about it… He told me that Maysa looked fine to him. I said, well, she started with a CI of 98% and he said: “So what?”. At that point, I knew there was no use talking to him about plagio or brachy anymore. The first one was taken on 6/24/08 during our initial evaluation, when we were still trying to determine what she actually had and if she would benefit from helmet treatment or not. 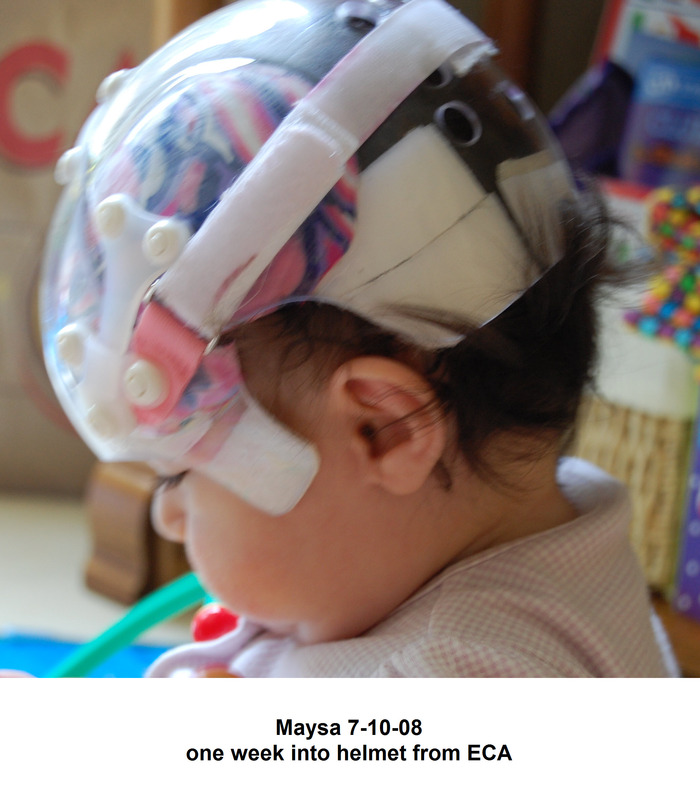 The second one was taken on 10/13/08 back when I had doubts about how well Maysa’s passive helmet from Eastern Cranial Affiliates was working for her. I let you be the judge, but in my opinion and looking at the report itself, the helmet didn’t do anything about keeping her head from growing on the sides. It didn’t correct her plagio at all either. In fact, Laura Plank from Orthomerica, explained to me that looking at both scans, both her brachy and plagio got worse. The third one shows how she’s progressed since she’s been in the DOC band and since we’ve done CST. Her plagio is now within normal range at 2.1mm and her brachy has gone down from 98.2% to 93.2%. There you have it. Love the DOC band and love the Starscanner a lot! As happy as I am to see how Maysa has improved in her band, I can’t help but feel sad deep inside for the time we wasted in her passive helmet and for what I see as not only a lack of improvement but regression as well. According to her third scan taken yesterday, her plagio has gone down from 8mm to 2.1mm, and her brachy from 98.2% to 93.2%. 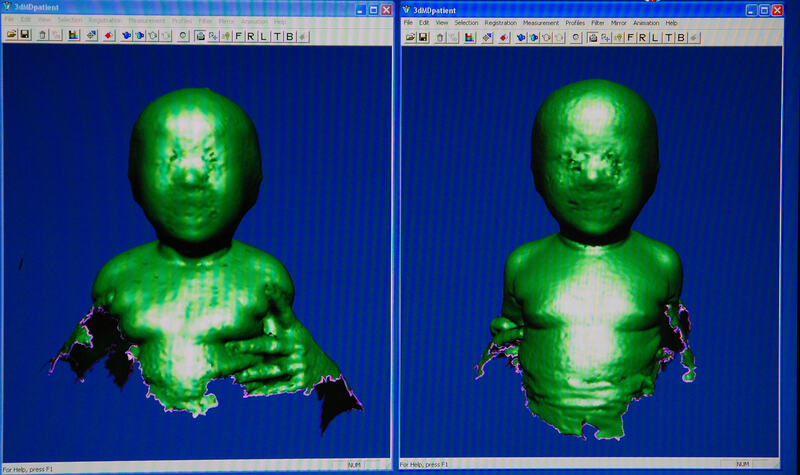 She’s only grown about 1cm in circumference between 10/13 and 01/05 but basically her asymmetry is gone. What am I sad about then? With a cephalic index of 93% Maysa still has brachycephaly (although mild, Laura Plank said) and in my opinion could benefit from another band. I so want her to get below the 90% somehow. Why should we stop trying now while things are going so well? If she’s improved by 5% after nine weeks of treatment, couldn’t we see another 5% of improvement in another band? I know that her growth is slowing down but she is not quite 1 year old yet and so many babies start at that age and even later with good results too. She doesn’t mind the band. Family is supportive and I could care less what people say or think when they see her in her band, really. I took Maysa to her third scan on Monday to Orthomerica in Columbia, MD. I couldn’t wait for my 2 o’clock appointment to come. I made it there on time. There was no traffic, and Maysa slept for the entire hour it took me to get there. We went in. She scanned her. She showed me her report. Thank you for putting my mind at ease. Although I have known from the start that the DOC band was doing what it’s supposed to be doing, I just had to see it on paper in numbers and shape. I took Maysa to Cranial Technologies on Friday. 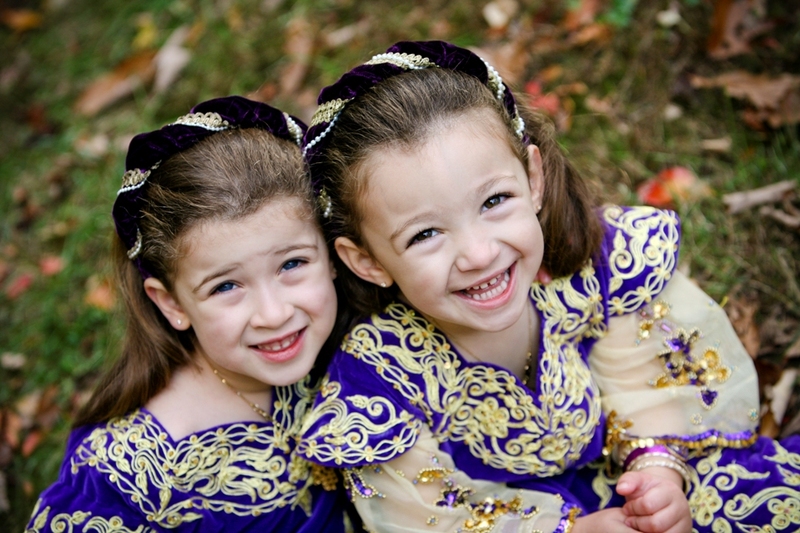 Her older sister, Soraya, came along. She is a restless, talkative three year old and I didn’t get to interact much with Amber. In short, a little bit more was shaved off of Maysa’s helmet. Amber also told me that depending on her future growth she has another one to two adjustments left before she is out of it. I doubt if Kaiser is going to pay for another DOC band so we have to make up our mind soon on whether or not to go for a second one. 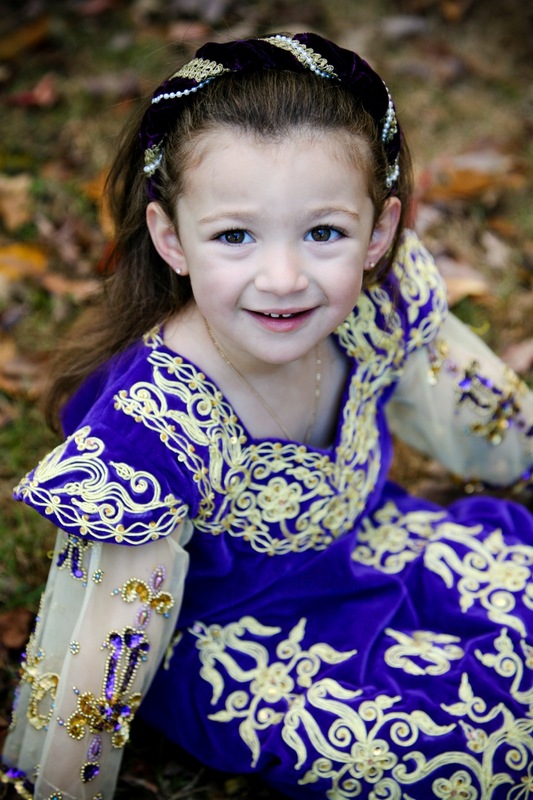 I am going on Monday to Starcranial Orthomerica in Columbia, MD to get another scan of her head. I can’t wait to get more accurate measurements. 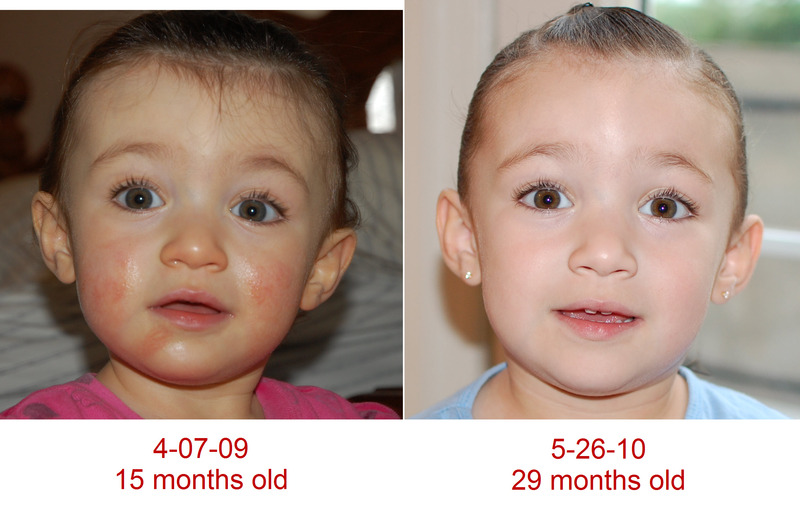 Also on Friday I took my oldest to her 3 year check up and with me I took Maysa’s progress pictures from CT to show the pediatrician. She barely glanced at them and acted as if she really didn’t care to look at the progress she’s made. She is one of those who don’t really believe in helmet treatment and who told me from the start that her head would round out on its own. She only gave me a prescription the first time because I broke down crying out of frustration back in October when things were looking grim after many months of trying to do something about it to no avail. Needless to say that I am ticked off. 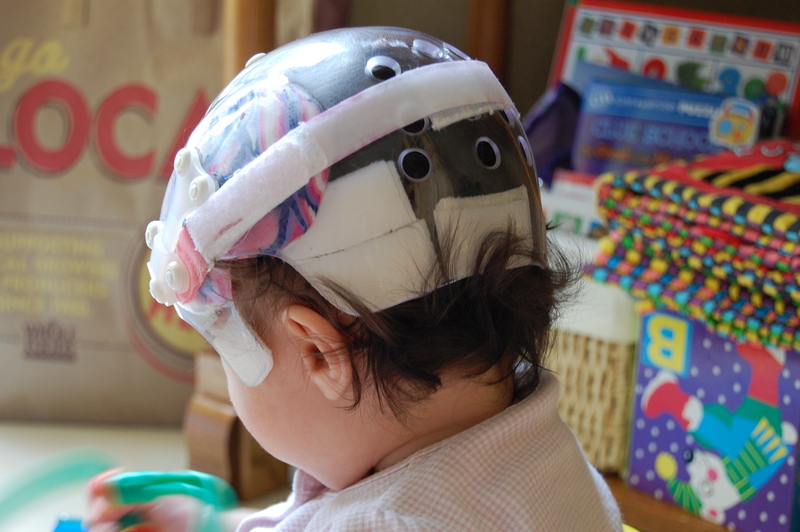 There is something wrong with the pediatricians denial and non-chalence about treating plagiocephaly across the country, I wonder if they get penalized for prescribing helmet treatments to patients! I took Maysa to her 4th cranial sacral therapy treatment this morning. She was cranky. Well, she’s been cranky for the past few days. I think that she is teething again. She hasn’t been eating or sleeping properly lately and those two areas are usually not a problem. Anyway, Frances spent a good 40 minutes doing what she does best using her hands and a great deal of concentration. Maysa was annoyed and cried for the most part. She didn’t want to lay down on her back. Oh! By the way, she has been crawling forward since this past Wednesday. I am so happy about it. She is 11 and a half months and at that age, most babies start walking. Mine, is shyly starting to crawl forward… What a milestone! I printed out for her the progress pictures I got from CT and was very pleased with the results as well. We are scheduled for another visit on 01/21. Maysa has been wearing her DOC band for a little over 7 weeks now and I am so happy with the results so far. Yesterday, I took her to Cranial Technologies for another check up and to get her progress pictures and measurements taken. I wanted to post an update on her blog right away but I only got her photographs this aftenoon via email. The measurements, although manual, look really good. According to Amber’s measurements, her cephalic index (CI) is now down to 90% and her head width actually went from 143 down to 142. Again, the measurements are manual and 1mm is no big deal, but at least her head hasn’t gotten wider. Anyway, her right profile shows her progress the best. 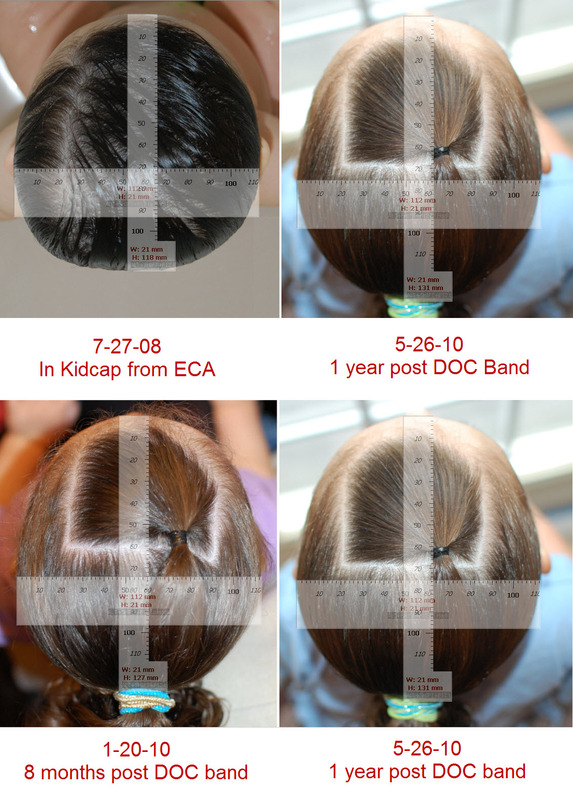 In the first set of pictures below, you’ll see her right profile from before and while in the DOC band. In the second set, you’ll see the same pictures but without the pony tail. I had to trim it so I wouldn’t get distracted by it. I can’t stop staring at them! I did the same thing with her left profile pictures. Removing the pony tails helps see the progress she’s made a little better. In the pictures below, the progress is a little less obvious but it doesn’t surprise me. When she originally started to wear the band, there was space where I could slide in my finger towards the bottom left side of her head. It has filled out in the past 7 weeks she’s been in the band and Amber never shaved anything off of that side. I think that her goal is to even out the two back sides of her head first (correct the plagio) and then allow for more growth in the back to correct her brachy. Anyway, I couldn’t be happier. Amber told me that she would probably be in it for another 5 to 6 weeks. I really would love for Maysa’s CI to go down to 85% or below. If we get to that point, I would be beyond myself and forever thankful to Cranial Technologies. Below are all of the progress pictures Cynthia emailed me. We have another appointment with CT on 01/02. 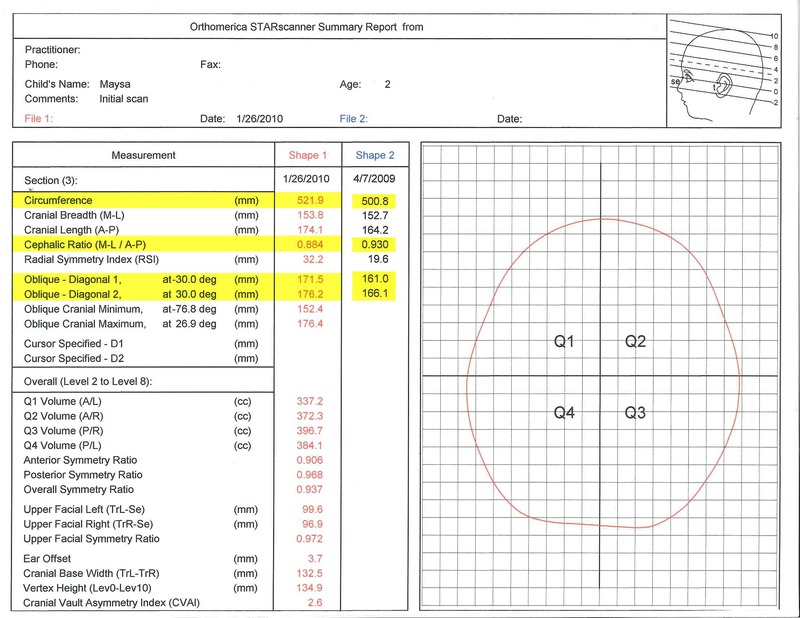 I will also be taking her to Orthomerica in Columbia, MD for yet another head scan on 01/05 (I just have to be able to compare her head shape now with the scan she received on 10/13 using more accurate tools). On 12/29, we also have an appointment with our DO, Frances Demmerle, for another Cranial Sacral Therapy. Phew! Happy Holidays! Is it still an optical illusion? Ok, so I was finally able to find two pictures that I can put side by side and compare. What do you think? Is it still an optical illusion or does her head look less round above the ears and consequently less wide? Right after we saw Amber at CT on Monday we took Maysa to Frances for another CST appointment. She did what she usually does: she uses her hands and puts pressure on her head, back, hips and rib cage. She said that Maysa still felt quite tense to her and she would like to see her in another two to three weeks. I was hoping that we were done but then again, Maysa’s head has been reshaping so well. Is it strickly the DOC band? Is CST truly helping? I will never know for sure, but I am trying hard to use all options available. One more thing, Maysa’s stress moves have come back full force. It’s quite a site and I really don’t know what to make of them. 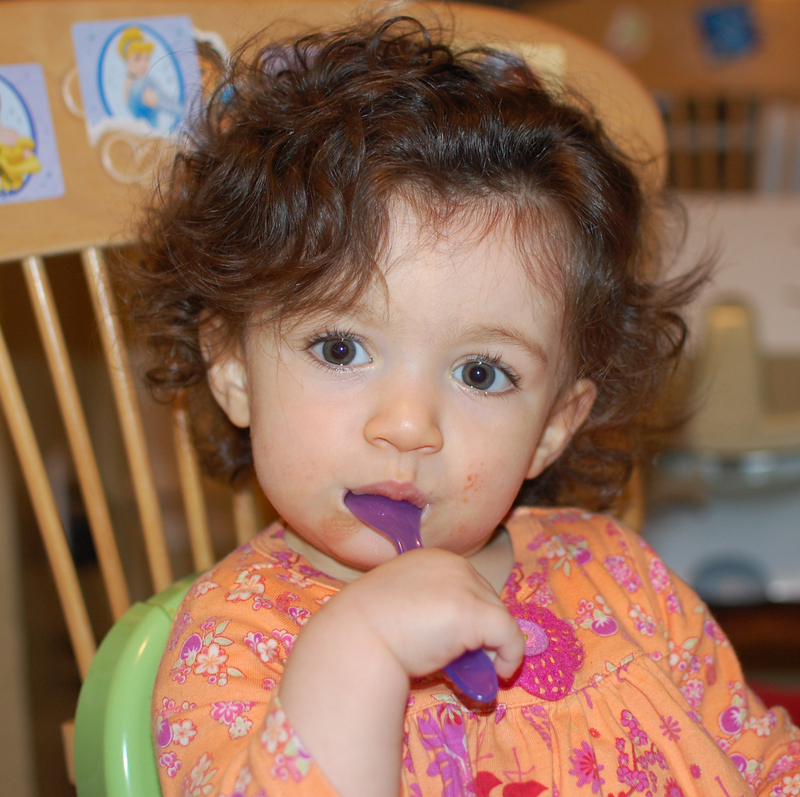 She crosses her legs at the ankles, if she is sitting on her high chair, she holds on tight to the its arms, she tightens her jaw shut and she stresses… If she is on the floor or in her crib, she’ll hold on to something or just puts her fits together and look so stiff. I don’t know what it means but it doesn’t seem right. My husband and I took Maysa to Cranial Technologies on Monday for another check up. I gave Amber the headsickle back to Amber and asked her why is it that the band didn’t quite fit properly on it. First of all she told me that I shouldn’t be putting it on the headsickle. Apparently it weakens the band and consequently makes it less effective. I didn’t know. Lesson learned. I won’t do it again. I promise. This said, I did post some pictures under a former post showing how the band looks on the head mold. You can clearly see that the side where the strap closes looks odd. The top view also shows how the band is not snug against the mold. In short, she also explained to us the band is actually made from a different mold and that this wasn’t a good way of looking at things. What she said did make sense and I feel horrible for trying to make the band fit on the mold. So if you are thinking about doing this at home, just don’t. 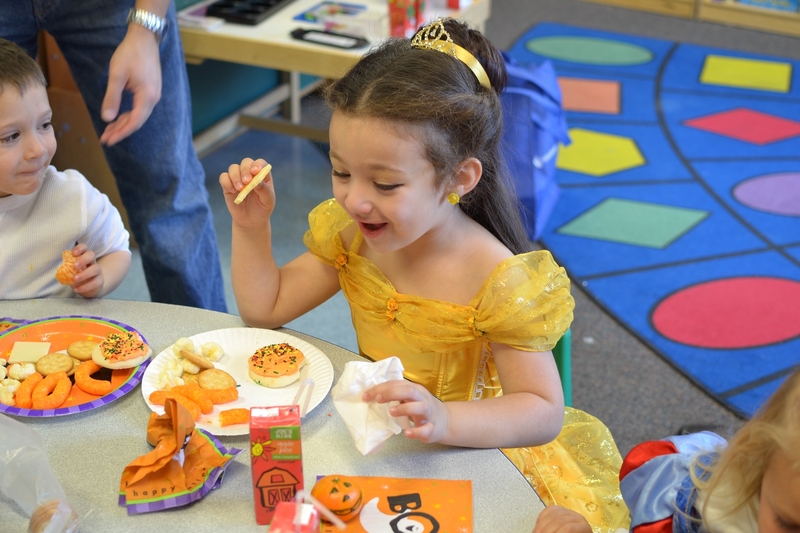 On a happier note, she also told us that Maysa was making faster progress than anticipated for her age. She told us that she would probably not be in her band for more than an additional five to six weeks which would bring her to a total of two and a half months in the band. We expected her to be in it for four months! We have mixed feelings about it. We know and can see that she has made good progress. Her right profile shows it the most. Also, looking straight at her, her ears don’t look bent outwards anymore as if while the band held her head on the sides right above the ears, her facial features from the sideburns/jaw down have expended in width which in turn makes her head look more proportionate. I know for sure that the band is working for her but I also believe that Cranial Sacral Therapy has something to do with her making such good progress so quickly. This said, I don’t think that she is within normal range yet or even close. CT will take progress pictures and measurements on 12/22/08 for us to look and compare. Anyway, I will post some more pictures later. I took Maysa in this morning to her second cranial sacral therapy appointment with Frances Demmerle. She worked on her for about half an hour and noticed right off the back that she didn’t look so stiff. She asked if I had noticed anything since our last visit and the truth is I have. Aside from the fact that Maysa has been doing so well in her DOC band since she got it three and a half weeks ago, I have also noticed some changes in her that I can only attribute to CST. Ever since Maysa turned 3 months old, she started stretching her legs at a 45 degree angle, crossed at the ankles then her arms at the same degree angle while holding her hands together and she would rock them up and down with her teeth/jaw clenched and breathing hard through her nose. I really wish I had a picture of her that I could show you. Anyway, at our last appointment, Maysa got into that position while Frances was working on her. I had never seen any baby doing that before my daughter and neither did Frances, but she said that after her first session of CST, she might actually stop doing so. I really didn’t think she would stop. Maysa had been doing so for 7 months, everyday, several times a day. It made changing her diapers quite a challenge because she would always stretch and cross her legs at the ankles. Try putting a diaper on a baby like that! Anyway, the next day after our first visit, Maysa did the same move almost ALL day long. It was a little scary, I mean everywhere: on her high chair, on her exersaucer, on the floor, in her crib, in the bath tub, you name it. I thought to myself, what has happened!? When I asked Frances, she told me that when she saw her in that position she looked stressed out and like she said she hoped that whatever work she did on her would help her relax to the point where she wouldn’t do it again. Well, like I said, she hasn’t done that in days now. Another thing I noticed is that Maysa sleeps so much better at night and during the day. Her daycare provider sometimes tells me that she sleeps for three hours in a row, sometimes more. At home, she went from waking up two to three times at night to only once to nurse, and then she goes right back to sleep. Is she just growing up or is CST really working on her? I don’t know but I like to think that it is. Today she worked on her as well, but Maysa was a little fussier. She usually goes right back to sleep after waking up for an hour in the morning and Frances was messing up her schedule. Frances started with her lower back and hips, then her upper back and then her head. Maysa wasn’t a happy camper today and she looked more irritated than in pain, to me. When I asked Frances about what she thought about Maysa’s progress, she said that her head and her body now feel more like a jellyfish rather than a hard stick… I never thought I would compare my daughter to a jellyfish but funny enough, I like that idea a lot. Our next appointment is in two weeks. I will keep you posted. I took Maysa in yesterday to Cranial Technologies because she had a pink spot on her back left side and Amber wanted to take a look at it. It turned out to be nothing to worry about, which is a good thing. In the process, we talked about her progress, how to measure it, and how to take pictures. To help me with that, she offered that I take Maysa’s headsickle home with me. I was a bit surprised. I didn’t think I could, so when she said “sure of course”, I gladly took it. I have to be very careful though because she warned me that it could break. Anyway, the first thing I wanted to do with it is put the band on it to see how different the fit would feel. Well, the band does not fit properly at all. I cannot close the velcro the way I close it when it’s on Maysa’s head, and it’s been shaved twice already so in my opinion, there should be more room. 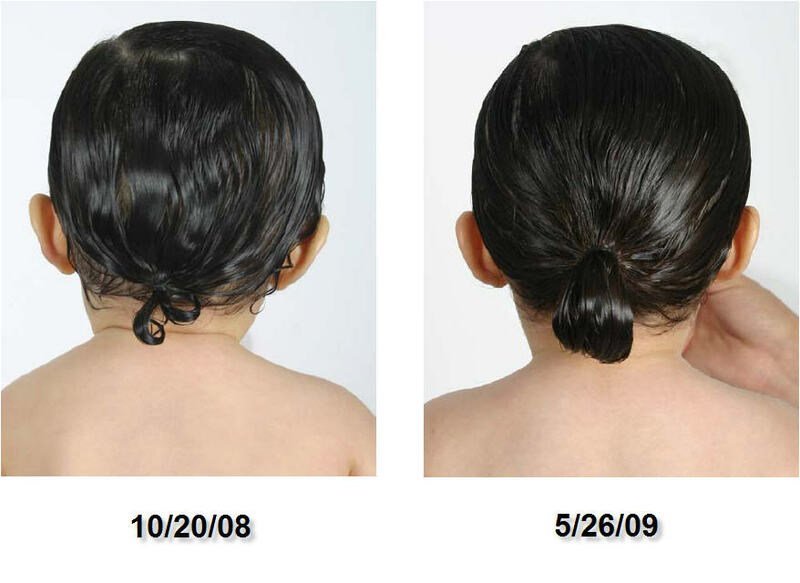 I am a little confused by it because I had seen somewhere else online how some other parents had been taking pictures of their little ones headsickle in the band throughout the process to see in which way progress was being made. Shouldn’t the band fit on the headsickle? I will take pictures tomorrow when I take the band off of her head and put it on the headsickle to show you what I am talking about. I took Maysa to Cranial Technologies this morning in Annandale, VA. As always, the staff there is so welcoming and professional and always right on time. We saw Amber again today and she came in with Maysa’s headsickle a little white stocking cap and her chart. Maysa’s hair is growing so much that it’s hard to see anything unless it’s completely wet or under that stocking cap. I asked for one so I could start taking pictures of her at home in places other than the bathtub and Amber gave me one. Amber was very pleased to see that Maysa’s head is truly rounding out, and so am I. It is looking so good I am beyond myself. After trying to wiggle the band a little bit while on her head, she agreed that she needed another adjustment. She left us for a moment to shave off some of the foam and came back with it to place it back on her head. I asked her about the caps (or the parts of the band that partially cover the top of the band) and she said that they are there to hold the band in place so that when you put it on, the helmet doesn’t fall down more than it’s supposed to. I didn’t know that! She also said that it helps the rest of the helmet keep its shape. Everything looks good. We’ll see her again in two weeks, on 12/05/08. I will keep you posted. Yesterday I took Maysa to her first Cranial Sacral Therapy (CST) treatment with Frances Demmerle. Unfortunately I had to take my oldest daughter with us. She will be three in December and yesterday, she didn’t get to take a nap. Needless to say that she was a bit restless but “good” overall. 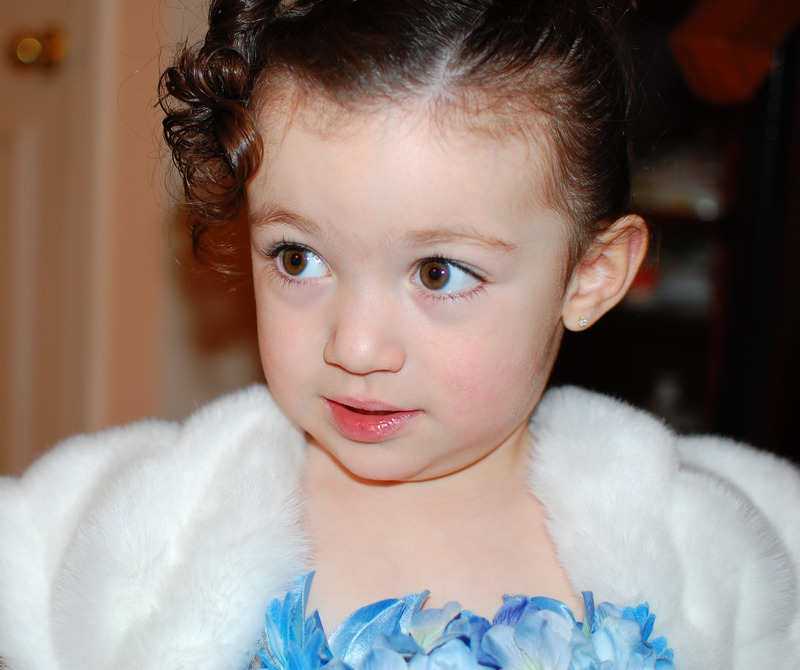 She started by asking me a couple of questions about Maysa and the rest of us and asked me why I was bringing her in. I explained to her that her combination of plagiocephaly and brachycephaly as well as the time wasted in the wrong helmet were the reasons why I came to see her. She took notes rather quickly and then took one of her pillows and put in on my lap. She sat opposite of me in such a way that the pillow was also resting on her lap. We laid Maysa down on it with her head towards me and her feet towards Frances. While trying to keep an eye on my oldest daughter, Soraya, and listening to her I didn’t realized that she had already started to use her hands on Maysa. She started around her waist. It looked like she was pressing hard but Maysa didn’t seem to mind at all. My job was to try to keep her distracted. Frances was very focused and I stopped talking to her after a while because it seemed like she was counting mentally. She worked her way all the way up her back, her rib cage and then her head. She then placed her on the long table bed. I had to make sure that she remained on her back while she had her hands on her head. She really was putting pressure but Maysa handled it very well. What she didn’t like is when she started manipulating her face. She really got annoyed but never cried. She spent most of the time on her head, twisting and turning and repositioning her hands and holding her in different positions. Maysa did very well, but I could tell that towards the end, she was ready to take a nap. After she was done, she said that she could definitely feel some restriction in her skull plates and that everything was squished together, especially her left side, and that today she helped ease that out. She also said that she loosened things in her back and that she shouldn’t feel so stiff anymore. She ended by saying that after today, with the help of the band, her skull should move more freely into a more normal position. We are scheduled for two more sessions, ten days apart each. 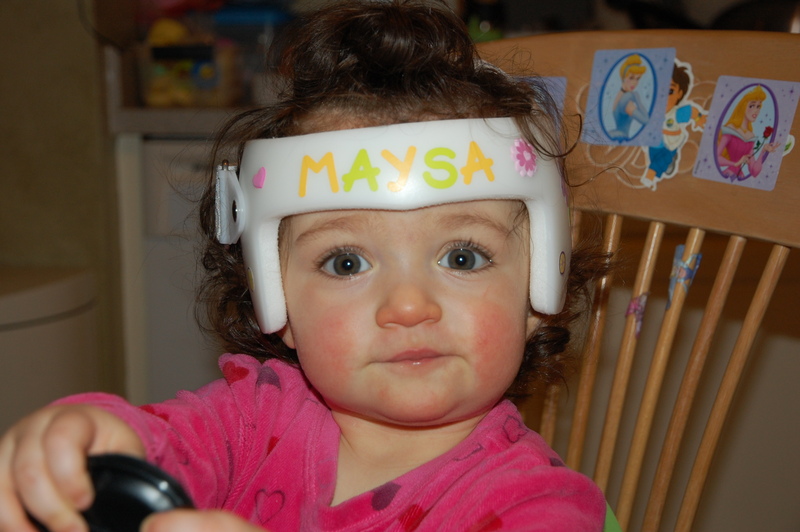 Am I seeing things or is Maysa’s head already starting to round out after only 10 days of treatment in her DOC band?